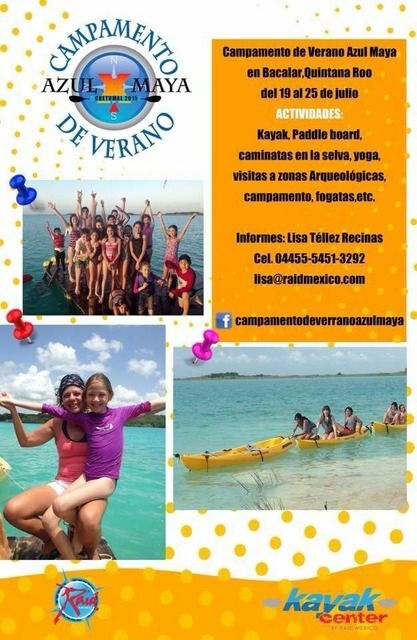 Once again, we are putting together a listing of camps and programs (cursos de verano) for children in Playa del Carmen and the Riviera Maya for the summer of 2015. These are the programs and summer camps that we have found so far for kids living in Playa del Carmen and all across the Mayan Riviera. There are some exciting new programs this year for children of all ages, both day programs and sleep over camps. Whether your children are interested in sports, nature, the arts or even a traditional sleep-over camp experience, there are a variety of options to choose from. I have not yet heard back from all of the organizations who I have reached out and I will update the list and re-post the link to the blog on the BuyPlaya Facebook page as new offerings come in. If you know of any summer camp options that we do not have listed, please feel free to send me the info at michele@buyplaya.com. 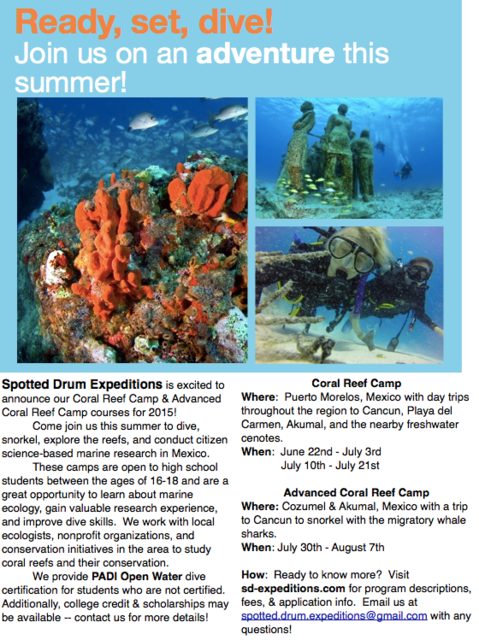 Coral Reef Camp is an exciting opportunity to immerse your teen in the beauty of the coral reefs of the Mexican Caribbean. 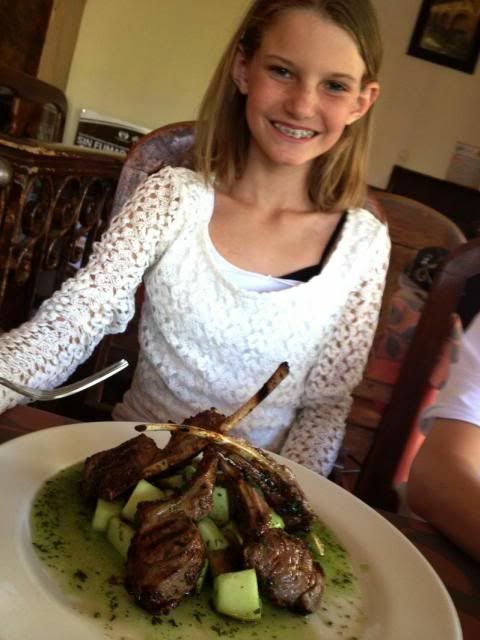 For 2015, two different camps are offered -- Coral Reef Camp & Advanced Coral Reef Camp. Both are open to high school students, ages 16-18, who are curious and enthusiastic about marine and aquatic ecology, want to learn more about coral reefs, and love the adventure of travel and scuba diving. If you are excited about exploring the ocean, scuba-diving, gaining research skills, and learning alongside a diverse group of students this is an excellent opportunity. 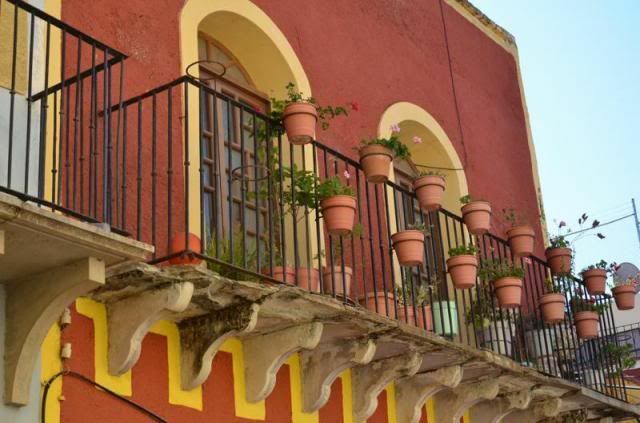 The headquarters will be a beach house only four blocks from the main square of Puerto Morelos and two blocks from the beach. 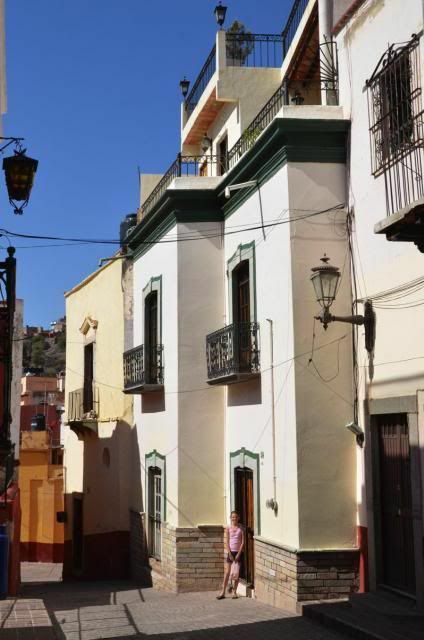 The house is large and comfortable with sufficient bedrooms and bathrooms for all, as well as an large kitchen in which to prepare meals. There is a spacious, palapa-covered patio on the top floor (with an ocean view!) for group meals and meetings and plenty of space to eat and relax when we have down time. We will do dive training at the house -- we have a pool to do confined water training, hone buoyancy skills, and practice diving scenarios. There are two sessions open this summer -- July 10 - 21 (Coral Reef) and July 30 - August 7 (Coral Reef Advanced). In both, sessions, participants will snorkel, dive, learn about coral reef ecology and make field-trips throughout the area to places like Akumal, Cancun, Playa del Carmen to explore cenotes and even swim with the migratory whale sharks. Coral Reef Camp students may take either the PADI Open Water or Advanced Open Water course and will need to arrive 3 days before the start of Coral Reef Camp. We also request that students in this class have taken at least one semester of a biology-based class (ex. biology, ecology, environmental science, etc). The prices posted above are deeply discounted rates offered to Riviera Maya residents only. These fees include everything -- diving, gear, instruction, lodging, meals, transportation, etc! The course is a great way to get kids interested in science, the natural area around them, and to meet kids from all over North America. For more information visit the Spotted Drum Expeditions website or email Megan Banka at meganbanka@gmail.com. Want your kids to experience the traditional "sleep-over" camp like you did as a child? 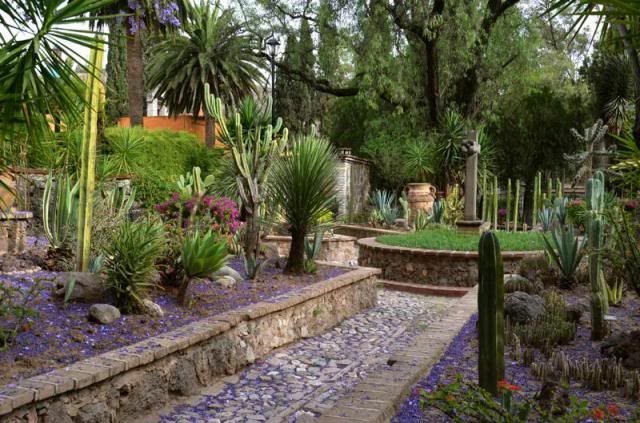 Check out Camp Agua Azul! 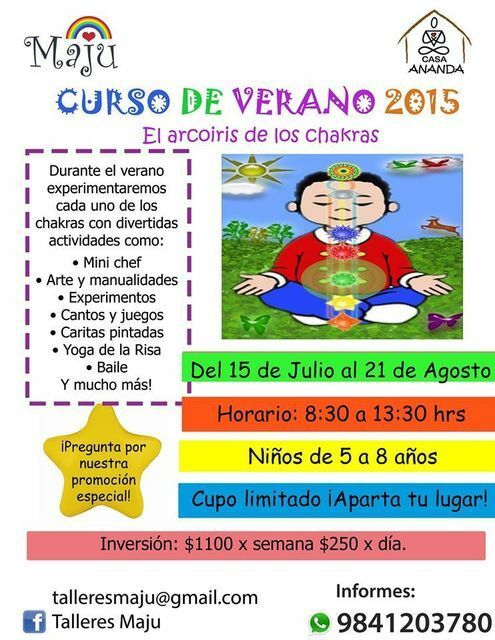 This summer camp is located just about 1.5 hours from Playa del Carmen near Nuevo Valladolid. Children ages 6 - 16 will spend 1 or 2 weeks sleeping in tents, surrounded by lush jungle and mystical cenotes. Campers will learn about the environment they live in and enjoy all sorts of games and activities including swimming in cenotes, kayak races, water zip-lines, campfires, foam wars, obstacle courses, competitions and all the fun you would expect from a true summer camp. Adult counselors and lifeguards with paramedic training will be onsite at all times. Cost includes transportation to and from Cancun, lodging, meals, accident insurance and all onsite activities. For more information visit the Agua Azul website and check out these camp videos on YouTube http://www.youtube.com/watch?v=gnsyxsJCD1Q and http://youtu.be/c8Rz384u1yQ. 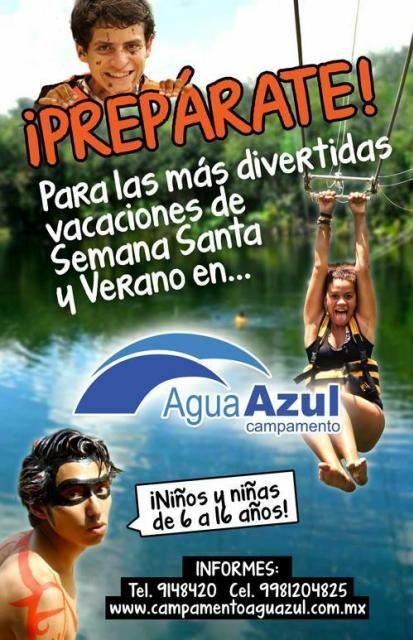 To reserve, call (998) 206 3714, (998) 120 4825 or email campaguaazul@gmail.com. Camp Azul Maya is located just about 2 hours from Playa del Carmen on Laguna Bacalar. Children and teens, ages 8 - 16, will spend 1 week sleeping in eco-cabins on the shores of Bacalar, the lake of seven colors, surrounded by nature. Summer Camp Azul Maya combines various elements that make this an unforgettable life experience where your children will learn, live together with nature and have a great time! Activities include swimming in cenotes, SUP, kayaking, zip-lines, hiking, climbing/rappelling, visits to archeological sites, campfires and all the fun you would expect from a great summer camp experience. Onsite counselors are trained in biology, nutrition, conservation, ecology and the unique history and culture of the region. Medical/first aid care will be available 24/7. Sessions are limited to 45 campers to provide a personalized camp experience. Cost includes lodging, meals and all onsite activities. 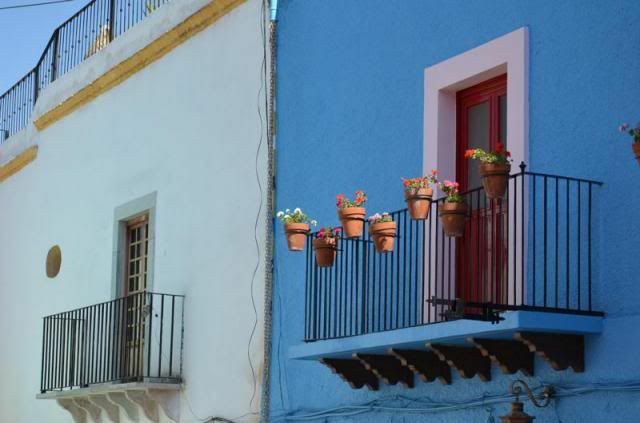 For more information visit the Azul Maya Facebook page. 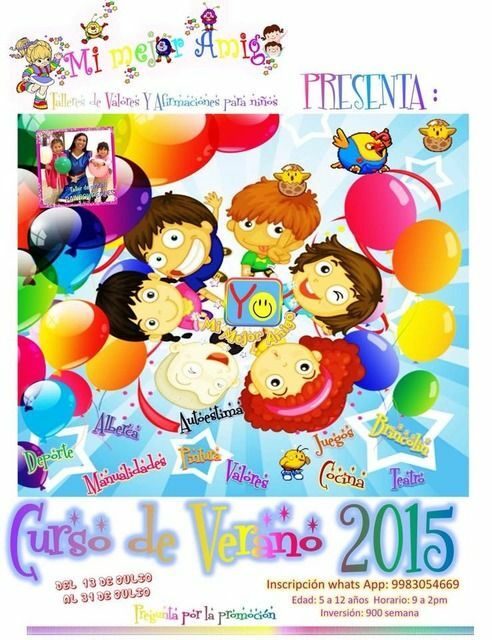 To reserve a place for your child, call oganizoe Lisa Tellez cel. (55) 5451-3292 or email kayakcenter@raidmexico.com or lisa@raidmexico.com. Location: Hipico Playa del Carmen, located behind Rancho Guadalupana, just south of Xcaret on 307 south. Boys and girls, ages 6 and older, will spend their mornings at the Hipico Playa del Carmen learning all about horses; how to feed and care for the animals and their tack. Riding instruction daily for beginning and intermediate riders. Campers will also enjoy the interactive petting "farm" and learn about the care of the various animals onsite. This is a wonderful opportunity to introduce your children to horses, animal care, stable maintenance and riding in a safe and fun environment under the supervision of experienced equestrians Paco Magallon and Anna Malachowski. After riding class, campers will play games and cool off in the cenote onsite! No previous experience required. Bi-lingual instruction. 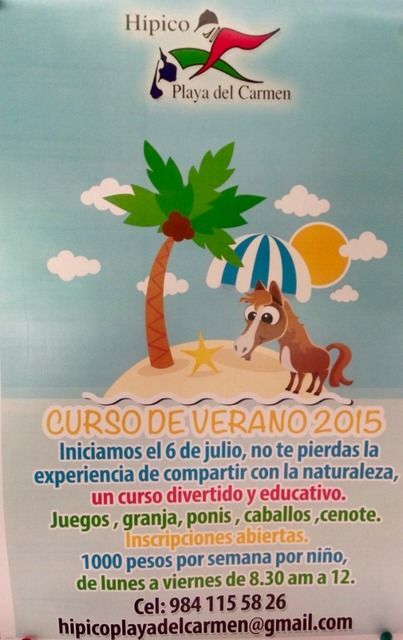 For more information, visit the Hipico Playa del Carmen Facebook Page or email hipicoplayadelcarmen@gmail.com. 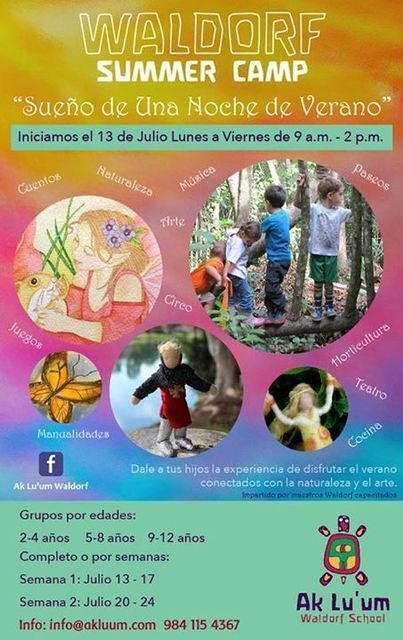 Children ages 5 - 11 are invited to spend the summer break in the jungle at Parque la Ceiba in Playa del Carmen. 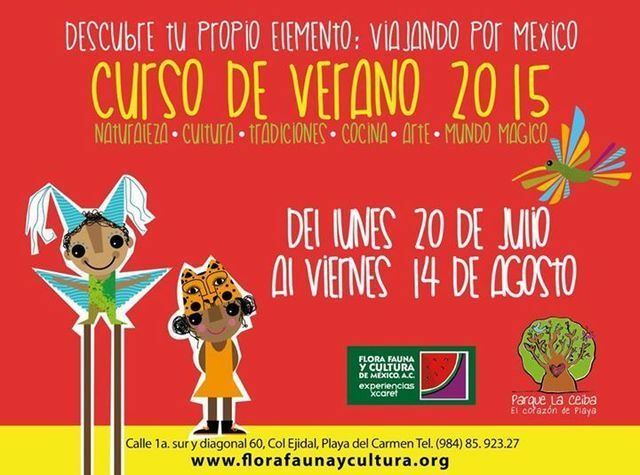 This summer the camp will invite children to "Travel through Mexico" ! 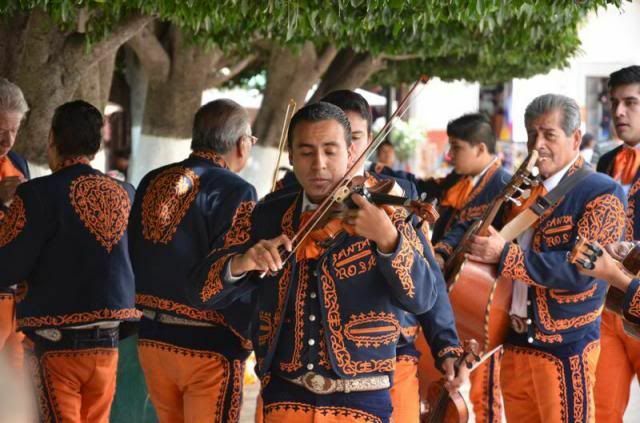 The goal of this program is to encourage the development of a child's curiosity, imagination and creativity through artistic, cultural and recreational activities related to MEXICO. 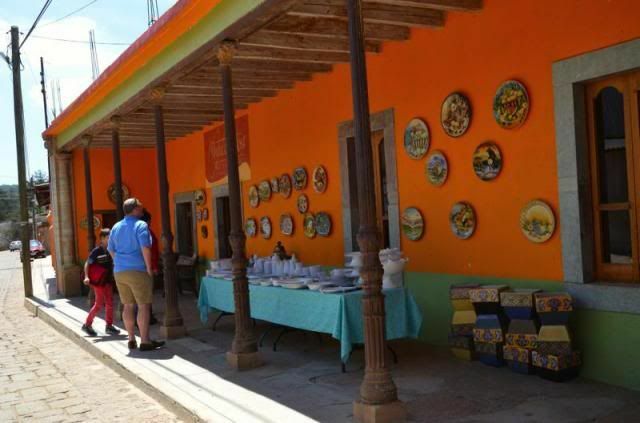 Children will travel "virtually" throughout Mexico discovering the native animals and plants, art, dance, traditional clothing and cuisine of the many and varied regions of Mexico. Children will progress through the course participating in story-telling, art activities, music, games, dance, cooking, cine club, "Mundo Magico", education activities, games of skill and tours related to all kinds of interesting themes. Prices include all materials. 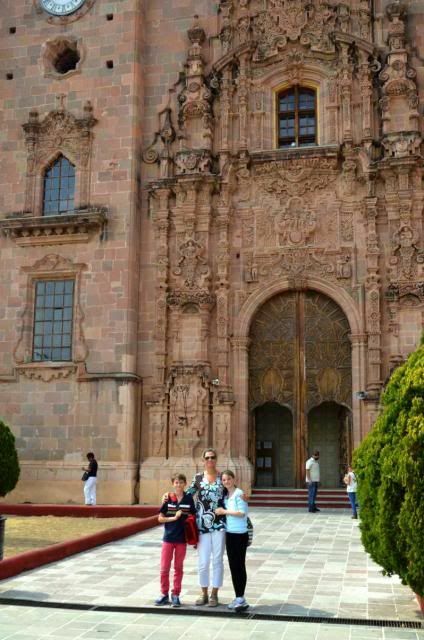 Instruction will primarily be given in Spanish providing a wonderful opportunity for children new to Mexico to immerse themselves in the language in a casual and fun environment without the pressures of school. Parents are invited to come a bit early at pick-up time to see what the children have been working on! 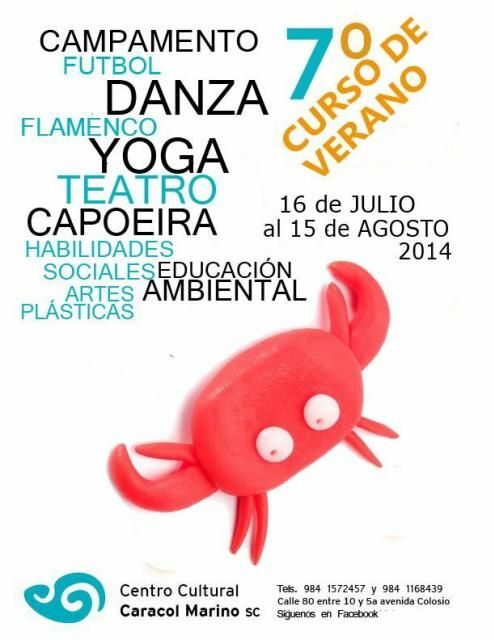 This is the 8th year that Parque la Ceiba has offered a summer camp for local children and it is very popular. For more information and to reserve a spot for your child, contact Lei de Landero at parquelaceiba@florafaunaycultura.org. Since its inception, the sailing club in Puerto Aventuras has attracted a great following and their sailors have had great success in national regattas. Captains in the making train on easily maneuverable Optimist and Laser sailboats, perfect for young ones. 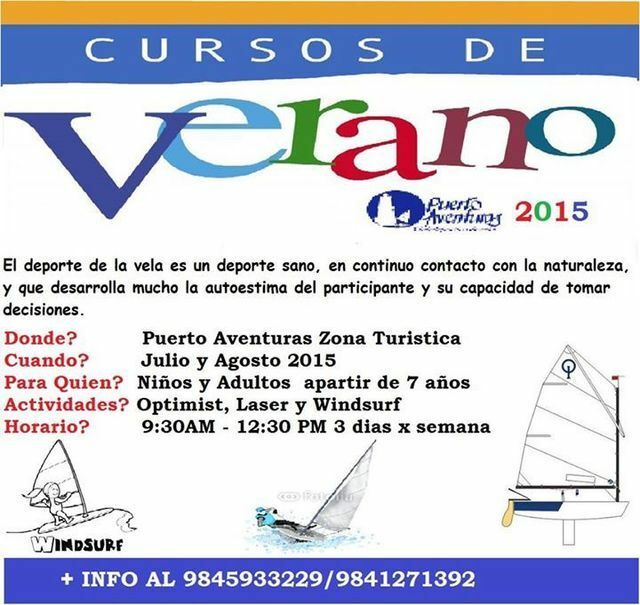 This summer the summer program is also offering windsurfing. The classes are available for children and adults and accommodate all levels of sailors. The only requirement is the ability to swim. Space is VERY limited so don't wait until the last minute to register. For more information and to sign up contact Director Daniele Gracis 984-127-1392 or via email atencion@colonos.org. 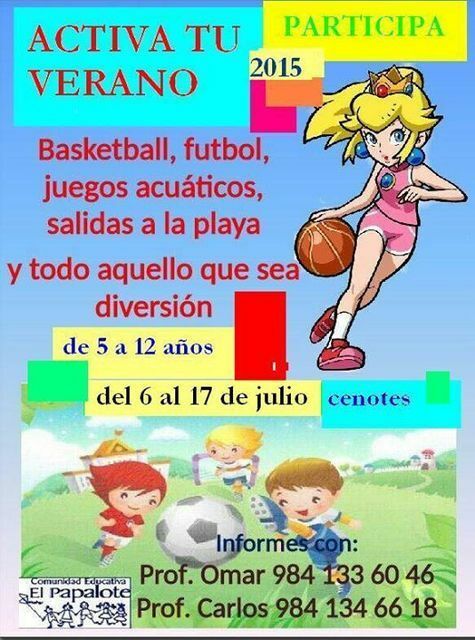 This summer Colegio El Papalote will be offering a fun sports camp to keep your kids active and help them build new skills. Monday - Friday Coaches Omar and Carlos will be supervising kids ages 7 and up in a variety of sports and recreational activities such as Basketball, Soccer, water fun and visits to the beach and local cenotes. For more information call Coach Omar at (984) 134 6189 or Coach Carlos (984) 133 6046. 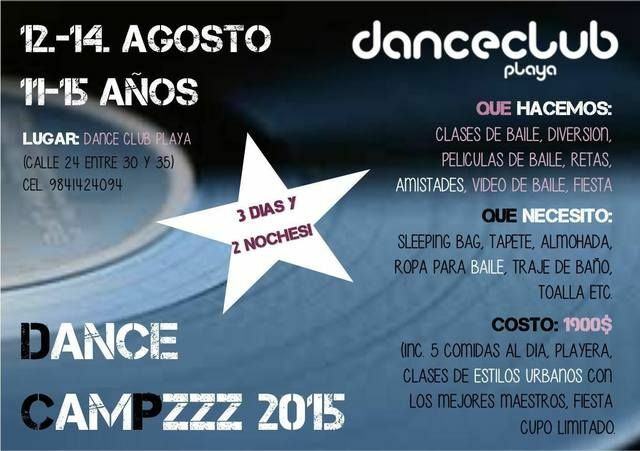 The DanceClub Playa day camp is open to all children, boys and girls, ages 6-12. 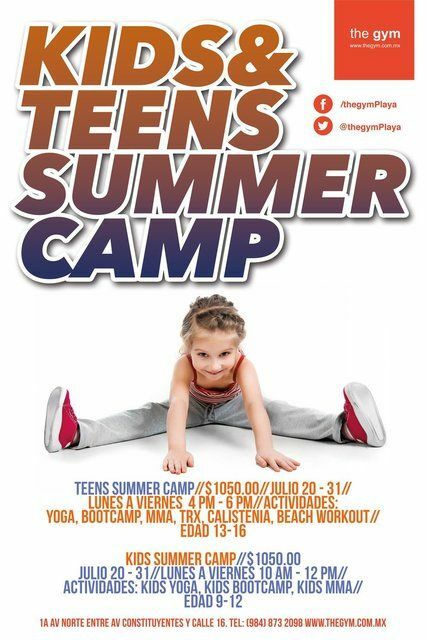 The overnight Dance Camp ZZZ welcomes children ages 11-15 and will be held at the DanceClub Playa campus on calle 24. 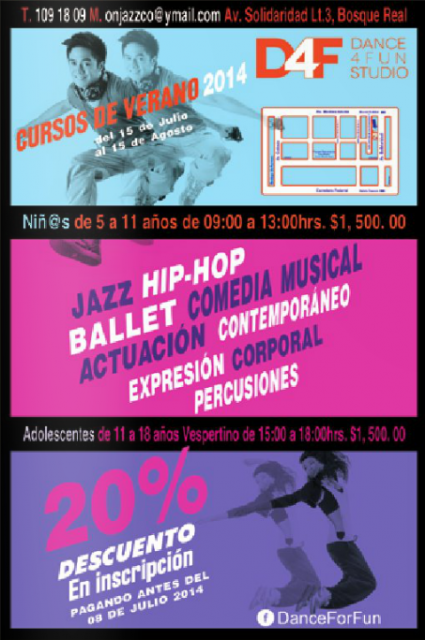 Children will participate in intensive dance classes, games and fun activities! Students will learn street dance, hip hop, break dance, popping and more. Fees include all classes and course materials, water and fresh fruit and an official DANCE CAMP t-shirt. Overnight dance campers will receive 5 healthy meals/snacks daily and a dance video at the end of the session. For more information and to register your child email danceclubplaya@gmail.com or call Johanna at 984-142-4094. Talleres Maju and Casa Anada invites children ages 5-8 to spend the day having fun, learning and developing new skills and making new friends! Children will have the chance to participate in a variety of artistic, active and educational pursuits including yoga, cooking classes, dance, arts and crafts, games, storytelling and more. For more information email talleresmaju@gmail.com or call (984) 120 3780. You can also connect with Maju on Facebook. Cost: Call 01-800-HABLA YA for tuition information. 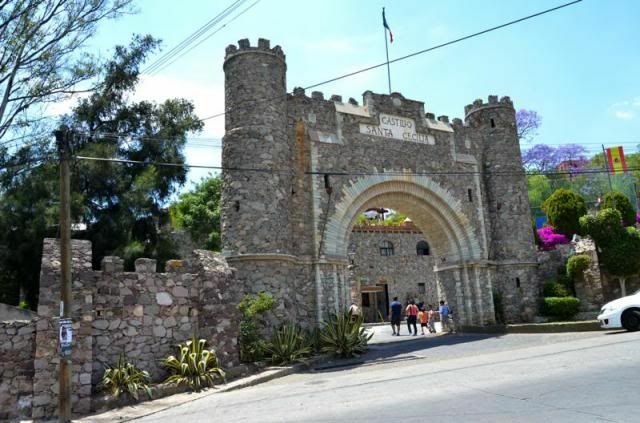 Harmon Hall, likely the best known English language school in Mexico, is offering a Summer Course for kids and pre-teens. 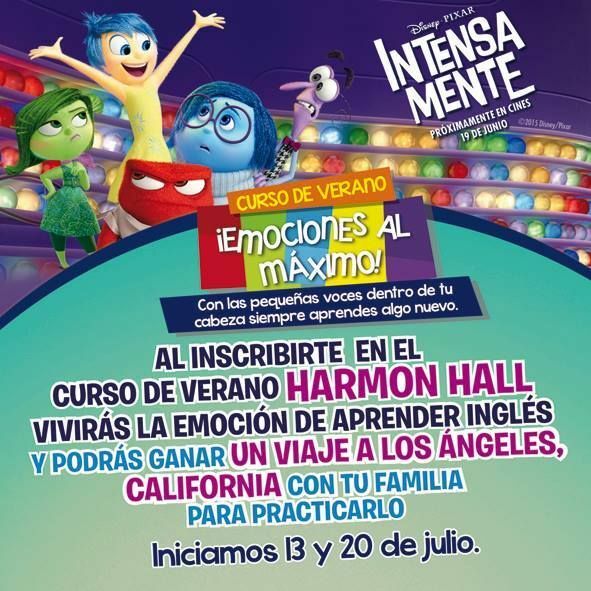 Inspired by the smash hit movie "Inside Out", Harmon Hall Summer Course 2015 is designed for children to earn English and have fun while exploring and learning to express their emotions. In only 4 weeks your children will achieve the same results they would get normally in 6 months!! This will be of particular interest to National families who are looking for an intensive English summer program for their school age children and pre-teens. Students will be grouped by age. 4 week program begins July 13th. Participants will have the opportunity to wine a trip to Los Angeles USA!! For program details visit http://www.harmonhall.com/summer/#programa. Call 01-800-HABLA YA for tuition information or submit this online form. 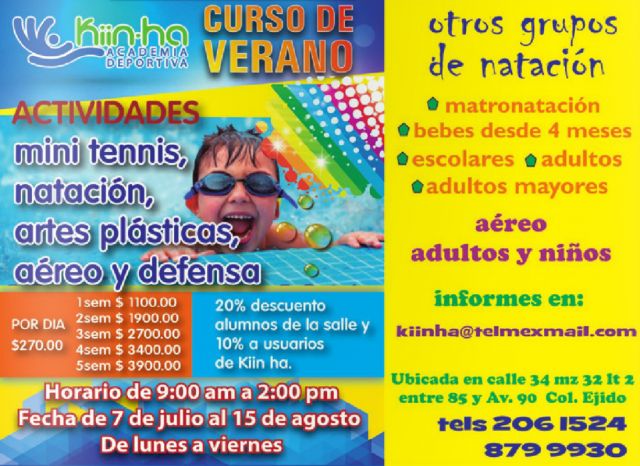 Kiin Ha offers indoor swimming instruction, mini tennis, tumbling and art classes for boys and girls, ages 3-15. For more information, call (984) 206 1524 or visit the Kiin Ha Facebook Page. Children ages 2-12 are invited to spend the summer break in the jungle at Ak Lu'um International School. The Waldorf inspired summer program will encourage the development of a child's sensory curiosity, imagination and creativity through artistic, cultural and recreational activities and will help our children appreciate and relate to our natural environment. Children will progress through the 2 week course participating in story-telling, art, music, handcrafts, theatre, games and gardening. Prices include all materials. Children will be grouped appropriately by age and can sign up for 1 or both weeks. For more information and to reserve a spot for your child, contact Siobhan Bowers at 984-115-4367 or by email info@akluum.com. 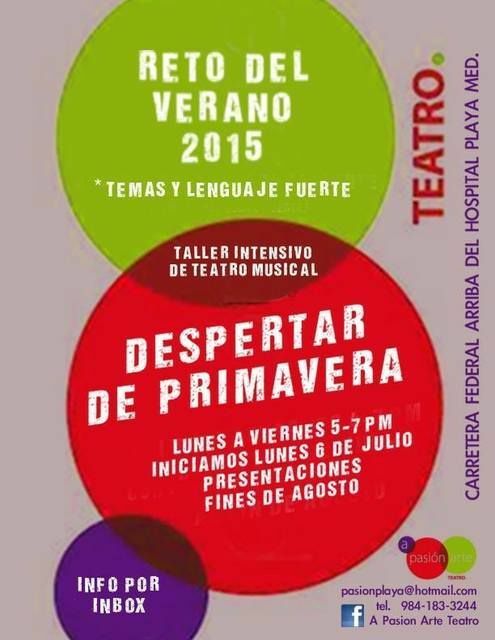 Location: A Pasion Arte Teatro - PlayaMed Building, Carretera Federal at Calle 28. Children ages 8-12 re invited to spend the summer break learning theatre arts with Shane Southcott and Martina at A Pasion Arte Teatro. Theatre games, Improvisation, creating a character, clowning, dance basics (hip hop & Jazz) Singing for musical theatre ensemble and solo. 2 one week sessions July 13th to 17th and July 20th to 24th. There is also a 2 week session where kids will work on a short one-act musical and present it on the last day of camp. July 27 to August 7th. For more information and to reserve a spot for your child, contact Shane Southcott at 984 183 32 44 or by email pasionplaya@hotmail.com. Teens and young adults age 14+ are invited to spend the summer break in an intensive theatre arts workshop with Shane Southcott and Martina Puch at A Pasion Arte Teatro. 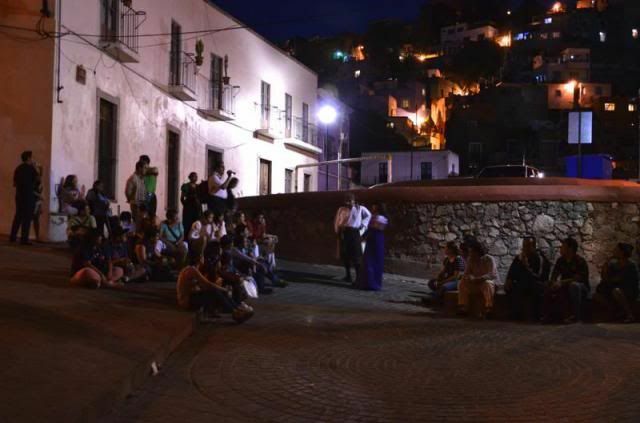 A Pasión Arte Teatro presents the Summer Challenge 2015 "Despertar de Primavera". The workshop begins Tuesday July 7th and will culminate with presentations on August 28th, 29th and 30th. Rehearsals will run Monday - Friday from 5pm - 7pm. There will be an Information session for participants and parents on July 6th at 5pm in the rehearsal space in the PlayaMed building. Come and meet the crew: Directors Shane and Martina, Vocal Director Rouiller Matias and Choreographer Aldo Adonay Sanchez. For more information and to reserve a spot, contact Shane Southcott at 984 183 32 44 or by email pasionplaya@hotmail.com. Kicks4Kids 2014! 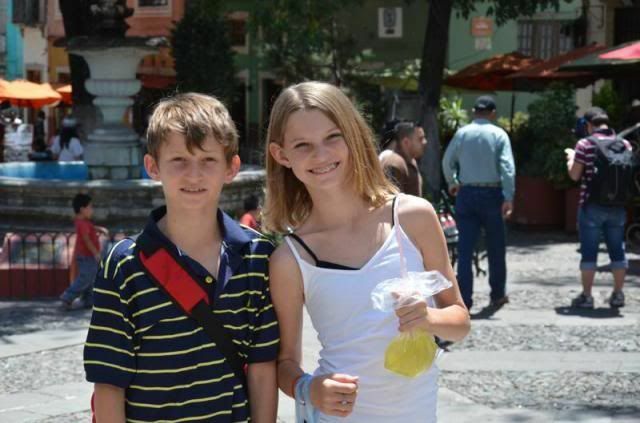 Holiday Help for the Kids of Playa! 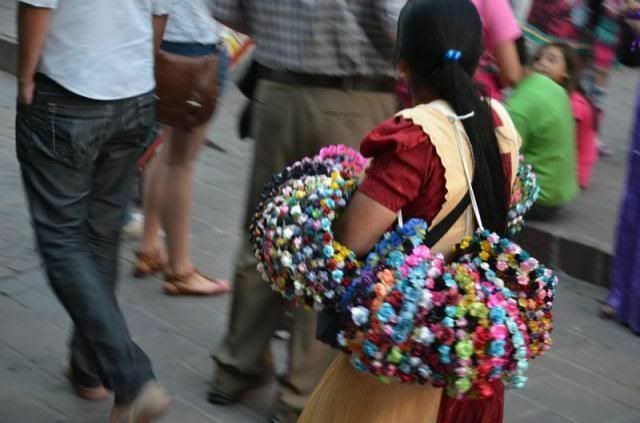 Are you looking for a way to help some of the the less fortunate children of Playa del Carmen this holiday season? Kicks4Kids is once again collecting sneakers and we need your support! Some of the children live in remote jungle villages with no access to affordable shoes. 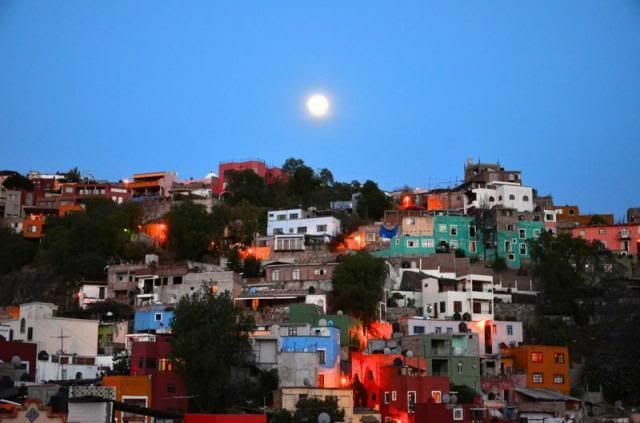 Some of the children live within the city center but are from economically disadvantaged families. Some have no family at all. Good quality shoes are very pricy here. Good sneakers for even little children cost about 300 pesos…making them a luxury item for many families. Shoes in the discount stores or grocery stores are more affordably priced but won’t last more than a few months. How can you help? If you are traveling to Playa del Carmen or anywhere on the Riviera Maya this holiday season, please bring us a pair of NEW sneakers from your local Payless, Target, Walmart or wherever you can find good quality shoes at good prices. They don’t have to be a fancy brand, just well-made, sturdy, new sneakers that children can run and play in! One pair will be great...if can bring more...even better! This will be updated as the collection progresses and new children are added to the list. Sneakers can be dropped of at any of the Amigos Network partners. Thank you for supporting Kicks 4 Kids! The 4th of July almost upon us and if you are anything like me, about this time you might start to feel a little homesick. It's hard to not miss the backyard family BBQs, block parties and spectacular fireworks displays that we all enjoyed during our years in the US. Every year, more and more people relocate to Playa from the United States, just as we did 10 years ago (yikes). 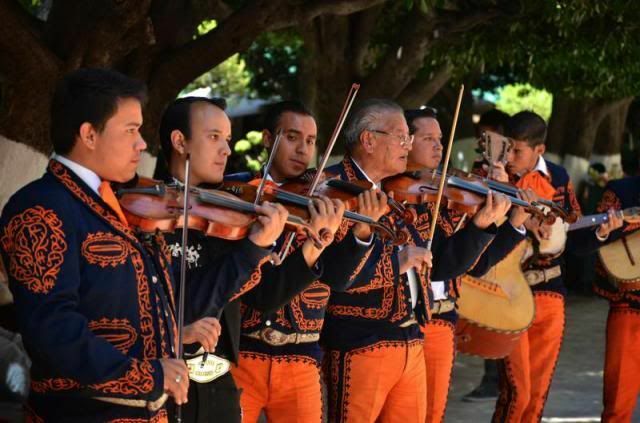 If you are one of them and are looking for somewhere to celebrate Independence Day with like-minded gringos we have a few good options for you. While you're unlikely to find any fireworks being set off, there are a couple of great parties going on that will sure to be a big draw for expats this 4th of July. 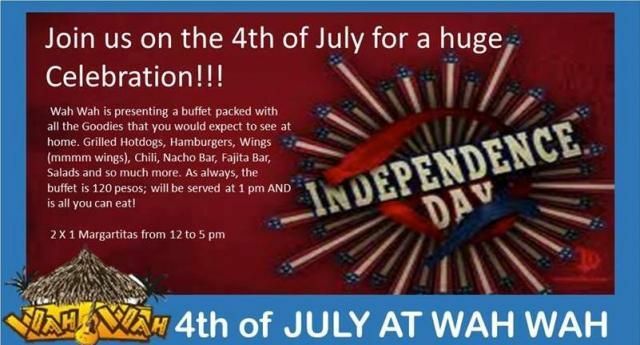 Wah Wah Beach Bar will have it´s annual 4th of July beach party. Wah Wah is presenting a buffet packed with all the best All-American BBQ that you would expect to see at home with a Mexican twist. The all-you-can-eat buffet will offer Grilled Hotdogs, Hamburgers and Wah Wah's famous Chicken Wings served with all the traditional salads and sides. There will also be Chili, a Nacho Bar, Fajita Bar and so much more. The buffet will be available from 1:00pm to 5:00pm. All you can eat for just 120 mn per person! At the bar and on the beach, enjoy 2 X 1 Margartitas from 12 to 5 pm!! Of course, World Cup fever means that all the soccer games will be showing on 4 huge flat screen TVs at the bar. Come early and watch France VS Germany at 11:00am and stick around for Brazil VS Colombia at 3:00pm. After the matches, LIVE music will begin at 7:00pm with one of Playa del Carmen´s hottest bands, RIO FUNK! 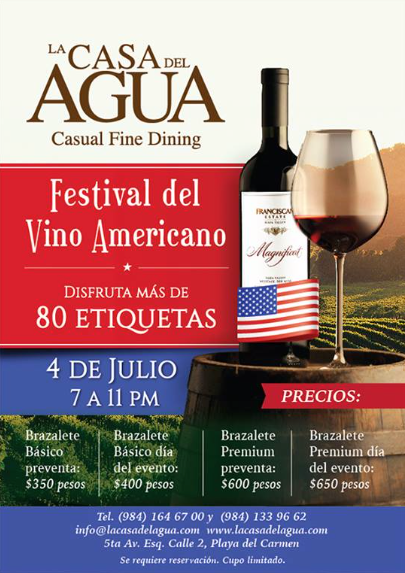 La Casa del Agua is having a very sophisticated 4th of July celebration with a huge festival of American wines! Enjoy over 80 wines will be available to taste from some of the best producers from the United States. The event will feature wines from Rhiannon, Robert Mondavi, Greg Norman, Kendall Jackson, Ridge, Stags Leap, Gloria Ferrer and many more! The tasting will take place from 7:00pm to 11:00pm. 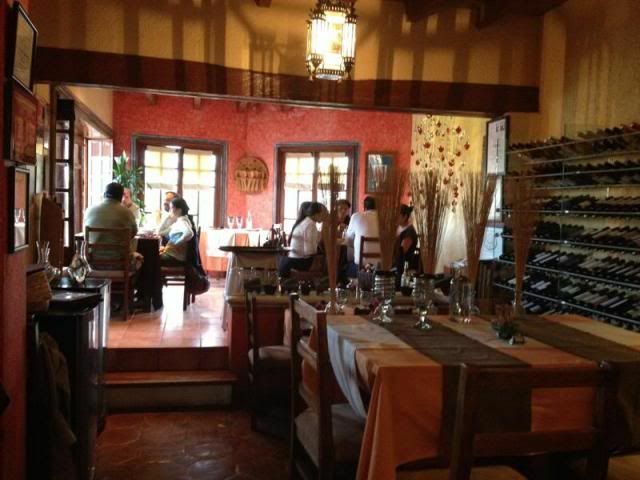 Basic Tasting $350 pesos (day of event $400 pesos) - Includes 45 basic level wines and delicious house made canapes. 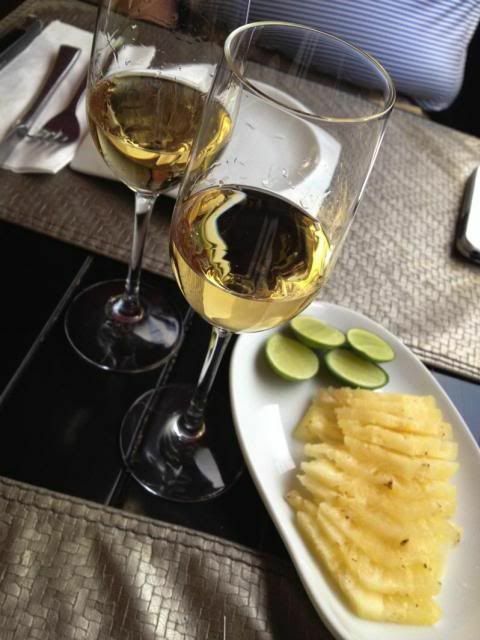 Premium Tasting $600 pesos (day of event $650 pesos) - Includes 35 premium level wines + 45 basic level wines and delicious house made canapes. Click here to see the list of wines for both the basic and the premium tasting levels. You can buy the bracelets at La Casa del Agua from 10:00am to 10:00pm today or after 10:00am tomorrow. You can also contact the staff at on 984 164 6700 or 984 133 9662 and they will deliver the bracelets to your home or office. How about that for service! 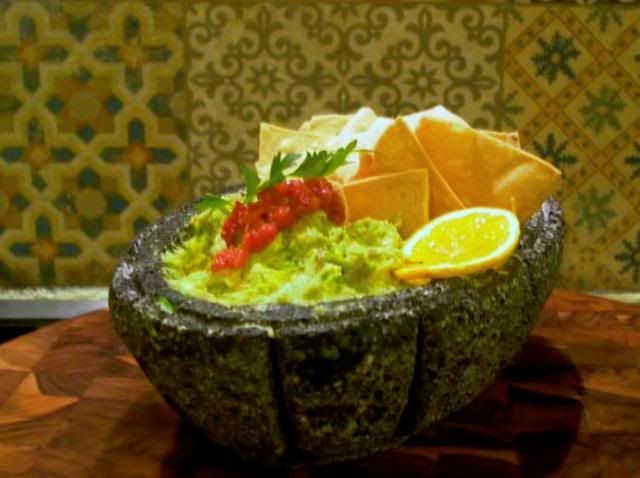 La Casa del Agua is located on 5th Av. 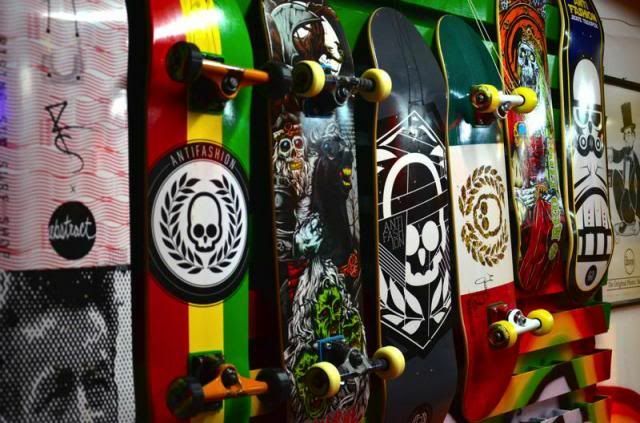 at Calle 2. You can always find a good party at Zenzi and this July 4th will be no exception! Zenzi will be offering and all-you-can-eat American BBQ buffet with Grilled Hamburgers, Sausage, Chicken, Ribs, traditional Baked Beans, sweet Corn on the Cob and your choice of three Salads. The buffet will be open from 4:00pm - 8:00pm and will cost $150 pesos per person. 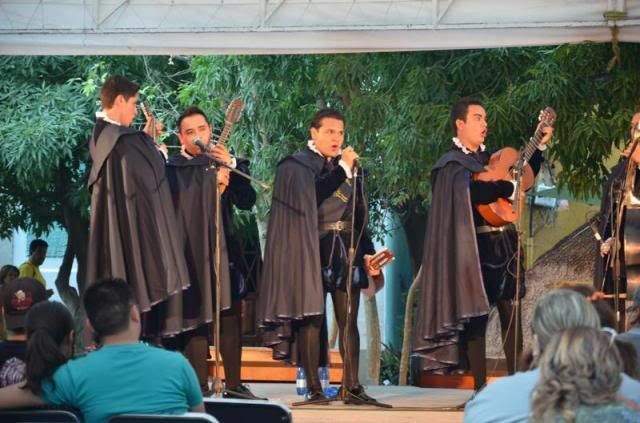 Also enjoy LIVE rock and roll entertainment from RADIO CERO! Eat! Drink! Chill! 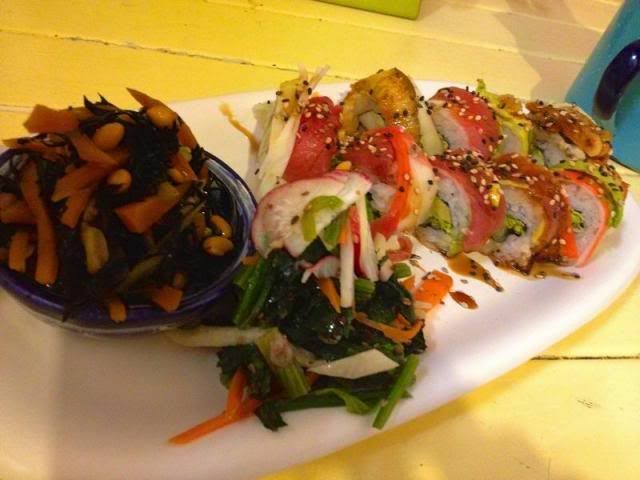 Zenzi is located on the beach at Calle 10. For more info call 984 803 5738 or check out the Zenzi facebook page. 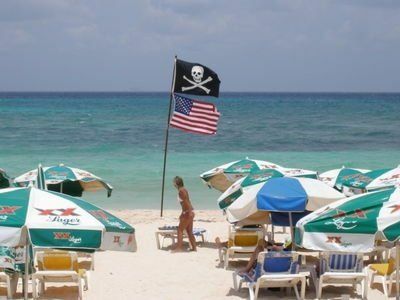 Celebrate the 4th of July in Akumal with all your expats friends. 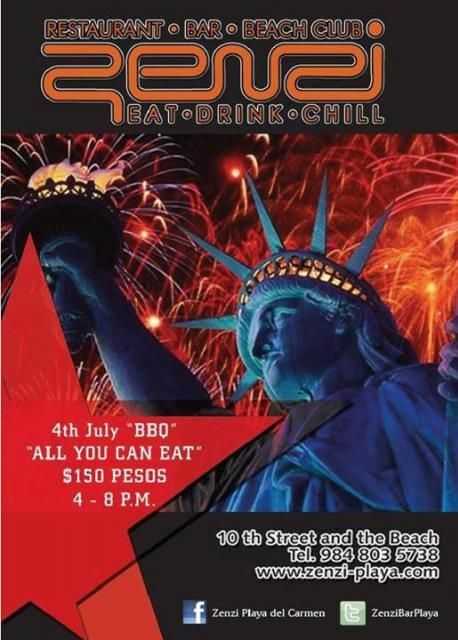 Lol Ha will be offering a fine spread of classic American BBQ fare like Ribs, Grilled Sausages, Chicken Wings, Corn on the Cob and good old fashioned Potato Salad all for just $150 pesos per person. The drink of the day will be a Miami Vice. What could be more American than that! 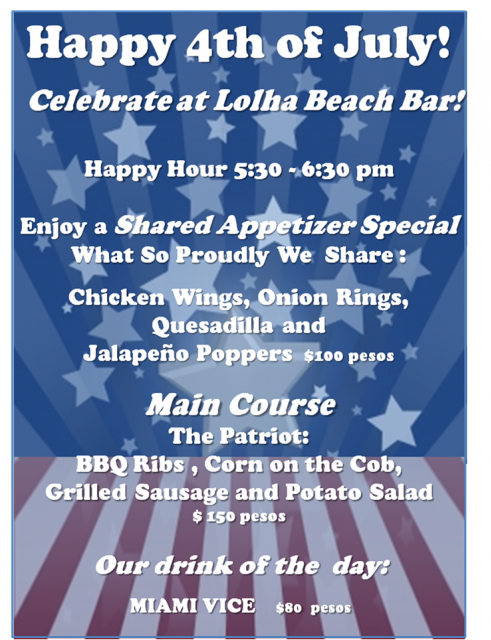 Lol Ha’s famous Happy Hour will be running from 5:30-6:30pm but the All-American menu will be offered all day long! 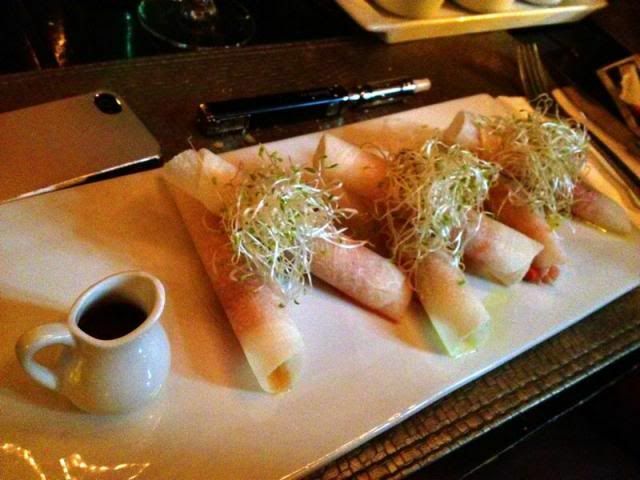 The crowd at Lol Ha is always a lot of fun, the food you know is delicious and the view can’t be beat! Where else would you rather be? Lol Ha is located on the beach on Akumal's main bay just south of the arch. Of course, Bad Boys Beach Bar will be hosting their own 4th of July beach bash with live music from Creizy Toy from 3:00pm - 6:30pm. Cowboy John will be cooking up delicious traditional American fare. Guests are asked to bring a favorite side dish to share, perhaps a favorite American style potato salad, coleslaw or apple pie or whatever makes your 4th of July complete! If you are just here on vacation and can't participate in the pot-luck, just $150 pesos let's you take advantage of all of Cowboy John's good old fashioned fix-ins like Potato Salad, Baked Beans, Coleslaw and Green Salad!! The buffet will start at 3:00pm and go until the food runs out so get there early! Bad Boys is located on the beach just south of Calle 4. Just look for the pirate flag. 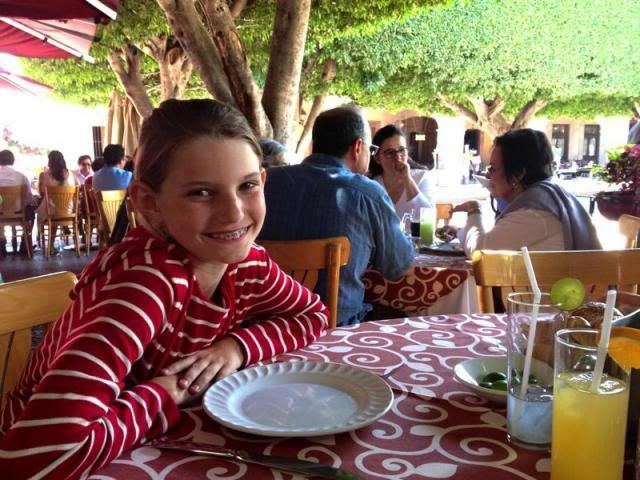 Once again, we are putting together a listing of camps and programs (cursos de verano) for children in Playa del Carmen and the Riviera Maya for the summer of 2014. 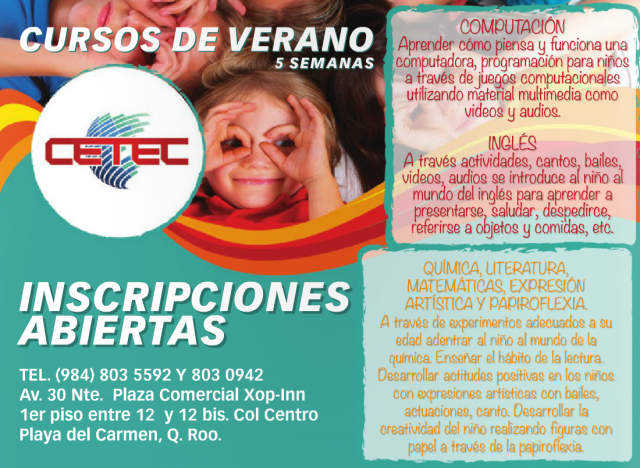 These are the programs and summer camps that we have found so far for kids living in Playa del Carmen and all across the Mayan Riviera. There are some exciting new programs this year for children of all ages, both day programs and sleep over camps. Whether your children are interested in sports, nature, the arts or even a traditional sleep-over camp experience, there are a variety of options to choose from. I have not yet heard back from all of the organizations who I have reached out and I will update the list and re-post the link to the blog on the BuyPlaya Facebook page as new offerings come in. If you know of any summer camp options that we do not have listed, please feel free to send me the info at michele@buyplaya.com. Want your kids to experience the traditional "sleep-over" camp like you did as a child? 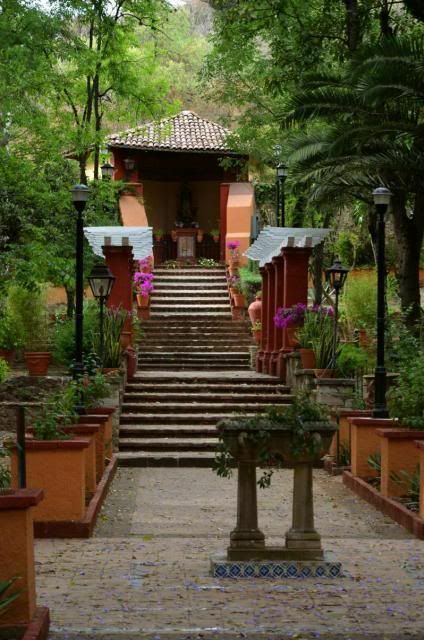 Check out Camp Agua Azul! 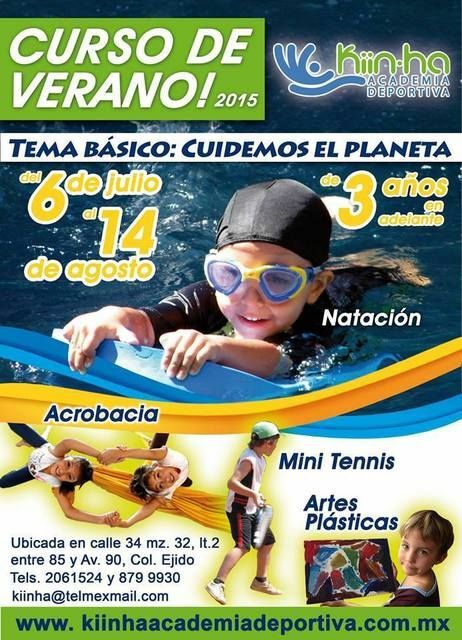 This summer camp is located just about 1.5 hours from Playa del Carmen near Nuevo Valladolid. Children ages 6 - 16 will spend 1 week sleeping in tents, surrounded by lush jungle and mystical cenotes. Campers will learn about the environment they live in and enjoy all sorts of games and activities including swimming in cenotes, kayak races, water zip-lines, campfires, foam wars, obstacle courses, competitions and all the fun you would expect from a true summer camp. Adult counselors and lifeguards with paramedic training will be onsite at all times. 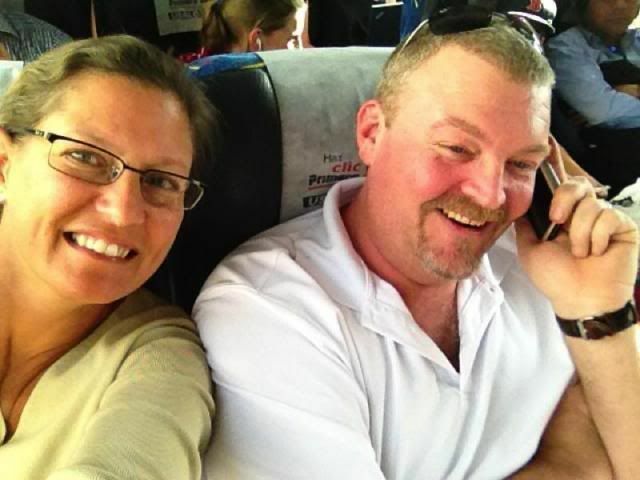 Cost includes transportation to and from Cancun, lodging, meals, accident insurance and all onsite activities. For more information visit the Agua Azul website and check out these camp videos on YouTube http://www.youtube.com/watch?v=gnsyxsJCD1Q and http://youtu.be/c8Rz384u1yQ. To reserve, contact camp organizer Marilu Rivera at 998-120-4825 or via email campaguaazul@gmail.com. Camp Azul Maya is located just about 2 hours from Playa del Carmen on Laguna Bacalar. Children and teens, ages 8 - 16, will spend 1 week sleeping in eco-cabins on the shores of Bacalar, the lake of seven colors, surrounded by nature. Summer Camp Azul Maya combines various elements that make this an unforgettable life experience where your children will learn, live together with nature and have a great time! Activities include swimming in cenotes, SUP, kayaking, zip-lines, hiking, climbing/rappelling, visits to archeological sites, campfires and all the fun you would expect from a great summer camp experience. Onsite counselors are trained in biology, nutrition, conservation, ecology and the unique history and culture of the region. Medical/first aid care will be available 24/7. Sessions are limited to 40 campers to provide a personalized camp experience. 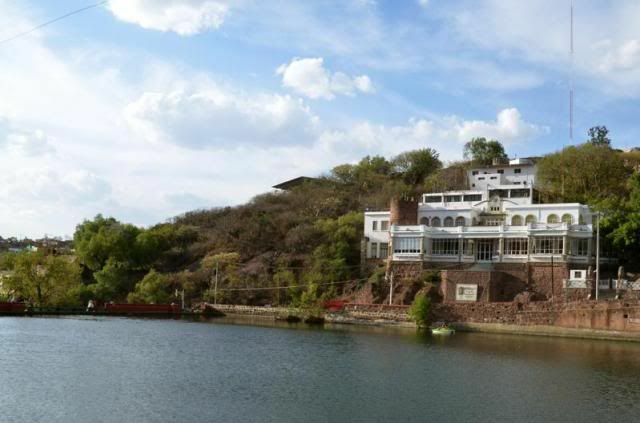 Cost includes lodging, meals and all onsite activities. 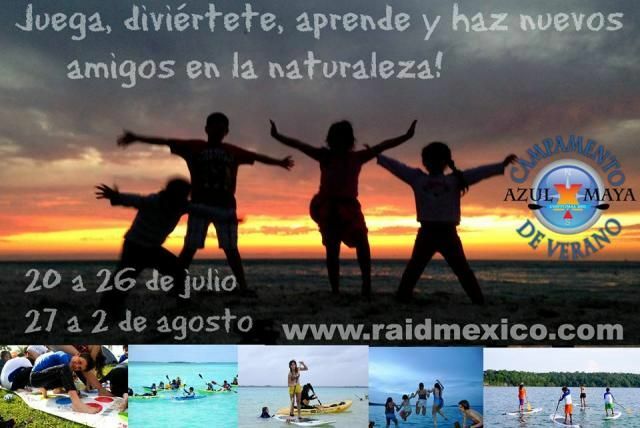 For more information and to reserve a place for your child, visit the Azul Maya webpage, the Azul Maya Facebook page or contact camp organizers at kayakcenter@raidmexico.com or lisa@raidmexico.com. 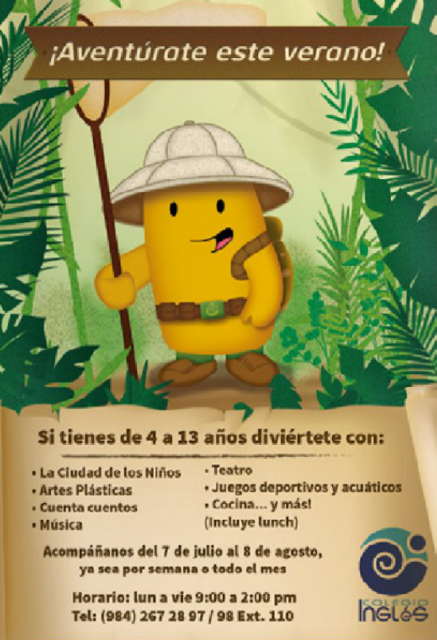 Children ages 5 - 11 are invited to spend the summer break in the jungle at Parque la Ceiba in Playa del Carmen. 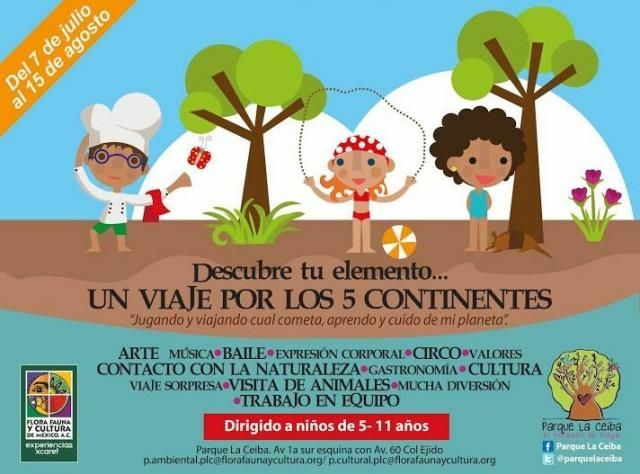 This summer the camp will invite your child to "Travel the 5 Continents" using their 5 senses. The goal of this program is to encourage the development of a child's sensory curiosity, imagination and creativity through artistic, cultural and recreational activities related to environmental and cultural awareness. To help our children appreciate and care for our natural environment, children will travel "Virtually" around the world sampling the cuisine and discovering the art, dance and natural habitats of countries from around the globe. Children will progress through the 6 week course participating in story-telling, art activities, music, games, dance, cooking, cine club, "Mundo Magico", environmental education activities, games of skill and training and tours related to all kinds of interesting environmental and cultural themes. Prices include all materials. 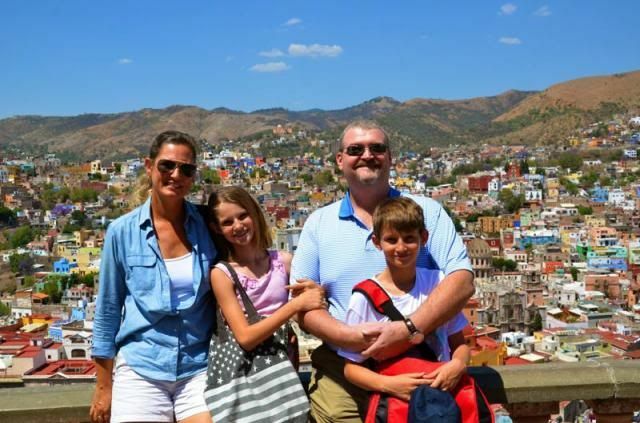 Instruction will primarily be given in Spanish providing a wonderful opportunity for children new to Mexico to immerse themselves in the language in a casual and fun environment without the pressures of school. Parents are invited to come a bit early at pick-up time to see what the children have been working on! 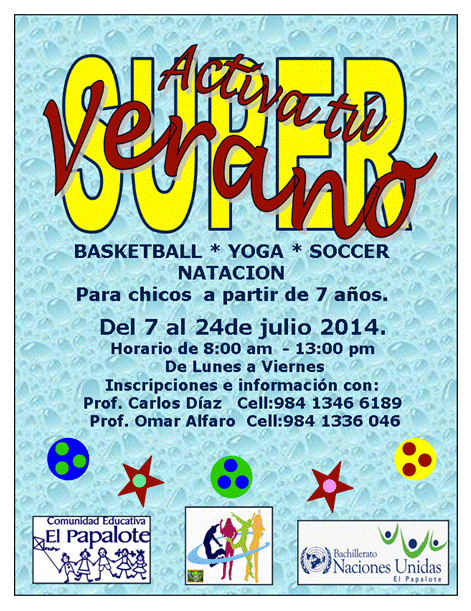 This is the 7th year that Parque la Ceiba has offered a summer camp for local children and it is very popular. 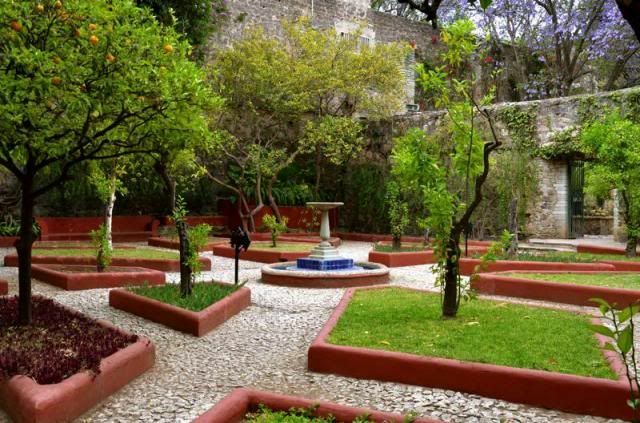 For more information and to reserve a spot for your child, contact Lei de Landero at parquelaceiba@florafaunaycultura.org. Boys and girls, ages 7 and older, will spend their mornings at the Hipico Playa del Carmen learning all about horses; how to feed and care for the animals and their tack. Riding instruction daily for beginning and intermediate riders. Children who enroll for a month long session will be able to "Adopt a Horse" for the month! This is a wonderful opportunity to introduce your children to horses, animal care, stable maintenance and riding in a safe and fun environment under the supervision of experienced equestrian Paco Magallon. After riding class, campers can cool off in the cenote onsite! No previous experience required. Bi-lingual instruction. For more information, visit the Hipico Playa del Carmen Facebook Page or email hipicoplayadelcarmen@gmail.com. For several years, PLAY TENNIS ACADEMY has organized a wonderful summer tennis camp for kids ages 5 - 15. Kids of all skill levels will learn the proper technique and form for each of the strokes used in the fast paced game of tennis! Children will develop important motor skills with the racket in a manner suitable for children at all levels of play. Young and beginning players will focus on development of motor skills with the ball and racquet, learning the techniques of each stroke and fun games and learning activities to reinforce new skills. Older children and more advanced players will work on technical stroke training and tactics of the game. They will master the 5 game situations - serve, return, base-line play, attack and defense and delve into the psychology of the game of tennis. There will be a Mini-Olympics to finish the course with prizes! Fees include an official summer camp t-shirt, sports drinks and snacks for each child. For more information and to sign up contact Alvaro Flores at tenisproalvaro@gmail.com or call 984-806-4666. Palapa Suuk invites children ages 6-12 to spend the day having fun, learning and developing new skills and making new friends! Children will have the chance to participate in a variety of artistic, active and educational pursuits including yoga, cooking classes, dance, arts and crafts, games, storytelling and more. For more information email talleresmaju@gmail.com or call (984) 120 3780. You can also connect with Maju on Facebook. 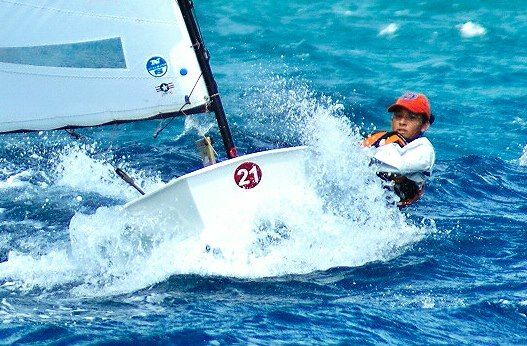 Since its inception, the sailing club in Puerto Aventuras has attracted a great following and their sailors have had great success in national regattas. Captains in the making train on easily maneuverable Optimist sailboats, perfect for young ones. This summer the Club Deportivo de Velas in Puerto Aventuras will offer both sailing instruction for children ages 8 -12. The classes are appropriate for all levels of sailors. The only requirement is the ability to swim. Space is VERY limited so don't wait until the last minute to register. For more information and to sign up contact Director Daniele Gracis 984-127-1392 or via email atencion@colonos.org. 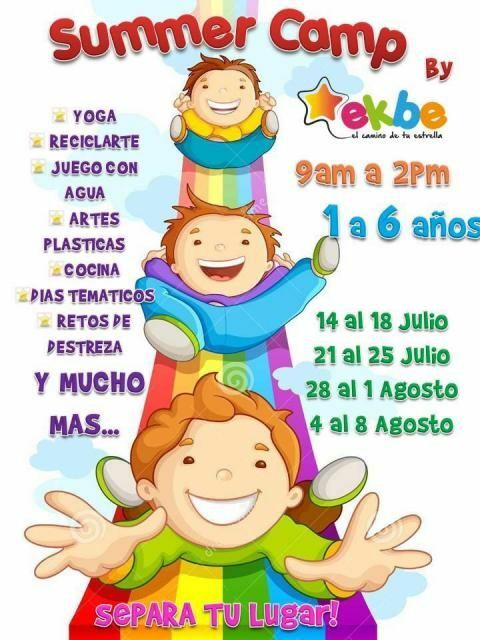 Every summer Colegio El Papalote opens its doors to all Playa del Carmen children in preschool and primary grades to spend their summer days having fun, staying active and making new friends! Children will have the chance to participate in a variety of artistic, active and educational pursuits including painting, arts and crafts, music, water games and lots of fun activities for kids of all ages. For more information call Miss Yanett at (984) 185 9485. This summer Colegio El Papalote will be offering a fun sports camp to keep your kids active and help them build new skills. Monday - Friday Coaches Omar and Carlos will be supervising kids ages 7 and up in a variety of sports and recreational activities such as Basketball, Soccer, Yoga and Swimming. For more information call Coach Omar at (984) 134 6189 or Coach Carlos (984) 133 6046. 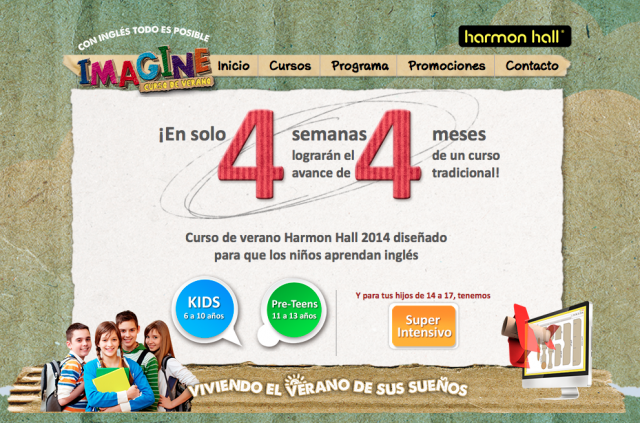 Harmon Hall, likely the best known English language school in Mexico, is offering a Summer Course for students ages 6 - 17. Harmon Hall Summer Course 2014 is designed for children to earn English and have fun while getting to know different cultures of the world. 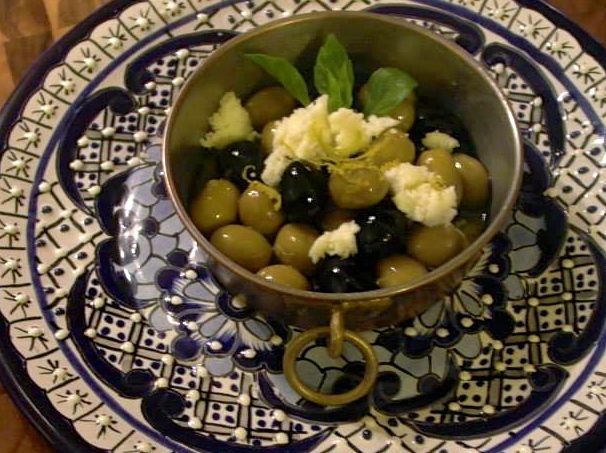 Each week will focus on a new country; its geography, art, cuisine and traditions. In only 6 weeks your children will achieve the same results they would get normally in 6 months!! This will be of particular interest to National families who are looking for an intensive English summer program for their school age children. Students will be grouped by age: Kids 6-10 years of age, Pre- teens 11-13 years of age, Super Intensive 14-17 years of age. 4 week program begins July 14. For program details visit http://www.harmonhall.com/summer/#programa. Call 01-800-HABLA YA for tuition information. The DanceClub Playa day camp is open to all children, boys and girls, ages 5 and up and will take place at El Papalote School. 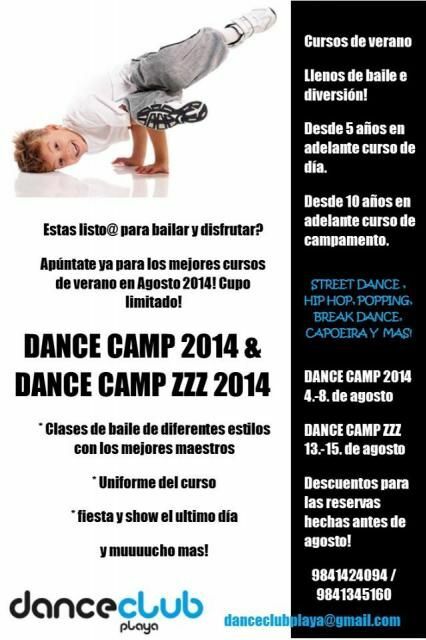 The overnight Dance Camp ZZZ welcomes children from age 10 and will be held at the DanceClub Playa campus on calle 24. Children will participate in intensive dance classes, games and fun activities! Students will learn street dance, hip hop, break dance, popping, capoeira and more. Fees include all classes and course materials, water and fresh fruit and an official DANCE CAMP t-shirt. Overnight dance campers will receive 5 healthy meals daily and a dance video at the end of the session. Discounts will apply for registration before August 1. For more information and to register your child email danceclubplaya@gmail.com or call Johanna at 984-142-4094. Make your child's summer fun and educational! 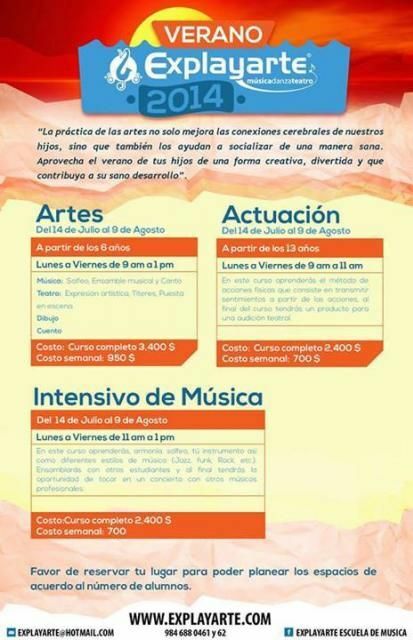 The Centro Cultural Caricol Marino invites children ages 5 - 14 to Expres-arte their summer break! 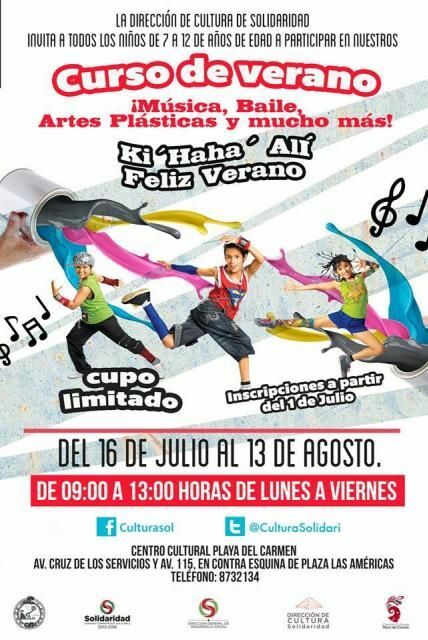 Kids will spend the day learning and developing new artistic talents, having fun and making new friends! Children will have the chance to participate in a variety of artistic, active and educational pursuits. Children will be sorted according to age. Each group will participate in activities geared to their age. Discounts may apply for families with more than one child attending. For more information email centrocaricolmarino@gmail.com or call (984) 157 2457, (984) 116 8439. You can also connect with Caricol Marino on Facebook. Explayarte, Playa del Carmen's premier music and performing arts school is offering a wonderful summer program for your budding performers! Children as young as 8 are welcome to join the Summer Arts program where they will work on projects learn music skills, acting, drawing and storytelling. 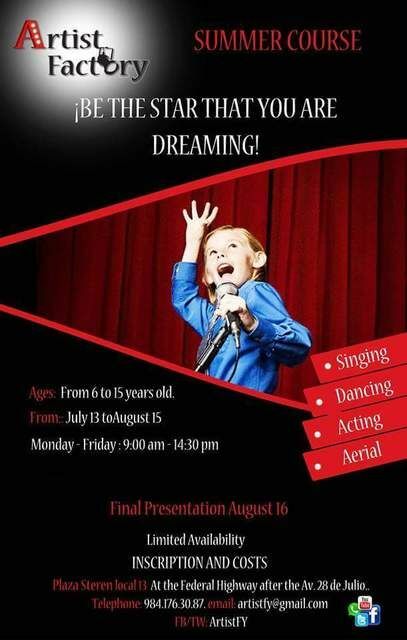 An Intensive Drama Camp is open to children 13+ with an interest in improving their acting skills. The goal of this course to teach young performers specific techniques and methods of acting. At the end of the course, participants will have a fully realized audition piece completed. 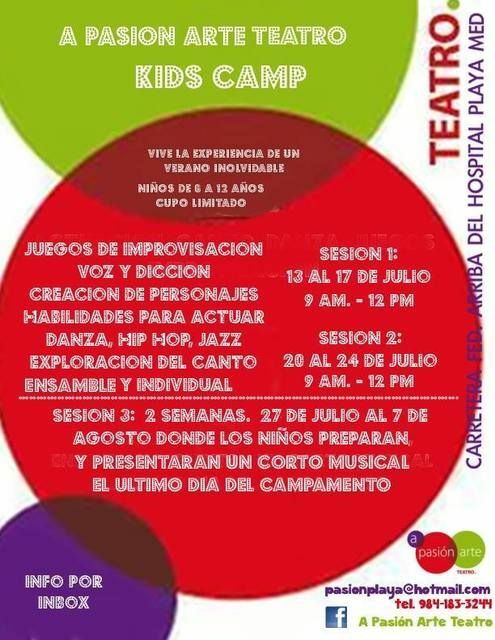 Drama Camp participants will be able to put their hard work to practical use, performing for Explayarte staff, students and parents at the end of the summer session. The intensive Music Camp is open to musicians of all ages and abilities. Students will learn the principals of various genres of music including Jazz, Funk and Rock. 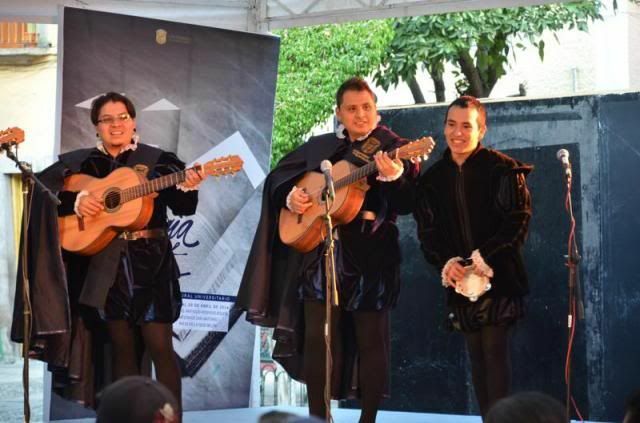 They will learn to play together as an ensemble and at the end of the course they will have the opportunity to play with professional musicians. 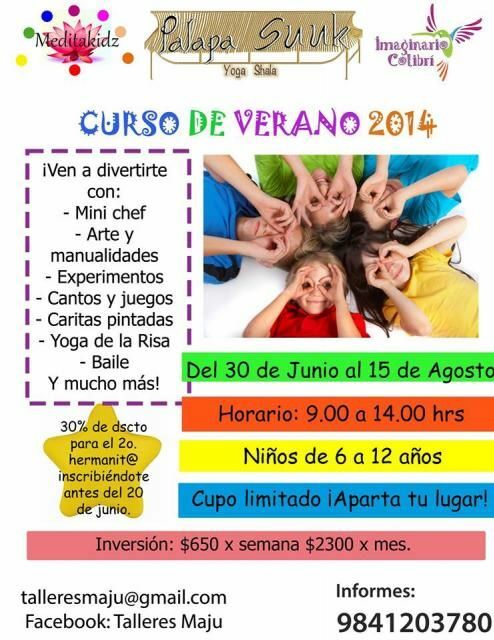 Children 7-12 years old are invited to spend the summer break at Playa del Carmen's Centro Cultural. More info coming soon. Children ages 4 - 11. 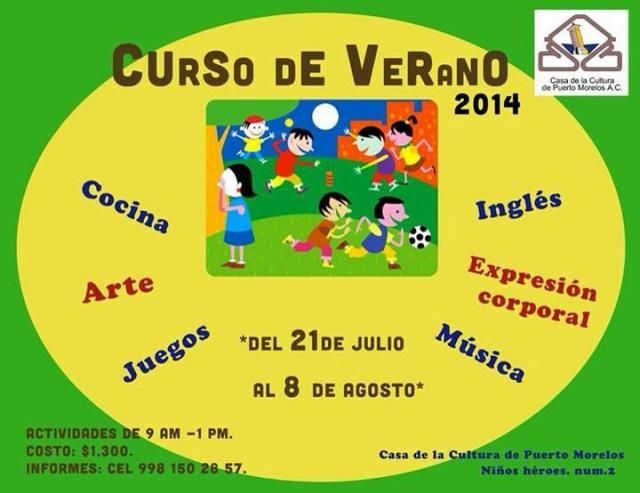 For more information contact Maestra Lorena Malo 998 150 2857. 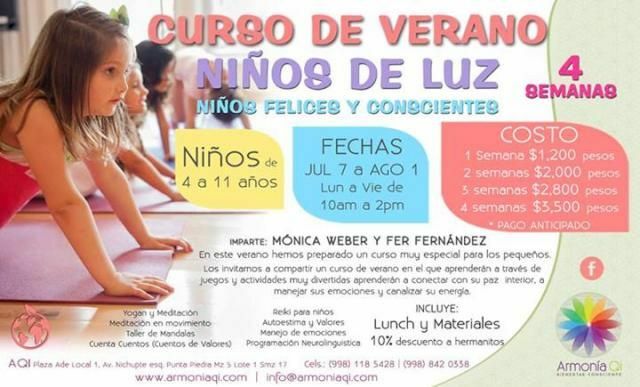 ArmoniaQI in Cancun invites children ages 4 - 11 to their special summer program, Ninos de Luz, Ninos Felices y Concientes . Throughout the summer, children will, through games and fun activities, learn to connect with their inner peace, manage their emotions and channel their energy. * Hold positive thoughts and improve negative attitudes to live in harmony. The fees include all material and lunch. For more information contact Fer Fernández or Monica Weber (998) 118 5428, (998) 842 0338 or via email info@armoniaqi.com. 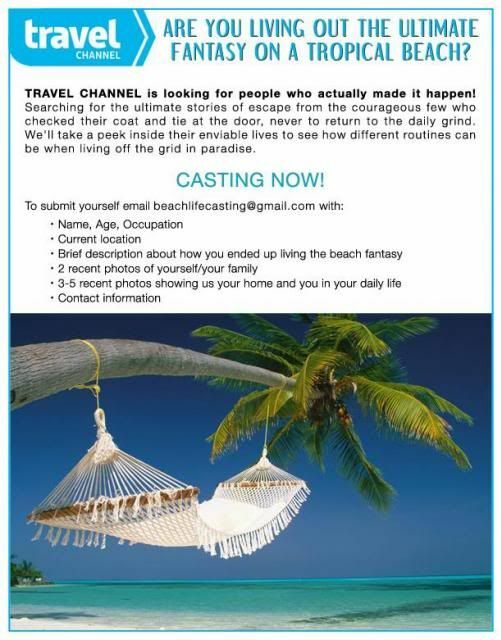 Rob and I have been approached by a Casting Associate who is working on a new TV series about people who are living out the fantasy on a tropical beach or island. While we don't have time to participate I'll bet a few of our "Life's a Beach" readers might be interested! The Travel Channel is looking for the ultimate stories of escape from the courageous few who checked their suit and tie at the door never to return to the daily grind. They want to a peek inside these enviable lives to see how different routines are when living life "out of the box" in paradise. This new travel documentary show will be centered around cool stories and people who are doing cool things (i.e. built their own boat and live on it, run interesting businesses, found their new life from an unexpected twist of fate, etc). The idea is to get a glimpse inside the lives of people that are "living the dream." This is a pilot, but if it gets picked up, it will become an ongoing series, like HHI and similar shows. If you feel like you are a good fit for the pilot, please send the information requested on the flier below. You probably won't get famous but it could be a lot of fun! 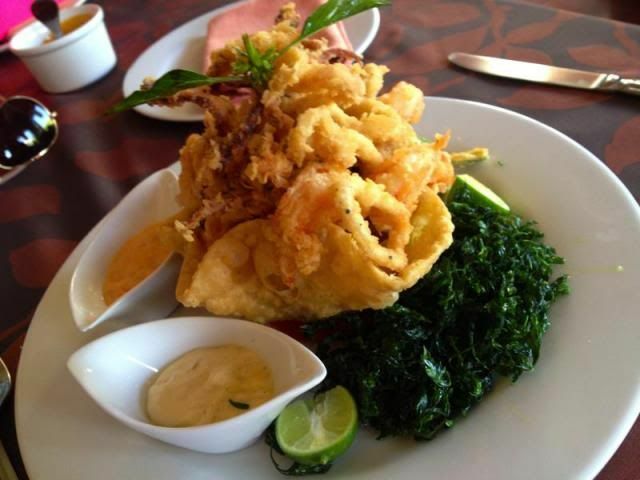 When contemplating a destination for a family trip or even a quick getaway, one of our top considerations is cuisine/dining options. 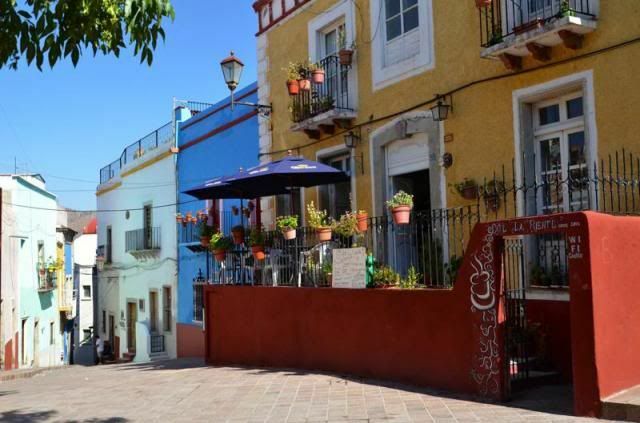 When doing my research for this year's family vacation, I found loads of fantastic restaurant recommendations for San Miguel de Allende but not so many for GTO City. Nevertheless, with a little bit of help from Google and recommendations from our property manager, Israel and other locals we met along the way, we actually found some fantastic restaurants, ate some great food and met some very fine chefs along the way. 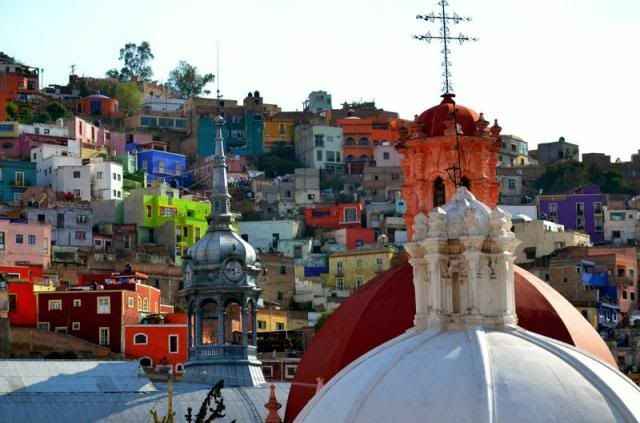 These are our top 5 restaurant picks for Guanajuato City, the places we really enjoyed and look forward to returning to next time! La Taula - Both Rob and I absolutely loved this place located down the block from our rental, just off of the Plaza San Fernando. We ate there twice during our week-long stay in the city. 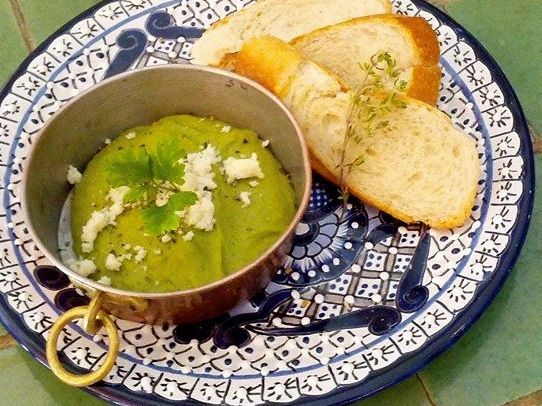 We liked it so much, La Taula took the coveted "last meal" position in our schedule. 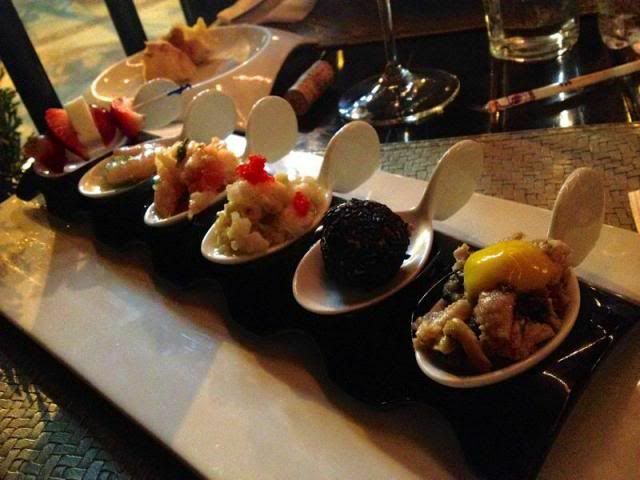 The menu concept put simply is Mexican ingredients meet Spanish tapas. 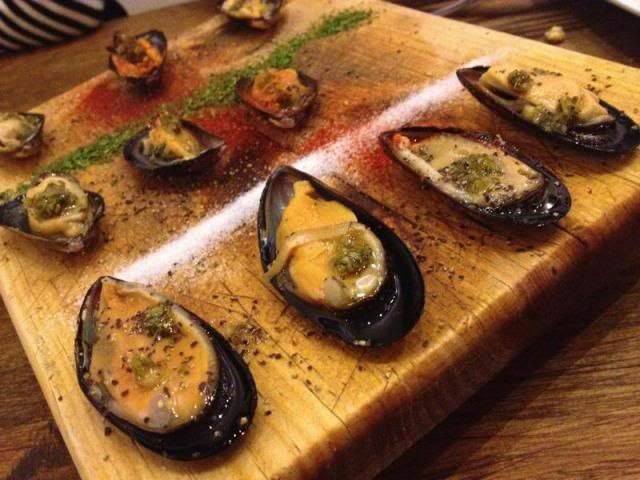 Our favorites offerings included the Carpaccio de Tomate y Tomatillo, Mejillones Natural, Ancas de Rana and the Camarones Aluat. The frogs legs are hands down the best I have ever had. The wine list was small but well thought-out and reasonably priced. 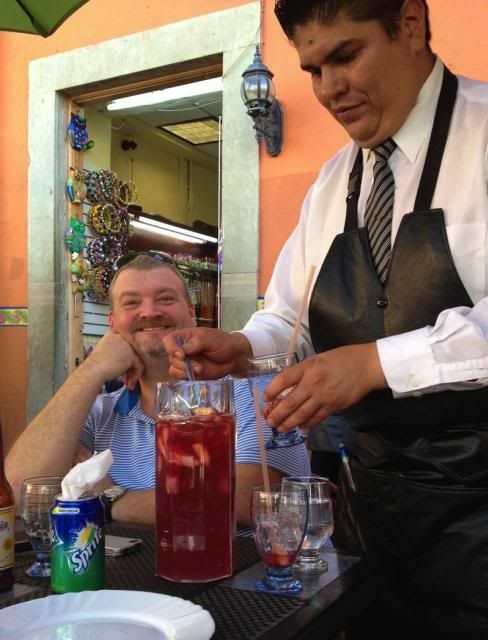 I think we may have drank them out of Casa Madero 3V which is a favorite of ours. The sous chef came out several times to check in on us and give us little samples of things we had not tried yet and really went out of his way to make sure we had the best that La Taula had to offer. This place is a little hard to find and not directly accessible by taxi but definitely worth it! 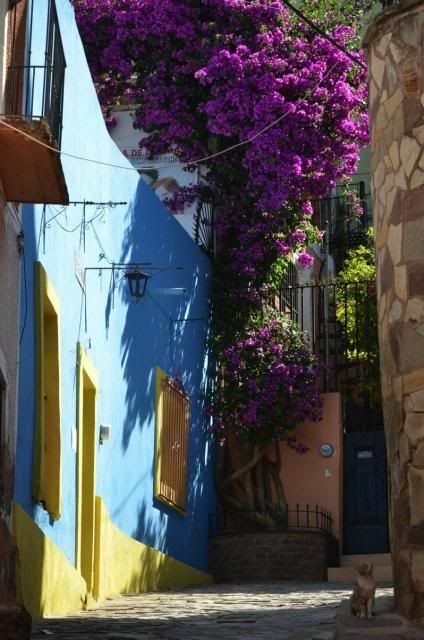 - Callejon del Potrero #2x, Guanajuato. One of the hazards of traveling with me is that you are always waiting. Why? Because I am always stopping to take pictures. Most of these pictures don't make it into our trip reports because they don't specifically apply to the activities we were doing or what I happen to be writing about. These may not necessarily be the best shots but sometimes they end up being the ones that really show you what a place it like...how it feels to actually be there. Rob and I both LOVED GTO City. 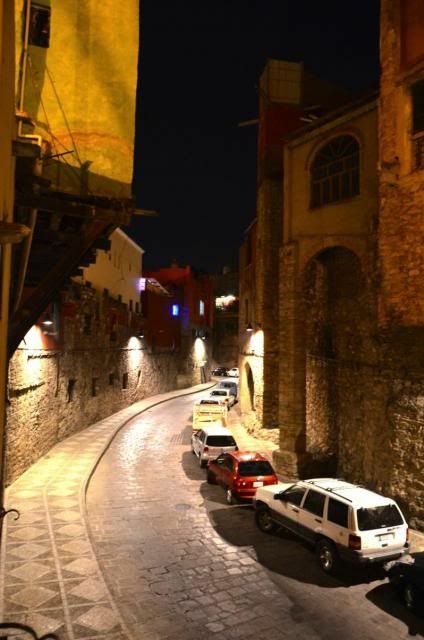 It is vibrant and young and hip yet authentic and historical all at the same time. The vibe is really great! Everywhere you look there is art and music and theatre! I can't tell if the city is just on the cusp of a foreign investment/tourism boom or if it's just going to stay the way it is, sort of suspended in time. Upgrades have been made recently to the roads and underground tunnel systems to allow for increased traffic and less congestion within the downtown area. You can tell that municipal tax dollars are actually being funneled back into public works and support services to benefit residents and visitors alike. The upscale restaurant and fine dining scene is small but growing and if they could create a better artisans market, I think more people would consider the city as a destination. 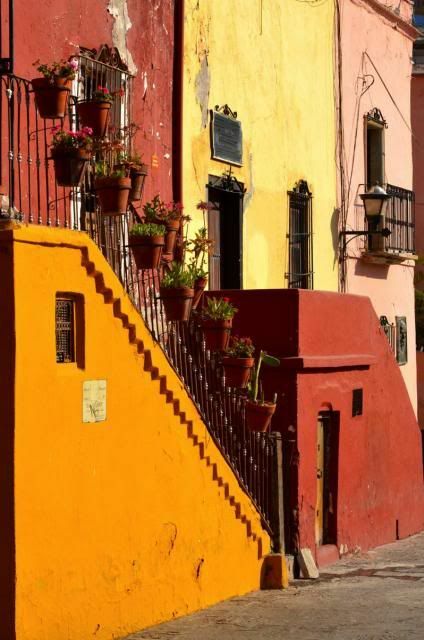 Maybe nearby San Miguel de Allende popped first and Guanajuato is simply getting overlooked. I can tell you for sure that both Rob and I would like to come back to this city. So here you go. 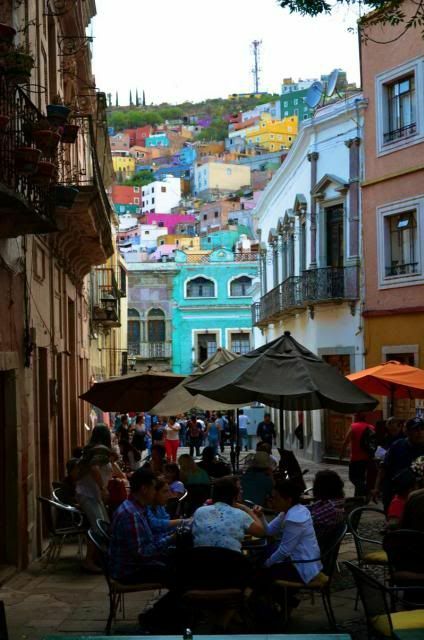 What the average day in Guanajuato looked like through my eyes and my lens. Pretty Spectacular. We'll be back! Today, I woke up early and ran out to Oxxo (yup, they're everywhere) to grab another bag off coffee. We had a great day with Israel but everyone was pretty tired and definitely sleeping in. The next door neighbor's dog was there to greet me, as usual when I left. 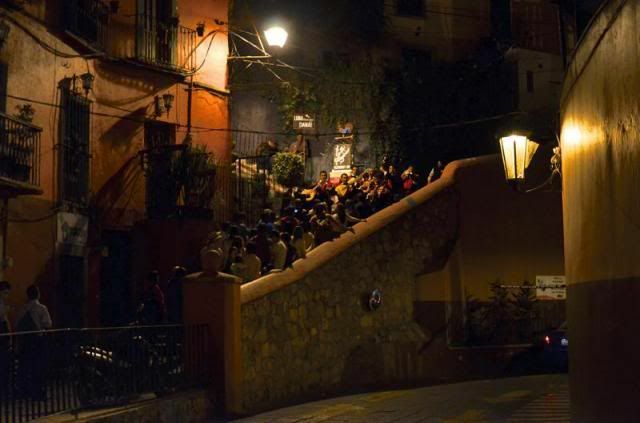 The streets were already bustling with activity, everyone going from church to church collecting fistfuls of camomile flowers in preparation for Good Friday. 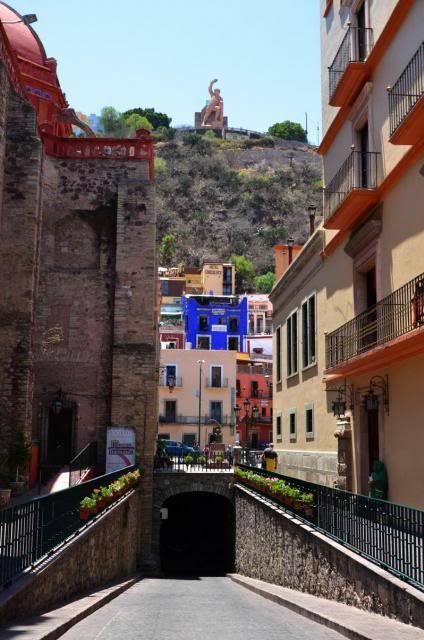 This was our last day in Guanajuato City and the plan today was to hit a few more of the cities most famous points of interest. 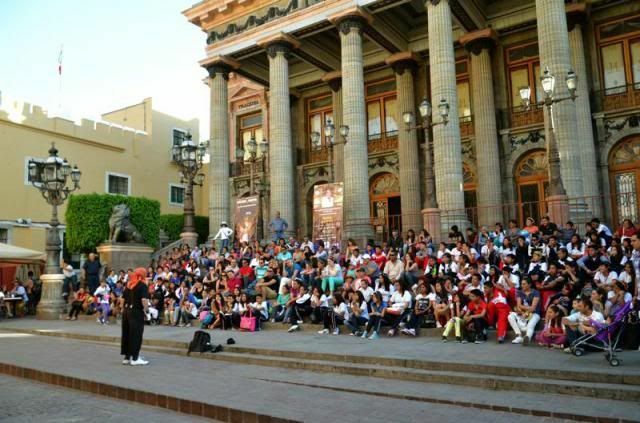 I was pretty sure I would be on my own for the first hours so I made the Teatro de Juarez my first stop. 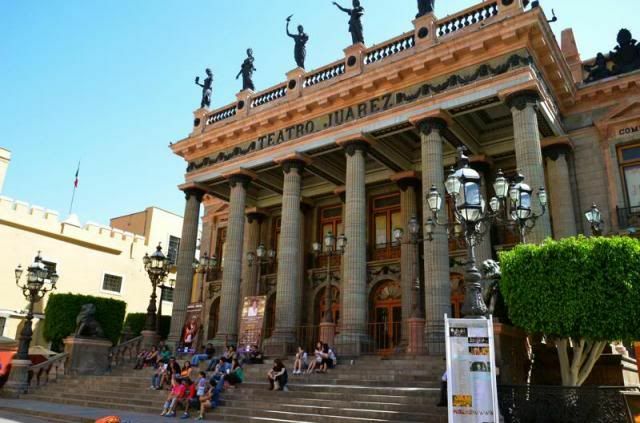 The Teatro Juarez is one of the iconic buildings that surrounds the Jardin Union. 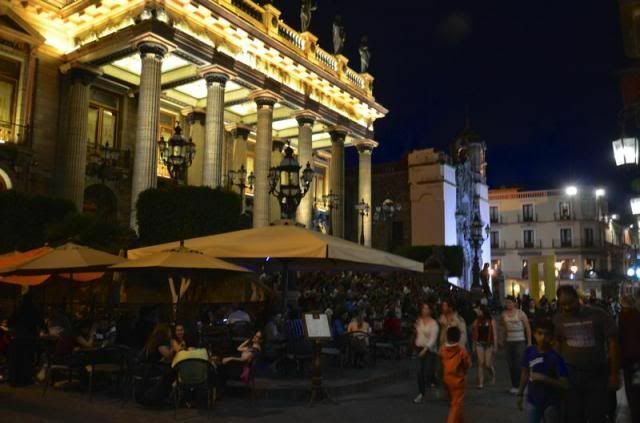 The theatre is a beautiful example of neo-classic design that was completed in 1903 and inaugurated by General Porfirio Diaz. Its most distinguishing exterior features are a double line of doric columns and the Greek muses which crown the facade and look out over the Plaza. 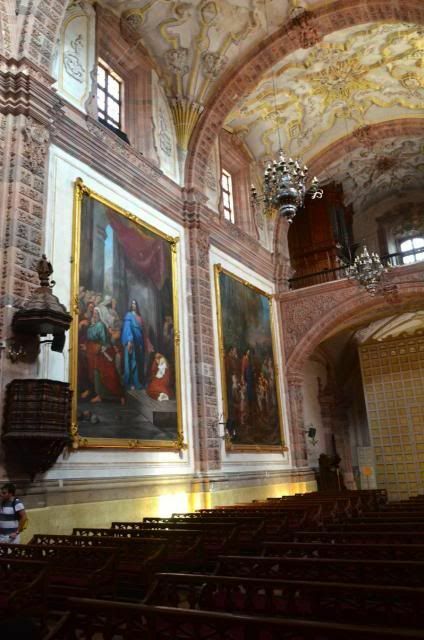 The auditorium is absolutely stunning and remarkable in that it is the only theatre in Mexico that has managed to maintain all of its original decoration and furnishings. The theatre is in use year round offering all sorts of artistic activity, from theatrical performances, ballet and music to painting and photography exhibitions. 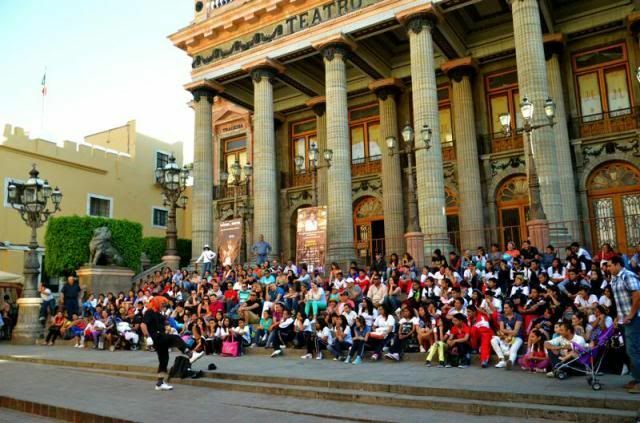 The grand auditorium also functions as the main performance space for the International Cervantino Festival. 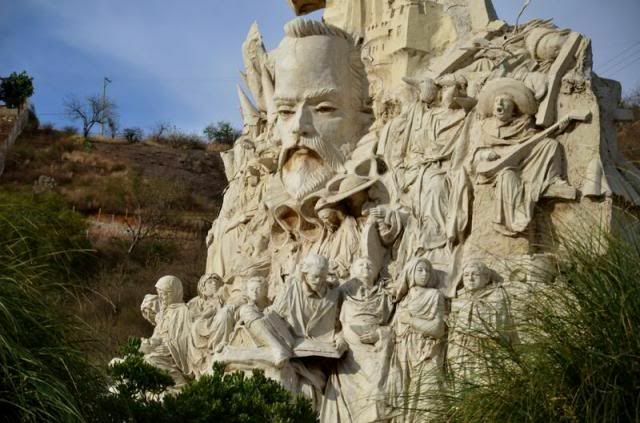 Guanajuato's Don Quijote obsession can be seen not only in its annual International Cervantes Festival but all around the city everyday. 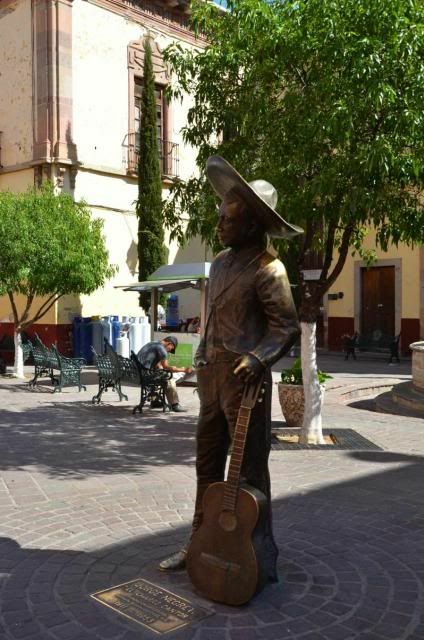 The famous Spanish literary character and his sidekick Sancho can be found everywhere. Of course,the best place to get your Quijote fix is at the Museo Iconografico del Quijote next to the San Francisco Church. 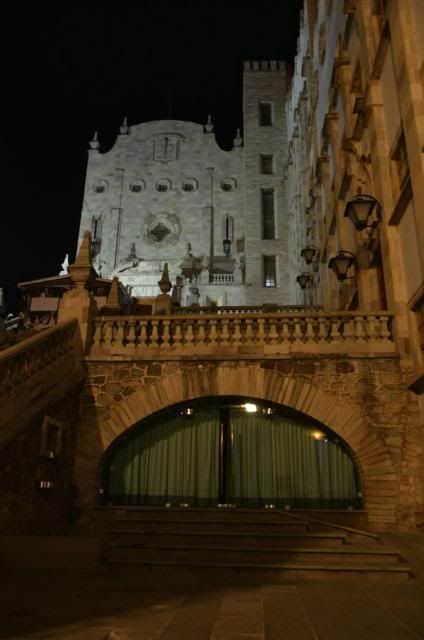 Here you can find a multitude of exhibits featuring Don Quijote. 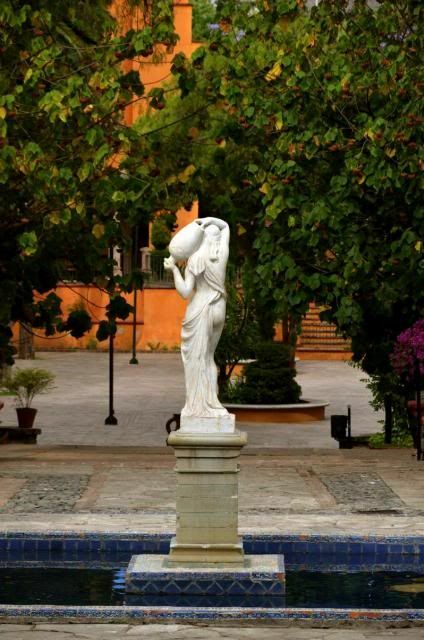 Housed in a beautifully restored 18th century building, the museum exhibits include everything from murals, oil paintings, tapestries and bronze statuary to chess sets, coins, books and even postage stamps. 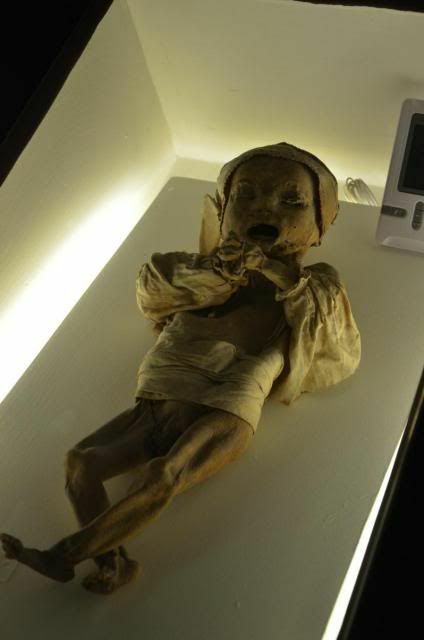 The museum was wonderful and even the kids seems to enjoy seeing all the varied depictions of the same character. 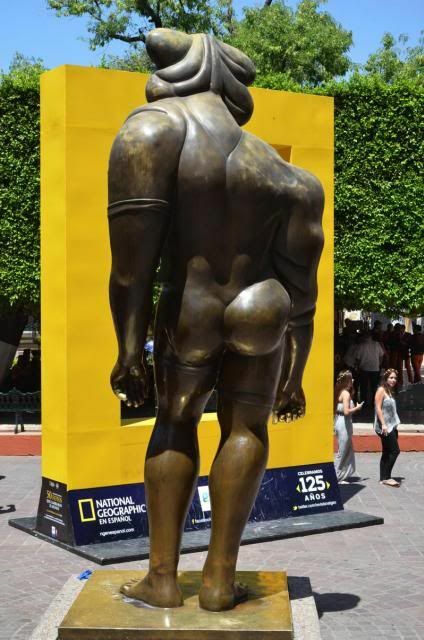 At least they were able to pick out his personage when we saw it in paintings and sculptures around the city. 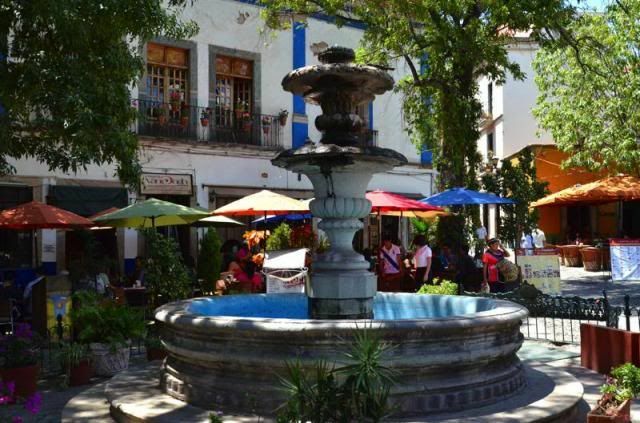 We finished the day hanging out in Plaza del San Fernando, sipping mescal and listening to the street musicians and strolling minstrels. 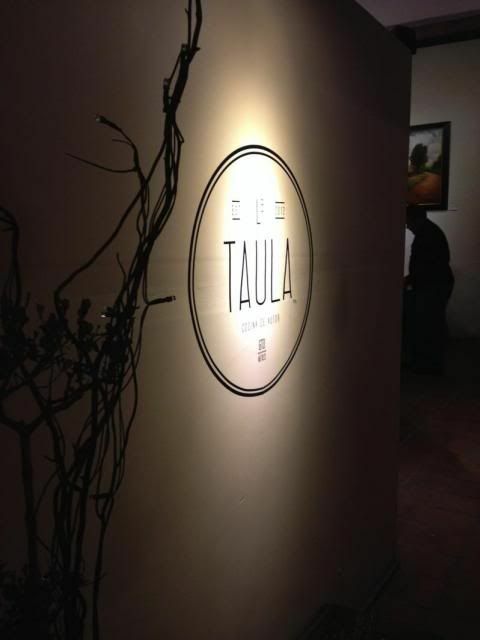 Then we grabbed another great tapas dinner at Taula and called it a night. 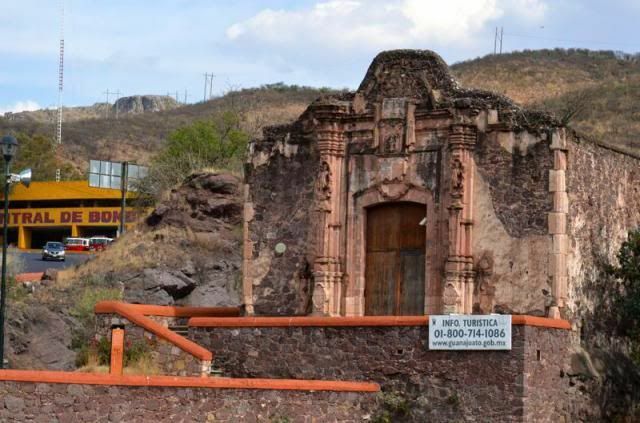 Today, we hired a driver to take us around to some of the outlying areas surrounding Guanajuato City so that we could see some of the important sites that are inaccessible by foot. 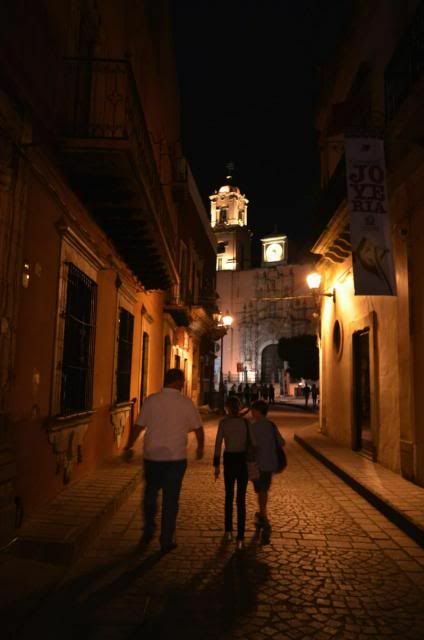 On a regional message board, I found a recommendation for a driver/tour guide named Israel Torres who was available to take us out and around for a few hours in the afternoon. 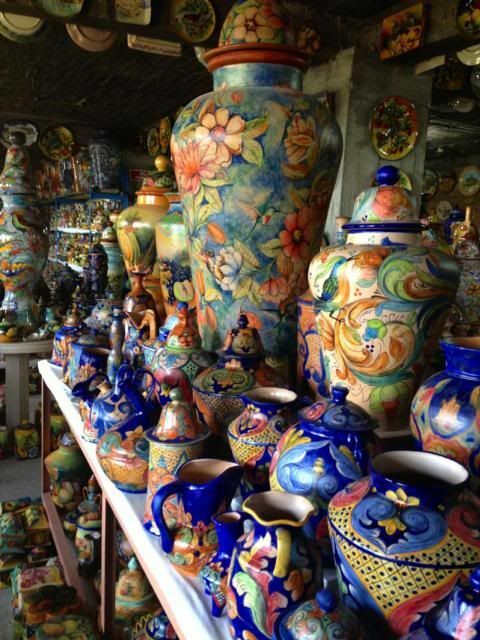 Our first stop was the Santa Rosa majolica ceramics factory high in the mountains. The factory itself was closed for the holiday but the showroom was open for business and Rob and I picked out two lovely pieces to ship back to Playa. 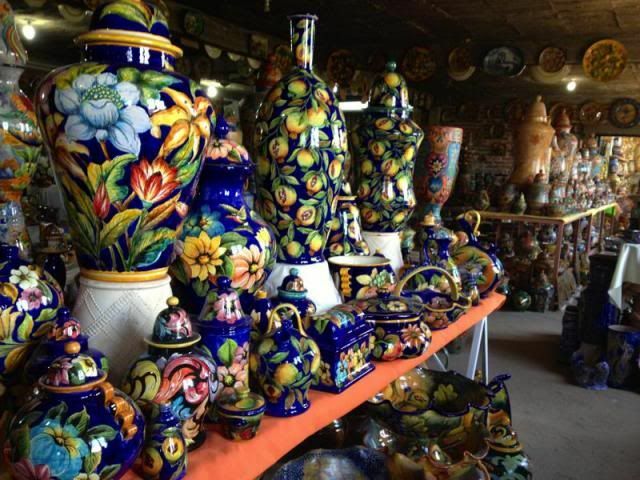 They had a dizzying array of styles and patterns and if you are in the market for such decorative items, I would say this is the place to go. Photography is not allowed inside the showroom but we are going to assume I didn't see the clearly posted signs. 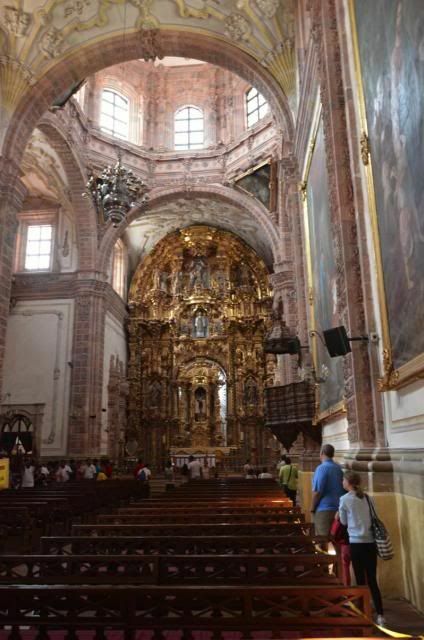 From there we went to see some of the mines that made Guanajuato famous and the spectacular Templo de Valenciana. 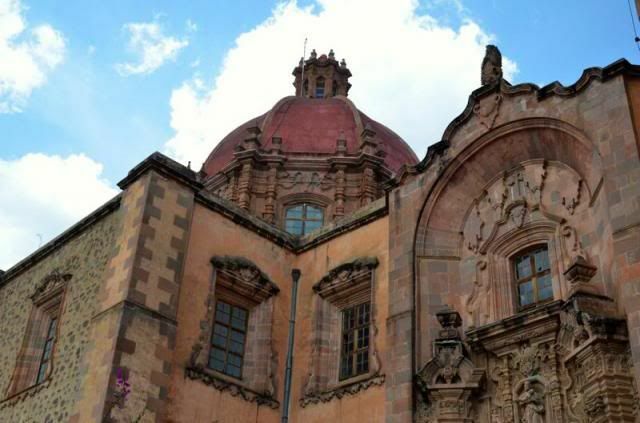 This spectacular church has a rose colored facade and is a one of Mexico's best examples of Churrigueresque (Spanish Barouque) architecture. 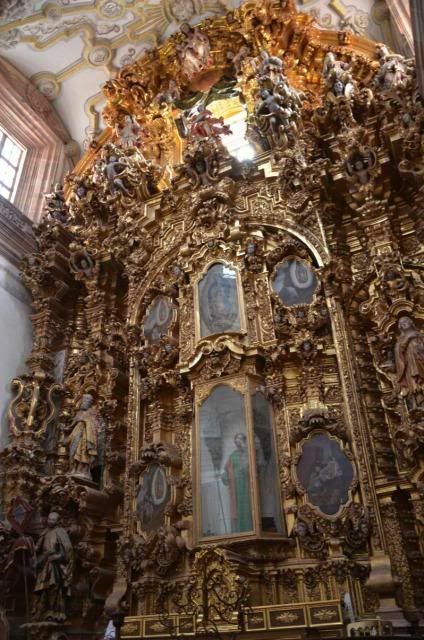 Inside there are three ornate gold altars and many fine paintings from the 19th century, all in pristine condition. 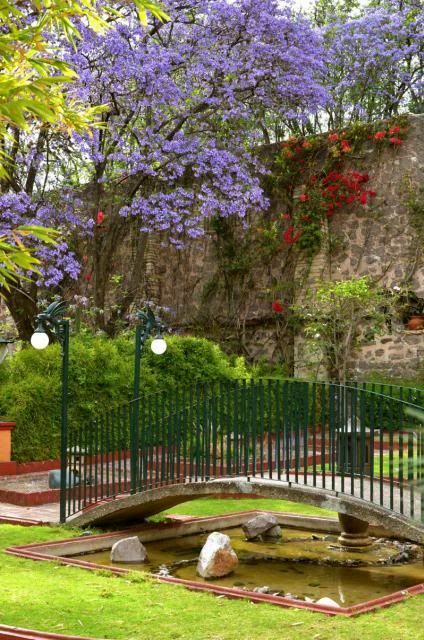 After a quick pit stop at the Castillo Santa Cecilia, a former 17th century mining hacienda re-purposed as a hotel, we decided to visit the gardens of Hacienda San Gabriel de Barrera, another fantastic mining hacienda notable for its elegant and exquisite themed gardens. 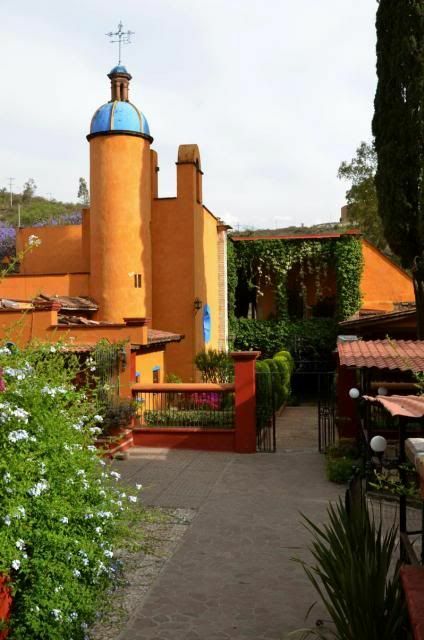 I had done a search online before we arrived in hopes of finding another great spot like the Ethno-botanical Garden in Oaxaca but all I could find were pages and reviews for El Charco in San Miguel de Allende. 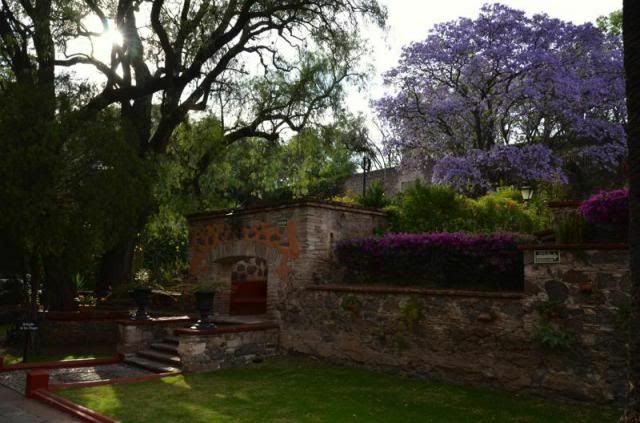 You can imagine my surprise when Israel brought us to this beautiful property now owned and maintained by the government of Guanajuato as a state treasure. 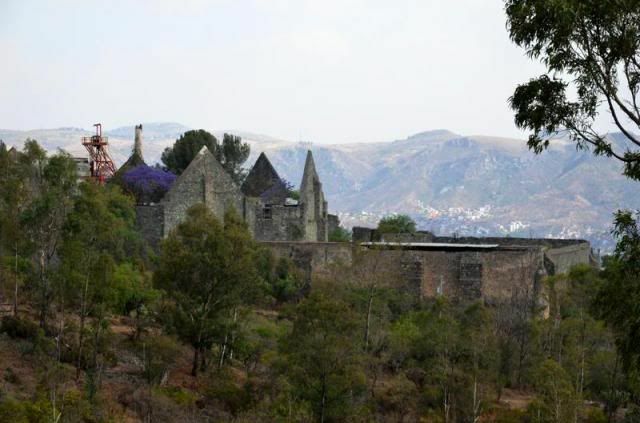 Constructed at the end of the 17th century, this was the home of Captain Gabriel de Barrera, whose family was descended from the first Conde de Rul of Guanajuato's famous Valenciana mine. 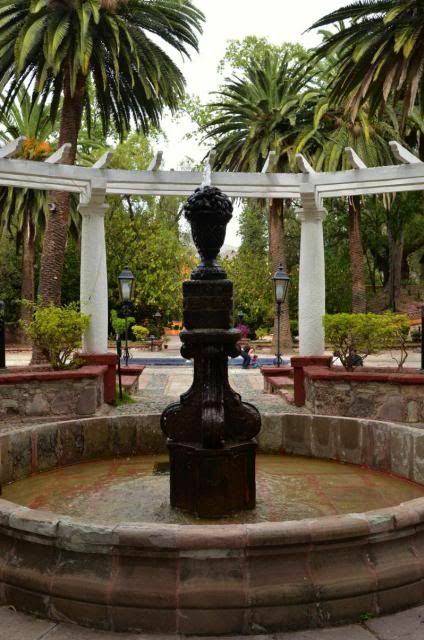 The grounds are fairly well maintained and is now open to the public and used for weddings, conferences and governmental meetings. 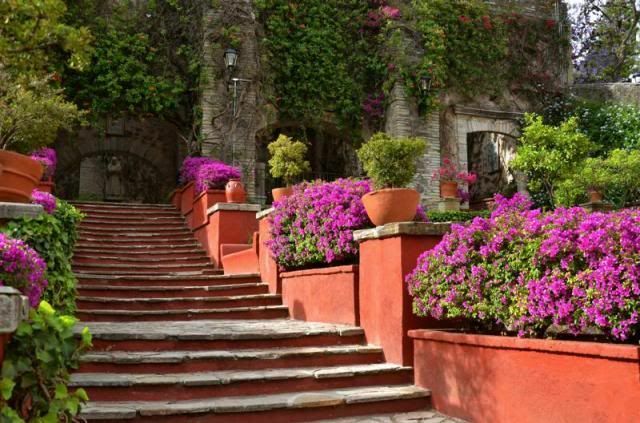 If you have visited the vast haciendas in the Yucatan, this might be a bit disappointing. When we were there there were no tours offered in Spanish or English but we enjoyed wandering through the grounds and stopping for a cold beer in the cafe onsite. With some time to spare before our dinner reservation at Las Mercedes, Israel drove us through some more of Guanajuato's influential neighborhoods and to see some of its most important monuments, historic buildings and places of interest like the Presa de la Olla built in 1749 to hold the city's water supply. 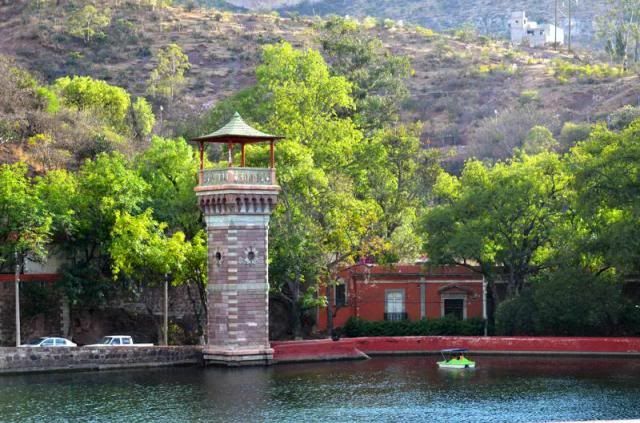 Today it is a beautiful park-like setting where people picnic in the nearby gardens or take paddle boats out onto the reservoir. There is a restaurant on the shore which looked like a popular place to meet for lunch. It was a hot day and we saw a few people swimming to cool off. After our tour, Israel dropped us off at Las Mercedes, a highly renowned, reservations-only restaurant high in the hills over the city. 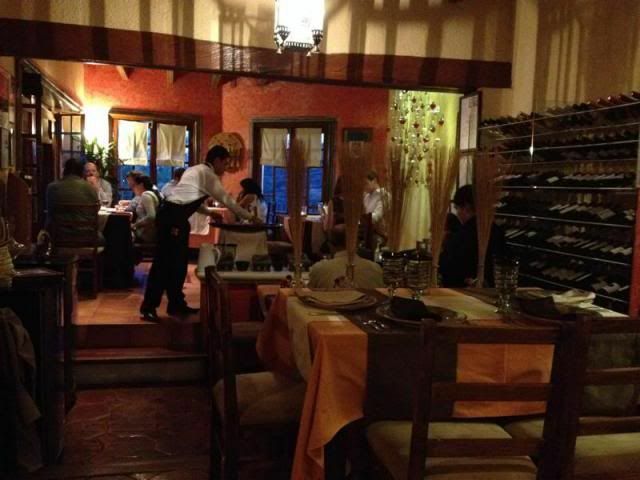 Located in the home of the owner, Las Mercedes offers delicious alta Mexicanana cuisine in an elegant setting. 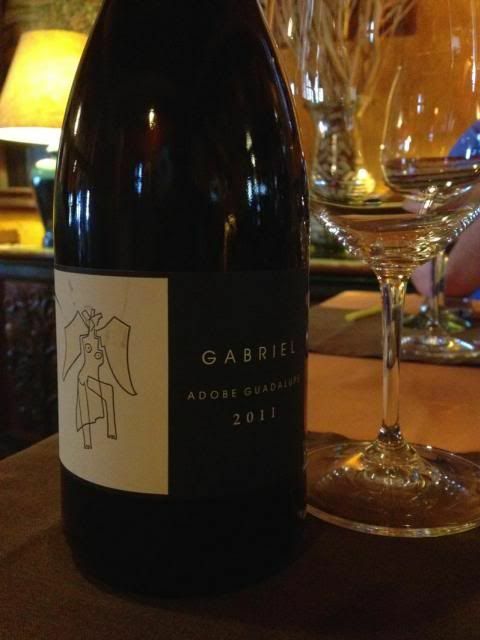 The wine list is fantastic and we had no trouble finding one of our favorites, Gabriel from Adobe Guadalupe. There are only a handful of tables and plenty of staff bustling around giving fantastic service to all. At the end of our meal we met the owner, Sr. Jesús Cárdenas, who was so gracious and obviously very proud of his home, his business and the food they create. 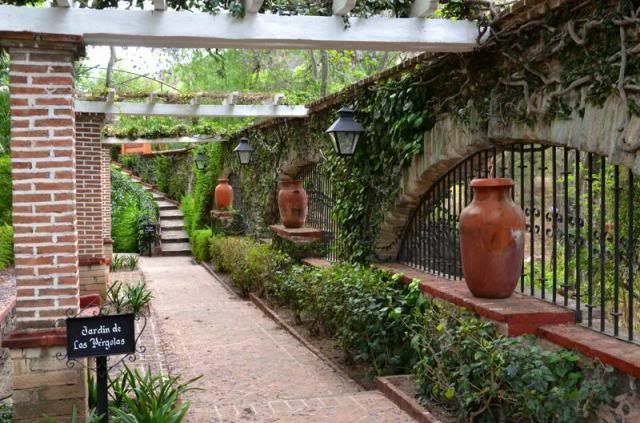 If you find yourself in Guanajuato and want to splurge on a fine dining experience, this is the place. Highly recommended. This was a fantastic day and I really can't recommend Israel and his services highly enough. I think what impressed me the most was how proud he is of his state and of the state government. In Qroo we don't often here too many people complimenting, much less "showing off" the work that has been done by the government for the state and its people. Yet, that's exactly what we heard and saw all day with Israel. 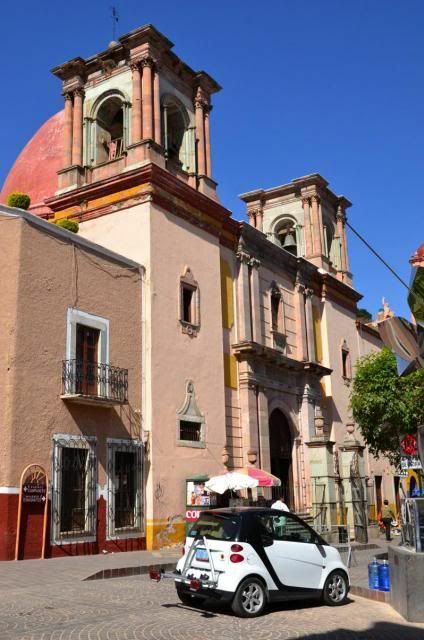 At every turn we saw examples of the government stepping in to preserve and maintain buildings and properties important and meaningful to the history of the region. 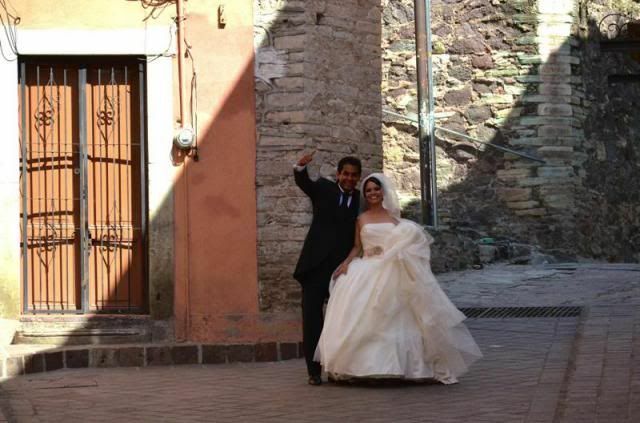 This was such a nice change and made us even more glad we had decided to visit Guanajuato. 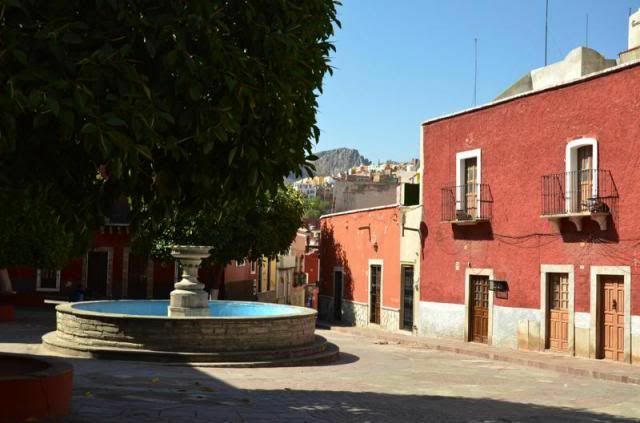 If you are in the area and would like to see Guanajuato with Israel Torres, he can be contacted by phone at 473-597-3953 or email IsraelT2007[at]hotmail.com. 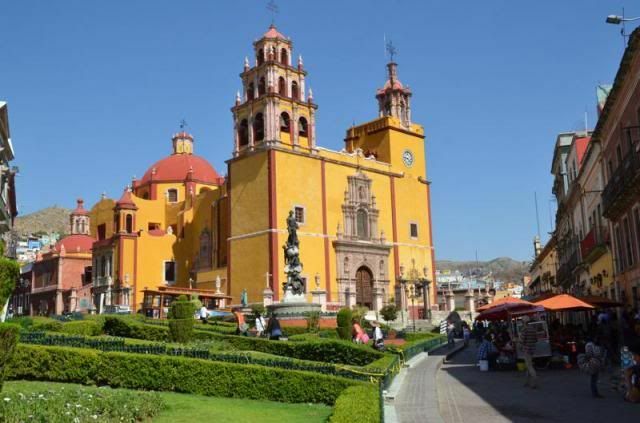 He also does tours to San Miguel de Allende, Dolores Hidalgo and other destinations in this fascinating state. Let him know I sent you! Today was the first day that everyone really felt 100%. We have all pretty much acclimated to the altitude although poor Cole is really suffering with the dryness. His poor lips are chapped and cracked despite our best efforts with lip balm. 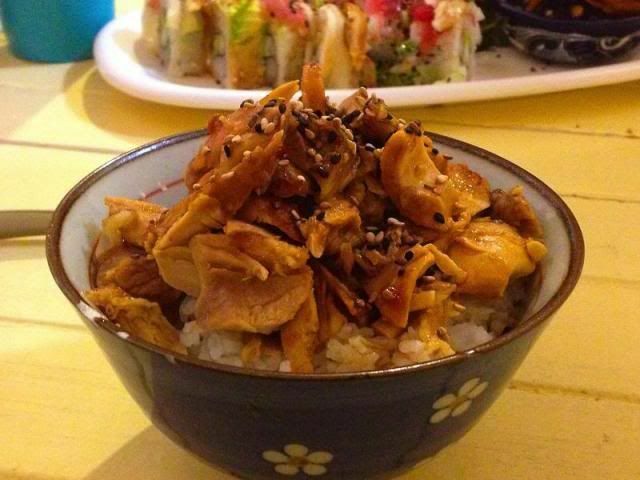 While Rob closed up some deals, the kids and I wandered around town and went in search of a little Japanese hole-in-the-wall that had been highly praised online. 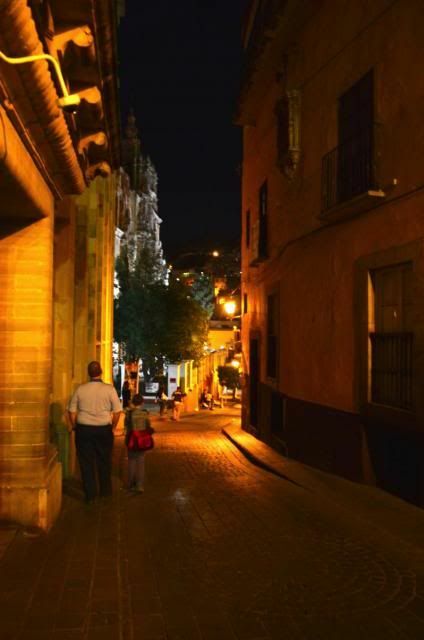 Despite being only a 10 minute walk from our house, it took us 30 minutes and several sets of directions from sympathetic shop owners to get us to the tiny locale, tucked away in a narrow alley off the the Plaza de San Fernando! 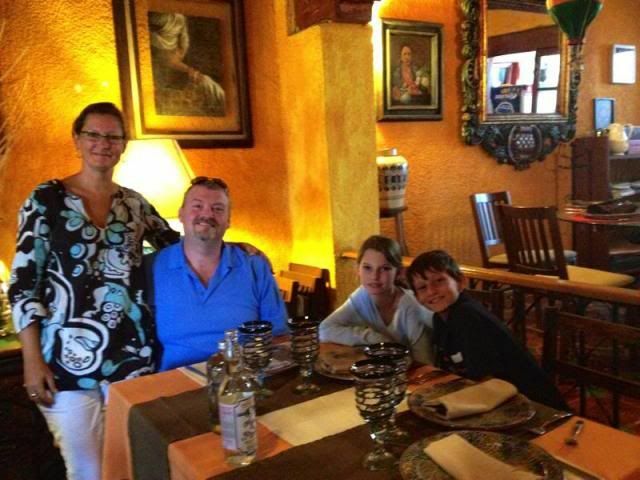 So glad we made the effort as it was a terrific lunch with authentic flavors, fresh ingredients and thoughtfully prepared dishes, many of which we would never see back home in Playa. These guys really know what they are doing and obviously love the food they are creating. Delica Mitsu....Highly recommended! 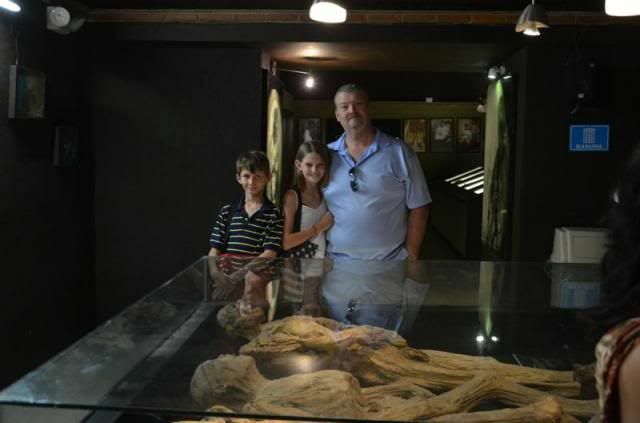 After bringing a bento box lunch back to Rob, we set out to one of our "must-see" destinations, el Museo de Momias de Guanajuato...the mummy museum! 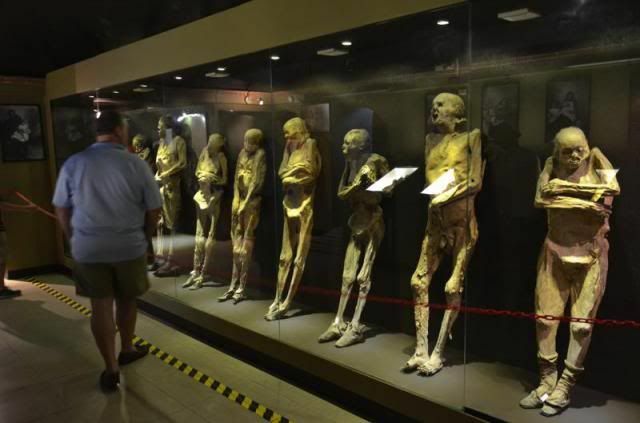 I was still catching some chaff about the awful Museo de Leyendas, so I had my fingers crossed that this would be as fun as our friends assured us it would be. There was certainly quite a line up of people when we arrived which is always a good sign. 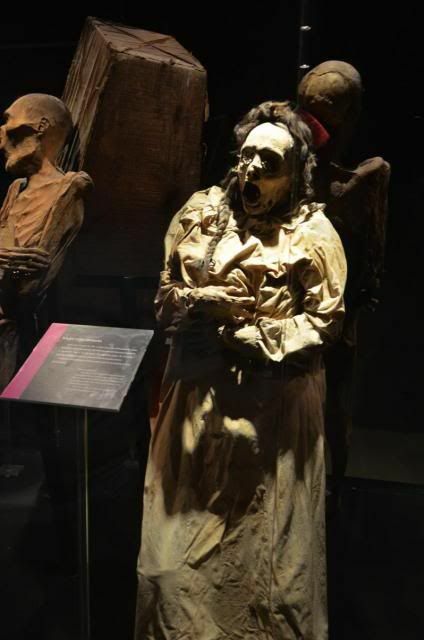 The museum is a narrated tour and only 30 people are allowed in at any time. 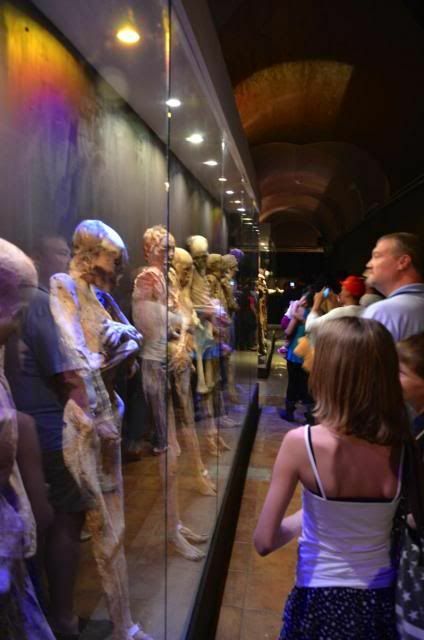 Considering the dark and the cramped quarters, this is a brilliant idea and really allows visitors to view all the exhibits and hear everything the guide is explaining. The tour is conducted in Spanish only, which was obviously fine for us and many of the exhibits have signage in English so you won't too miss much if your language skills are rusty. 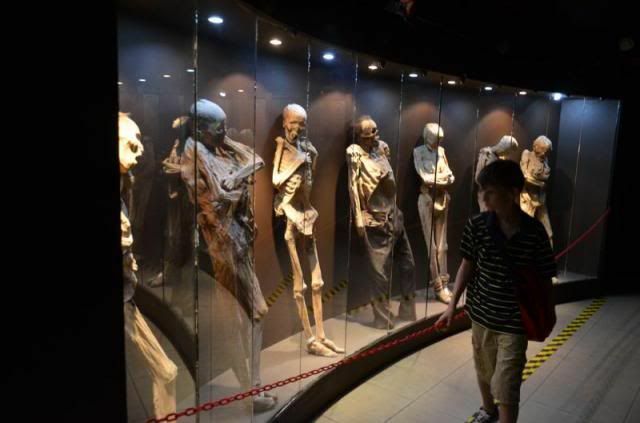 A word of warning to parents visiting with children...If you are squeamish about talking to your kids about certain anatomical parts, beware. 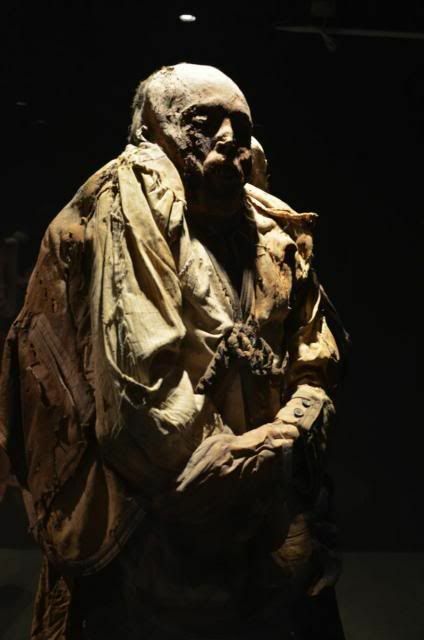 Two words "mummified genitalia". 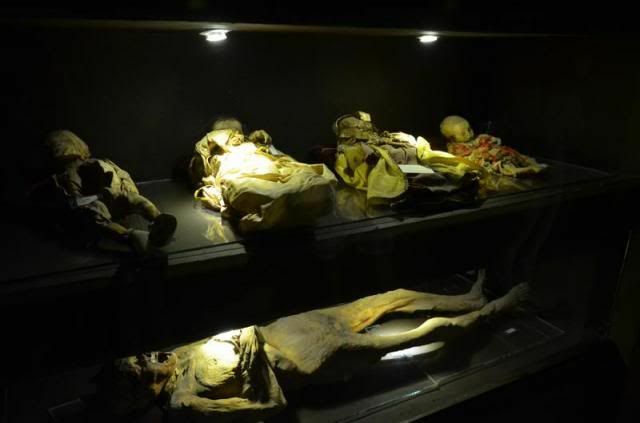 As ghoulish and creepy as it is, we all really enjoyed this museum and it really is a "must-see" if you are visiting Guanajuato. Highly recommended. 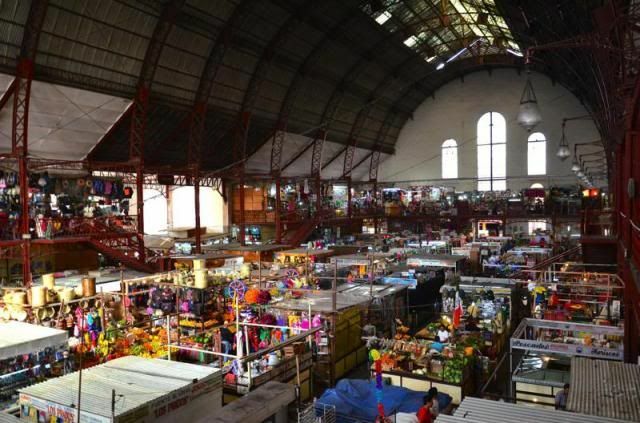 We cabbed back down into the historic centro and made a stop at the sprawling Mercado Hidalgo. Like most things in this city, it is not really set up for tourists although there are plenty of crappy trinkets to be found in the upstairs stalls. 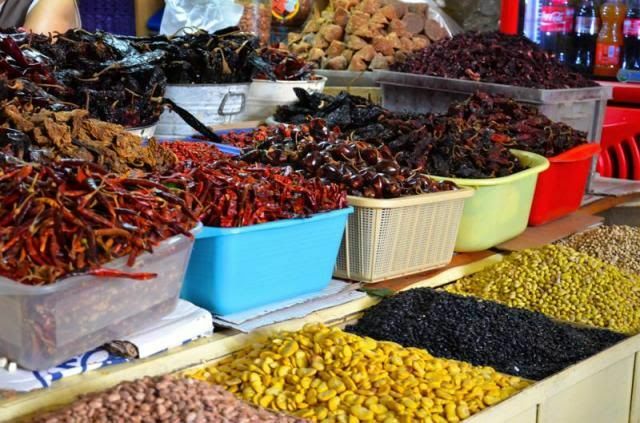 This is a working market with butchers, fishmongers, farmers with produce, chiles and dried beans, vendors selling plastic goods and paper products and other items that small business owners need on a daily basis. 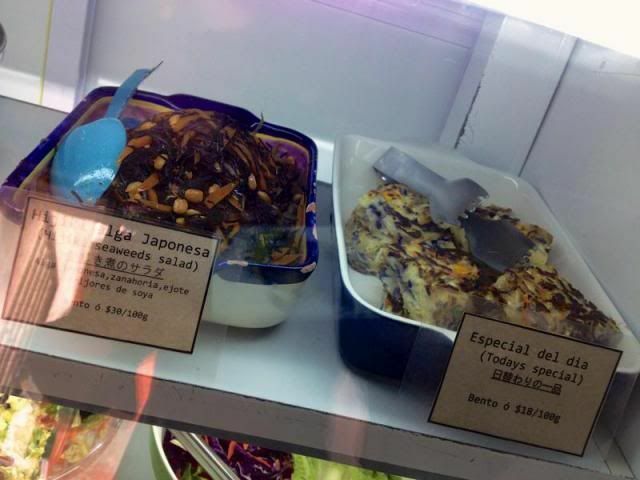 There were also some very tasty looking food counters with carnitas, ceviche, chiles rellenos and all sorts of delicious lunch items. They all seemed to be doing a pretty brisk business. 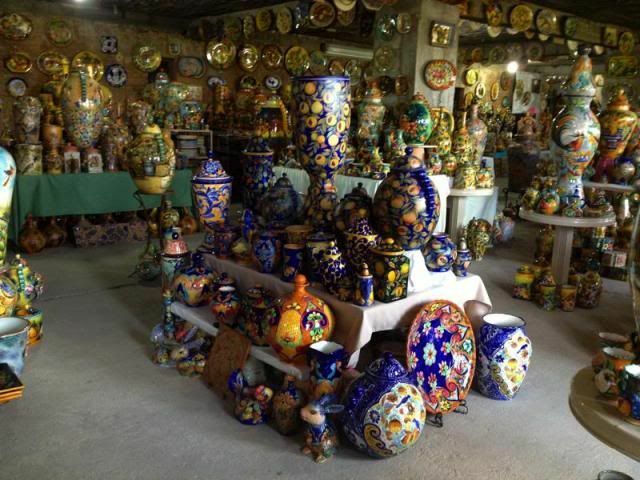 If you are looking for quality handcrafts, this is definitely not the place to find them although Rob did score a bottle of tasty Macademia Nut liqueur. 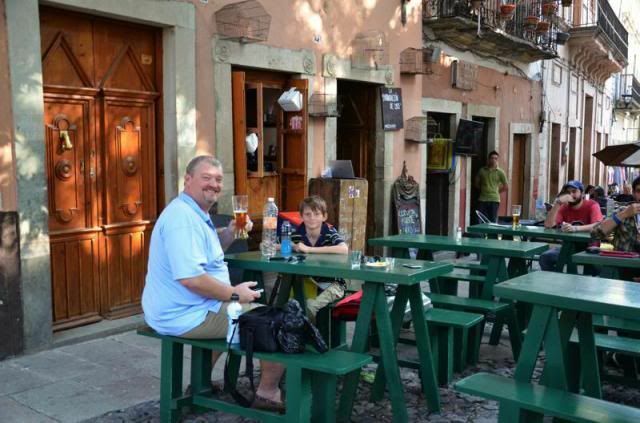 After, the market, we wandered around town looking for a place to sit and relax for awhile and maybe enjoy a few cold ones. 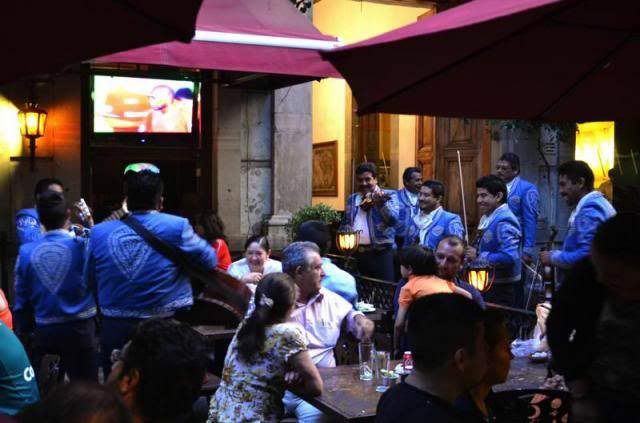 Surprisingly, we wound our way back again to the Plaza San Fernando and found a little hole-in-the-wall bar playing great music and serving up cheep beer and mescal. 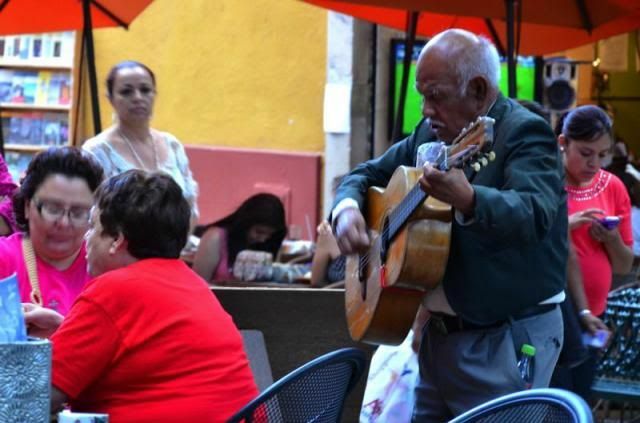 This was a great spot for people watching and the plaza was filled with music coming from all sides. 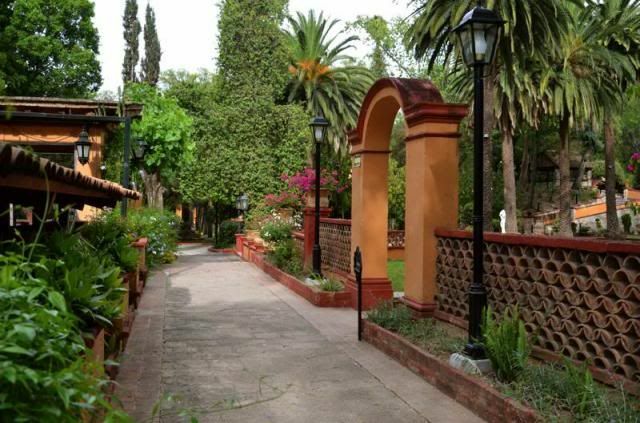 The spot I had scoped out for dinner was quaint little spot off of the Plaza el Baratillo called Los Campos. 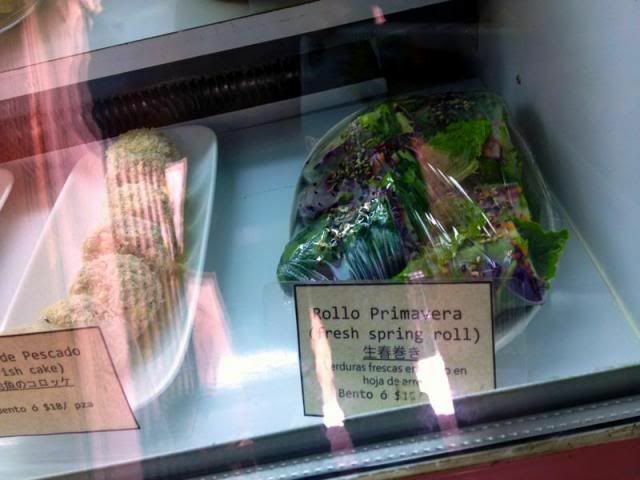 Rumor told that they had a small but thoughtful menu with some nice vegetarian options. 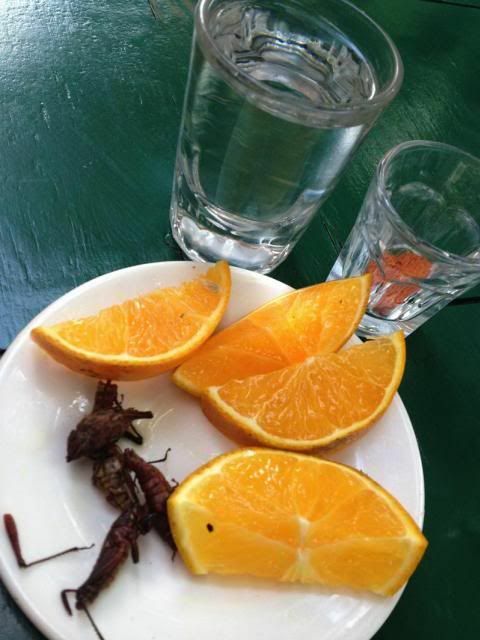 I had also heard that they might not have a liquor license but after 5 mezcals, I wasn't too concerned about booze. 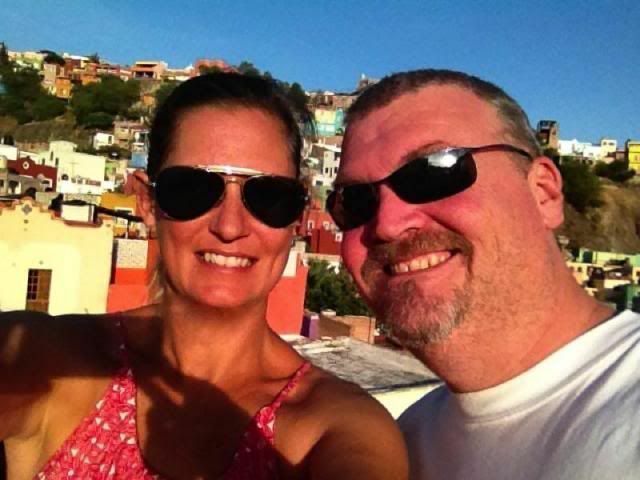 We met the owner, Michael, who actually met his wife on a trip to Playa del Carmen. 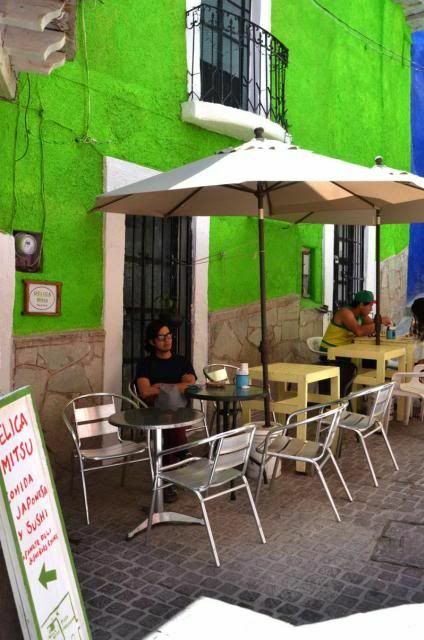 He regaled us with his adventures in starting a business in Mexico with all the trials and tribulations that have come to be familiar to us after 10 years. We all laughed and nodded sympathetically. 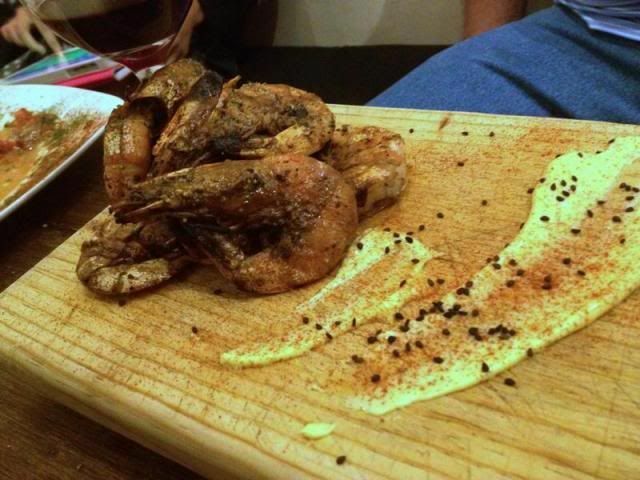 He seemed undaunted by the setbacks and was definitely putting his best culinary foot forward with this place. They are still struggling to get their liquor license but a work around is in place for anyone who wants to enjoy wine with dinner. ;) We tried several items on the menu and everything was really nicely done. 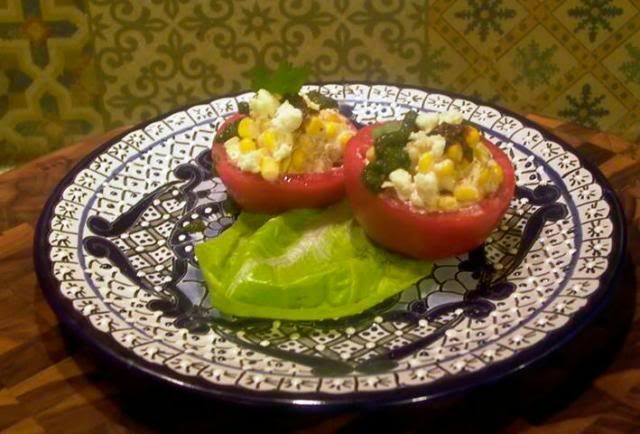 I especially liked the tomatoes stuffed with corn, crema and farmers cheese. 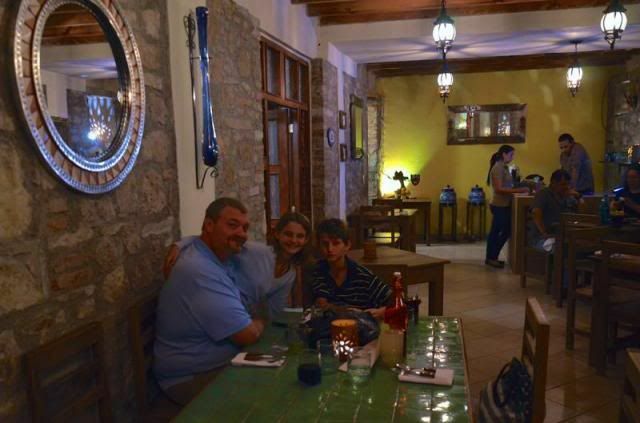 The restaurant itself is very cozy and romantic but too dark to get good food photos so I have borrowed these from their Facebook page. Los Campos - Highly recommended. Today was kind of a bust as Rob woke up to find his back out. Not exactly an unusual occurrence during a vacation and I quickly ran out to the nearby farmacia to grab some strong pain-killers and anti-inflammatories. 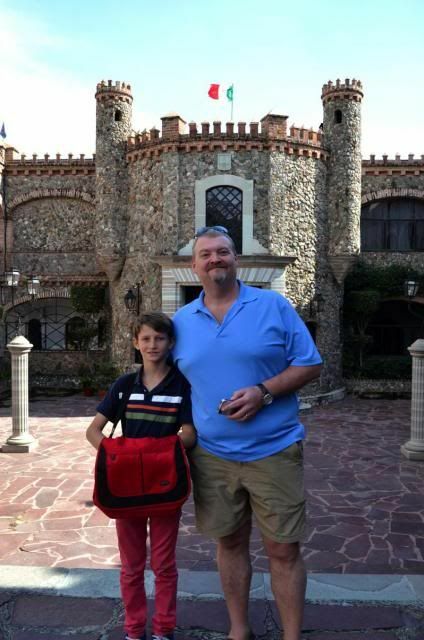 This kids and I went to La Trattoria for a nice lunch which turned out to be some of the best Italian food I have ever eaten since we moved to Mexico. I know it may seem silly, but to get a dish of perfectly cooked and sauced pasta is actually quite a treat. 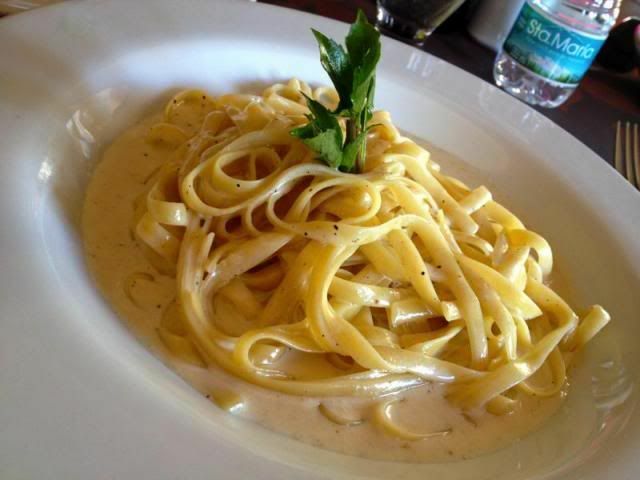 Cat devoured a plate of lamb chops, Cole dug into a wood-oven fired Pizza Hawaiiana and I thoroughly enjoyed a simple yet delicious Fettuccine Alfredo and the Frito Mixto...a second order went home with us for Rob. 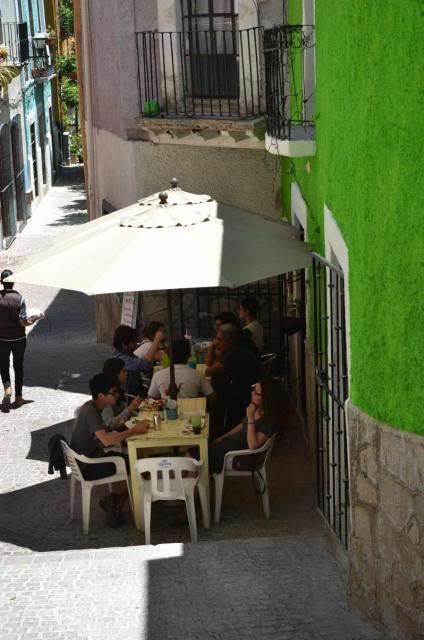 This restaurant is upstairs on the corner of El Jardin de la Union just next to the Templo of San Diego. 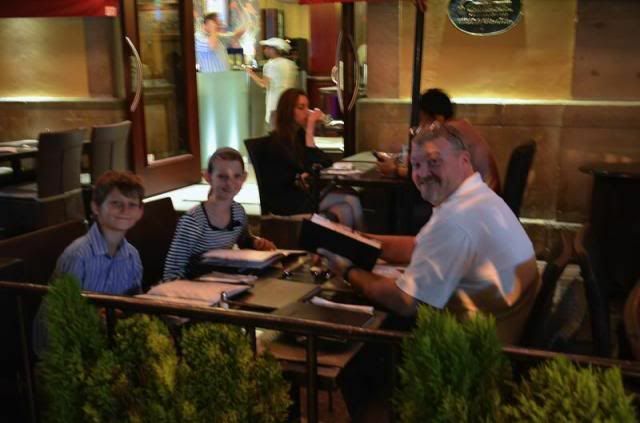 If you can score a table in one of the windows you will be rewarded with not only a great meal but a fantastic view. 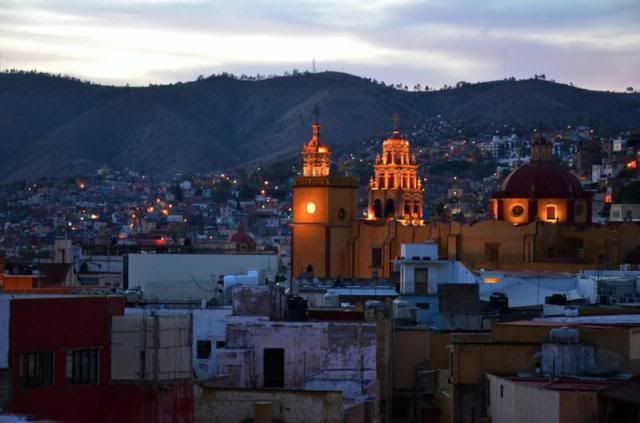 We decided the best way to spend the remainder of the day would to try out all the new Mexican craft beers we had purchased and watch the sun go down from our rooftop terrace. Rob was feeling better, no doubt the combination of high octain beer and painkillers.....It was magical to watch the sun set slowly over the hills and see the lights of the city turn on one by one. 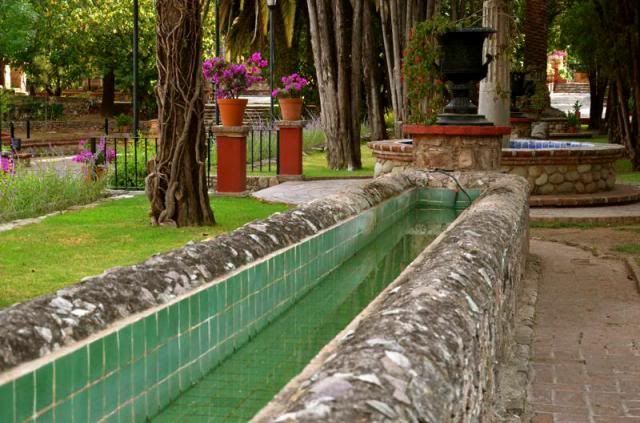 As soon as the sun had disappeared completely, the temperature dropped and we changed for dinner at the nearby and now familiar Casa Valadez. As always, the plaza was abuzz with activity, music and merriment. 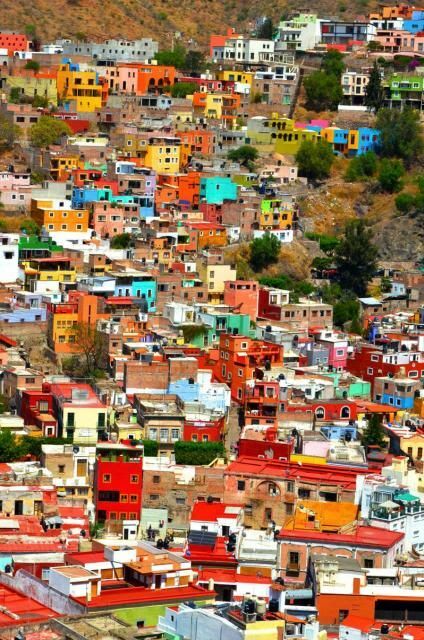 With just one day in town, already we could see that this is an area in Mexico that is truly flourishing. Smartly dressed business men and women and hip university students seem to make up the majority of the people we see in town, sprinkled with tourists, mostly Nationals. 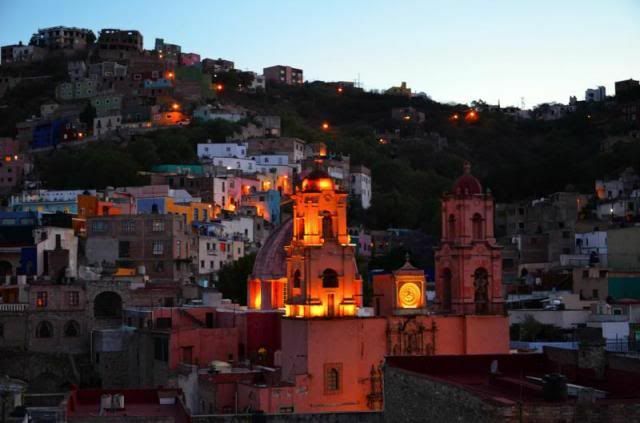 Guanajuato's economy has long benefited from its silver mines, which are among the richest in the world. Other treasures harvested from the surrounding mountains are tin, gold, copper, lead, mercury and opals. The state also leads the nation in the manufacture of shoes and is a major manufacturer of motor vehicles and auto parts. The day we arrived, Mexican President Enrique Peña Nieto and French President François Hollande were here together to inaugurate a new aeronautics plant. If people are struggling here, we have yet to see it but we have not yet ventured outside of el centro. 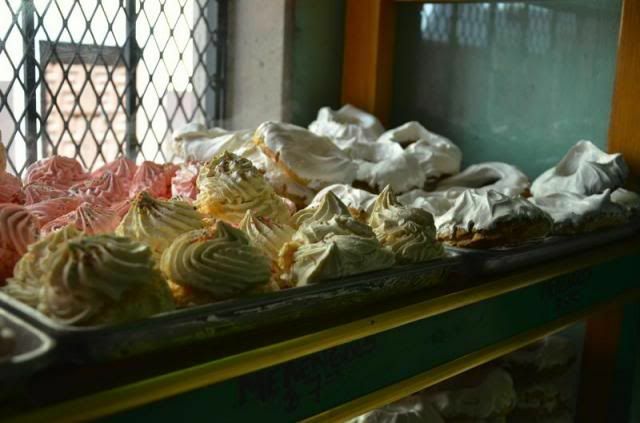 Today, Cat and I grabbed some pastries at the nearby panaderia and brought them back for a leisurely break fast at home. We had no big plans for the day as Rob and I were adjusting to the altitude and not feeling 100%. I uploaded photos, went through email and tried to get some work done. 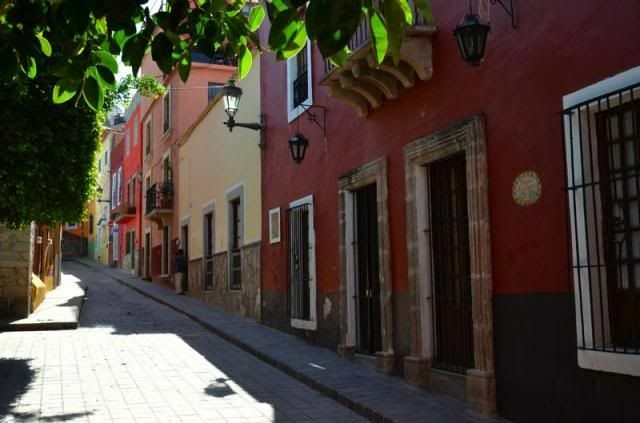 Here are a few photos of our rental house and the neighborhood where we are staying. 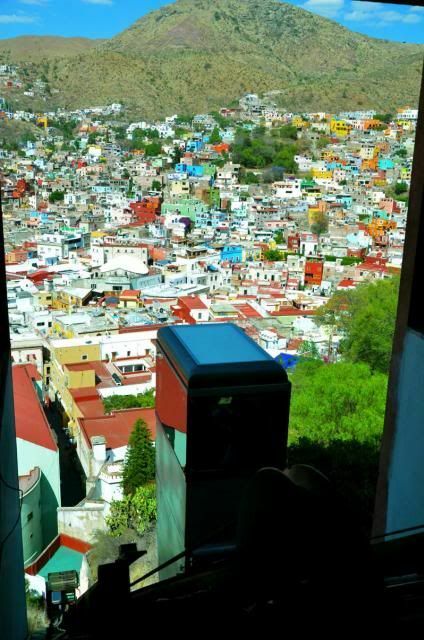 From our rooftop, we have a great view of the city but we really wanted to get up above it all and a visit to "El Pípila", the enormous statue that looms high over downtown seemed like the place to do it. 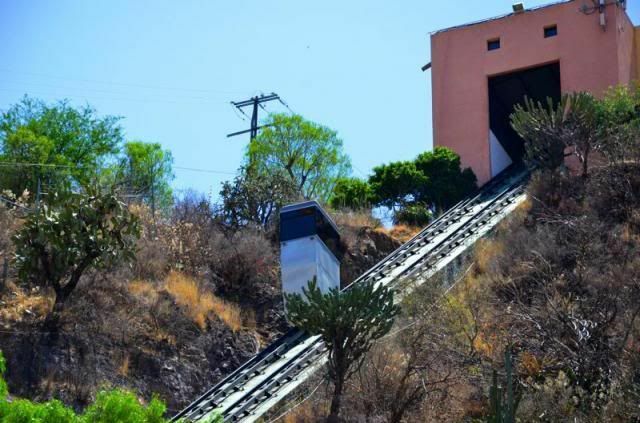 It is possible to hike up there but we decided to take the funicula, a tram which runs up the side of the hill, leaving from behind the Teatro Juarez. 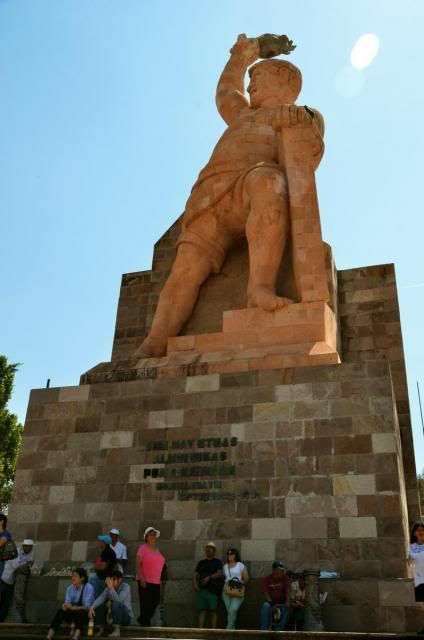 This remarkable statue celebrates the bravery of one Mexico's earliest heroes in its push toward independence, Juan José de los Reyes Martínez, or "El Pípila". He was given the nickname Pípila by his fellow miners because his pock-marked face made him vaguely resemble the egg of a species of native turkey called "pípila." 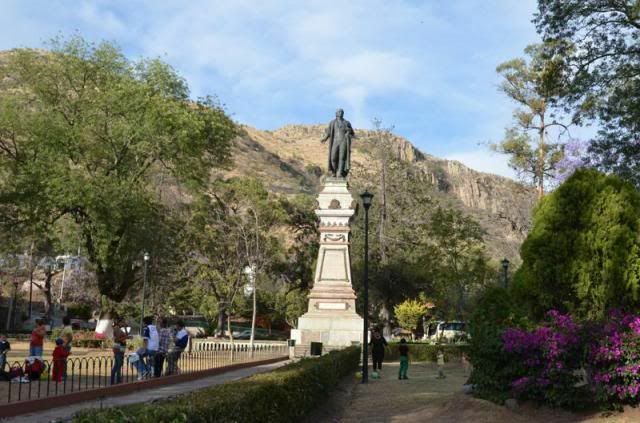 In 1810, the famous revolutionary, Miguel Hidalgo, led an insurgent peasant army into the rich city of Guanajuato. 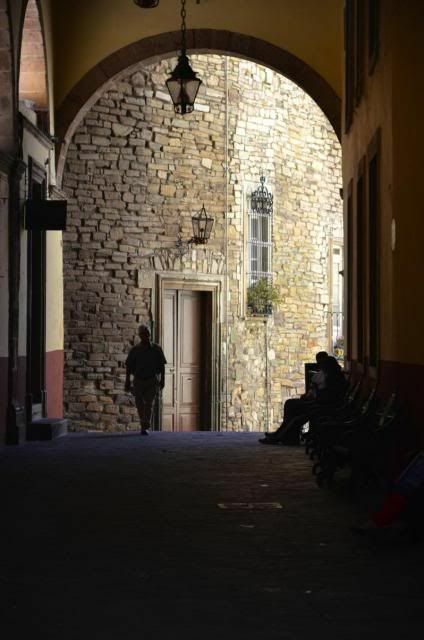 The under-manned Spanish garrison was routed and the surviving soldiers and many wealth citizens barricaded themselves in the Alhóndiga (granary). 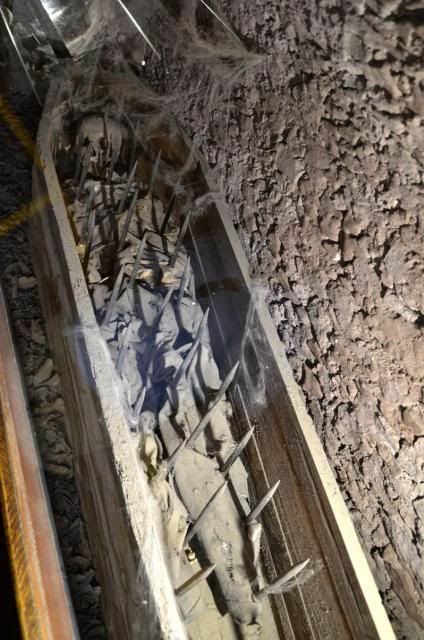 Legend has it, "El Pípila" with a giant slab of stone strapped to his back to deflect bullets, crawled to the granary door with a torch and lit it on fire. The insurgent army then burst through, killing all the occupants. 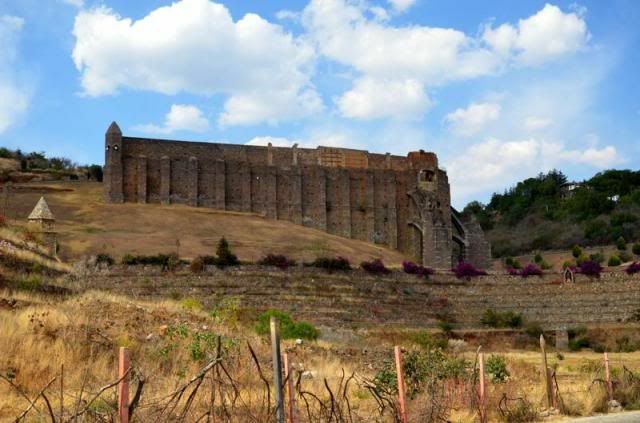 Hidalgo was eventually captured by the Spaniards and executed. 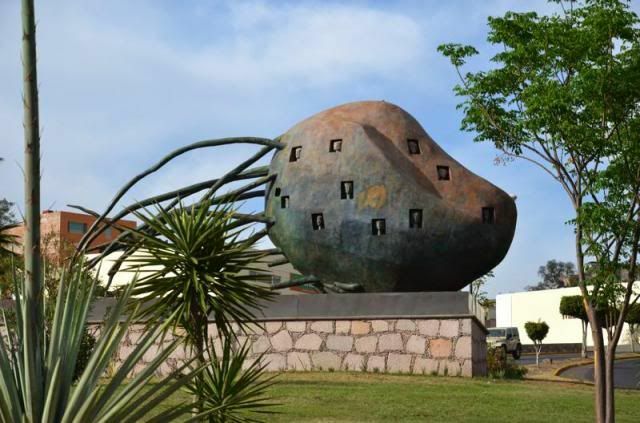 His corpse was decapitated and his head suspended in a wire cage from one of the outside corners of the Alhóndiga. It hung there for 13 years until the fight for independence was finally won. So that's nice. However you find your way up here, the view is magnificent and absolutely worth the trip. 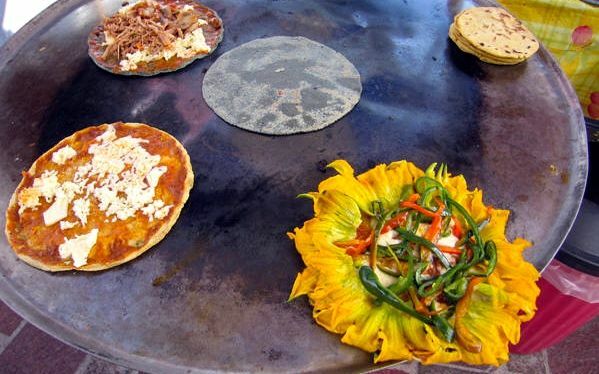 There are the usual trinket vendors at the top of the hill as well as a dozen or so taco carts with fantastic looking food. I was sad we had already eaten. We met a local artist and bought a small lithograph from his collection of portraits of Don Quixote. 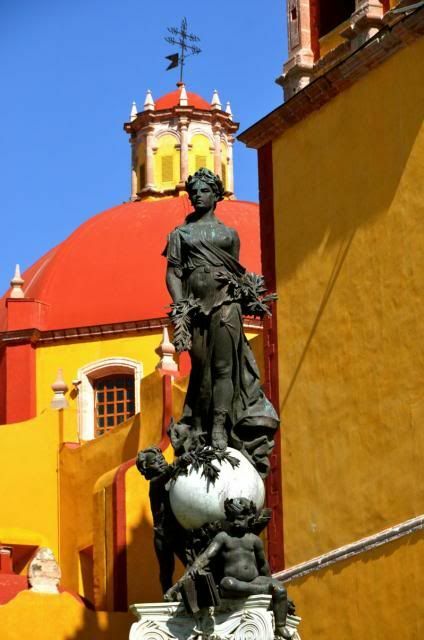 Guanajuato is absolutely obsessed with Cervantes and statues and imagery of Don Quixote can be found all over the city. 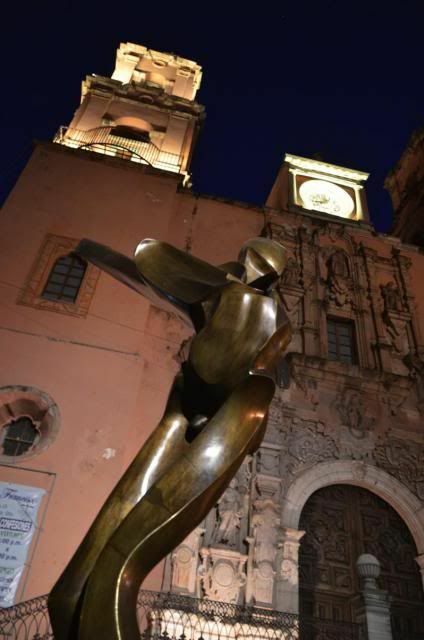 The Quijote Iconographic Museum was inaugurated in his honor in 1987. 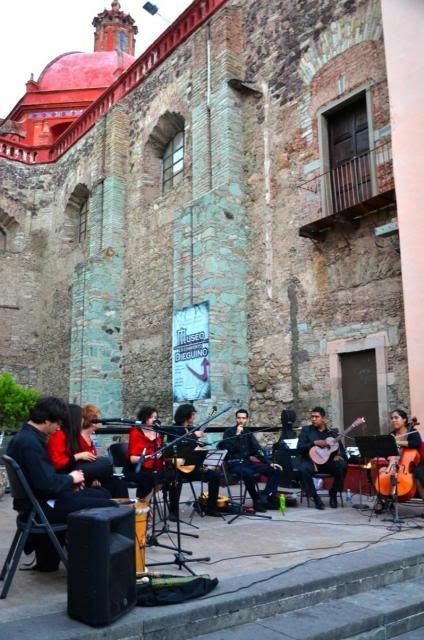 Every year in October, the Festival Internacional Cervantino is held attracting visitors from all over Mexico and around the world. 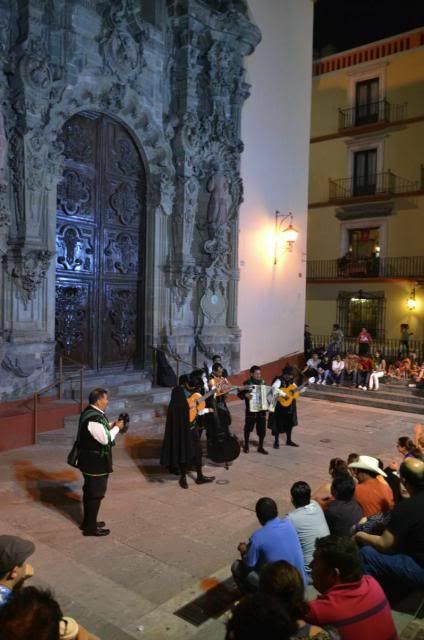 The origin of the Cervantino Festival dates back to the mid-20th century when short plays by Cervantes were performed in the city's plazas. 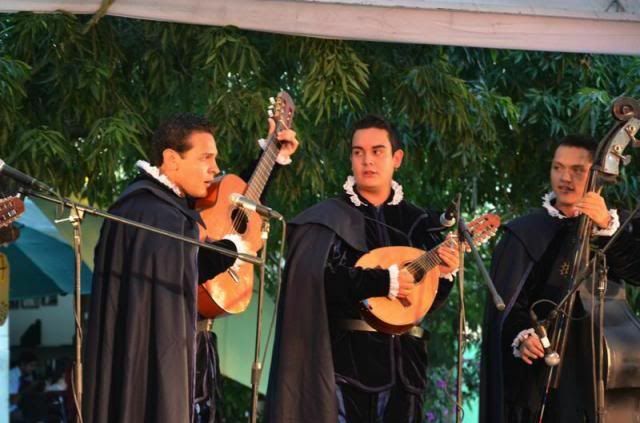 The festival was officially founded and named in honor of Cervantes in 1972. 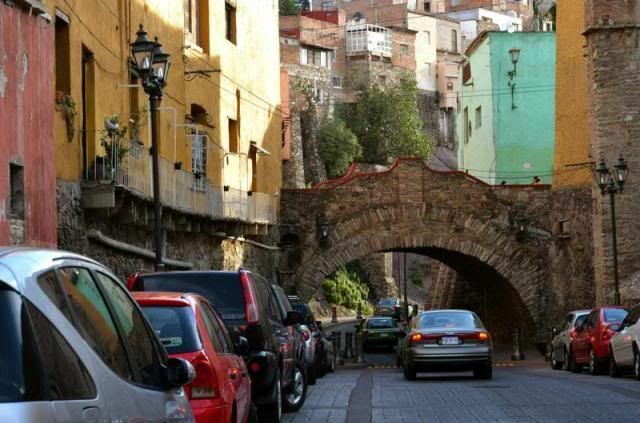 The state of Guanajuato is known as the land of legends due to the residents’ infatuation with supernatural tales such as the stories of El Pípila and "Kiss Alley". 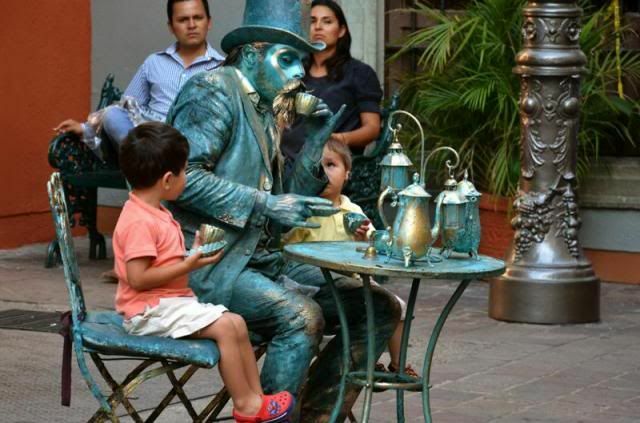 I thought that a visit to the Museo de Leyendas might be fun and give us a brief overview of some of Guanajuato's favorite tales. 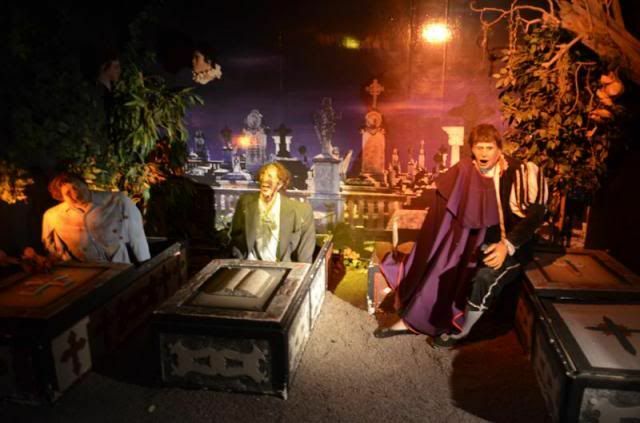 I was thinking it might be a Mexican version of the Salem Witch Museum which we all enjoyed last summer. 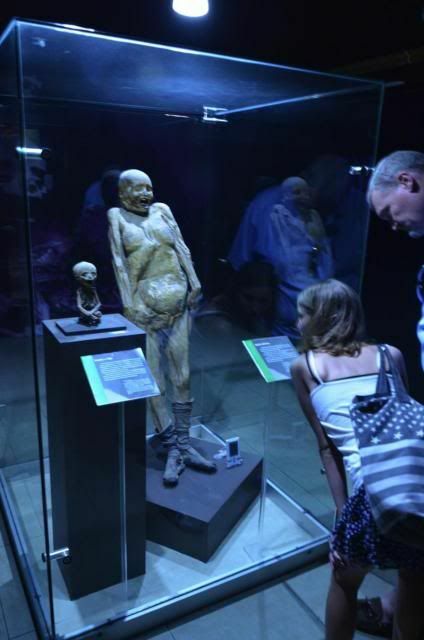 I don't think I can effectively depict in photos just how bad this "museum" was. Truly hokey. Not recommended unless you need a good giggle. There's 30 minutes and 60 pesos I'll never get back. The remainder of the day and evening was spent strolling about town, wander from park to park and sitting occasionally to have a drink when the mood struck. 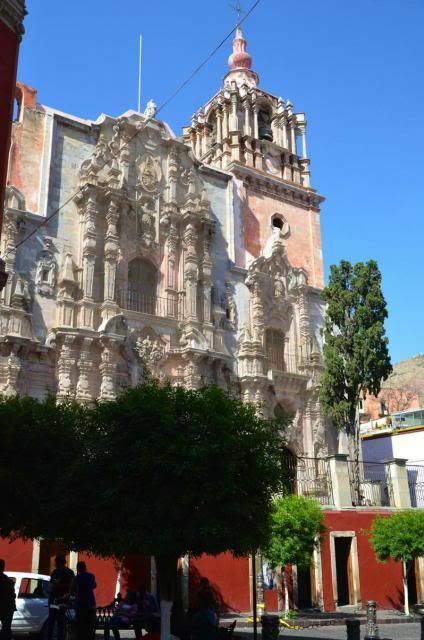 Plaza de la Paz was particularly beautiful so we sat for a bit, enjoyed a pitcher of Clericot (sangria) in the shadow of the grand Basilica Nuestra Senora de Guanajuato and watched the world go by. 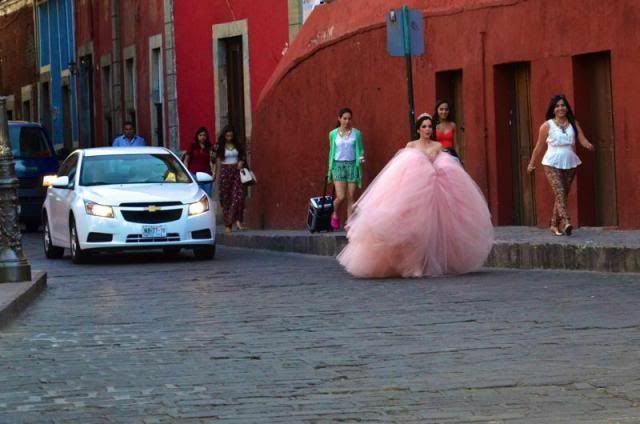 Saturday must be a big day for weddings as we saw three or four wedding parties making their way through the city, taking pictures along the way. 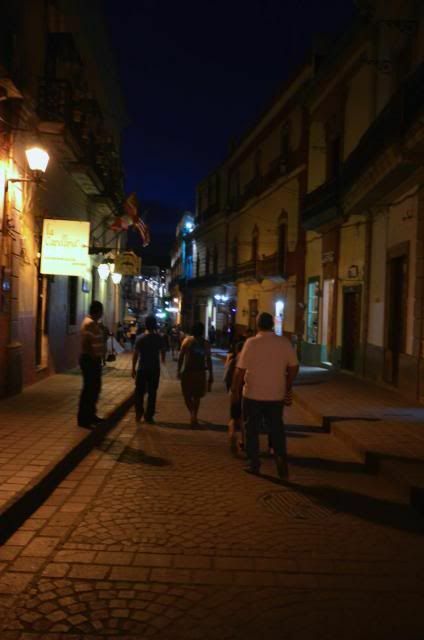 We made our way back to our now favorite spot at Casa Valadez and tried a few of their finer tequila and mezcal while the kids watched one of the many street performers, mariachi bands and musicians who call Jardin de la Union home. Everywhere you look there is art and music and culture. 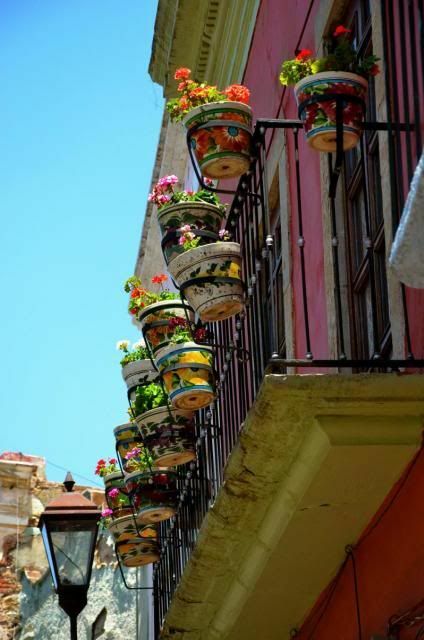 To get here from Playa, we flew out of Cancun and into Queretaro. 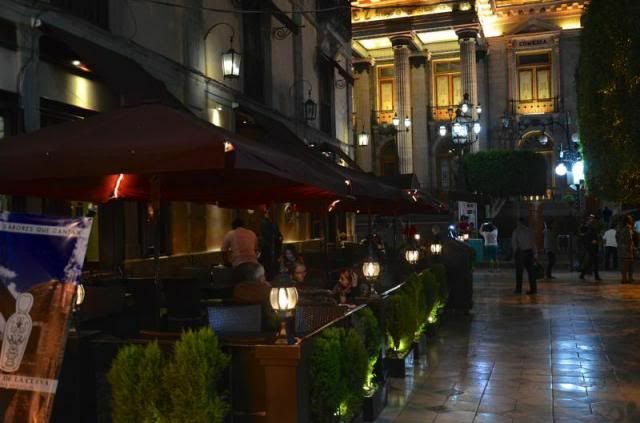 A fixed-rate $350 mn cab ride brought us from the airport to the centro historico where we dined on the patio at the city's famous Restaurante 1810. 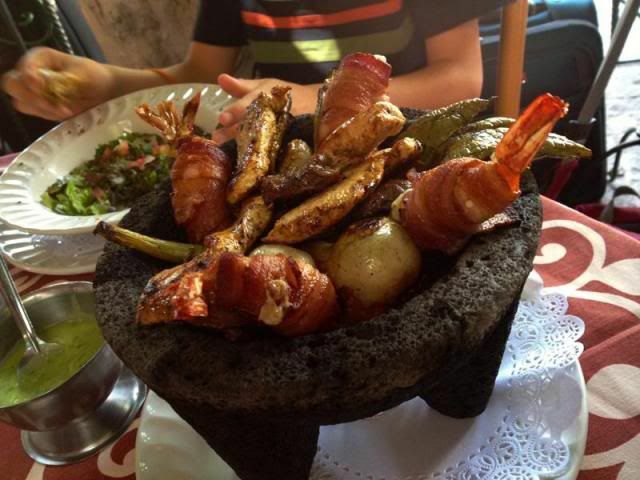 This had been suggested to us by a friend (thank you Diego) and online reports backed up his recommendation. 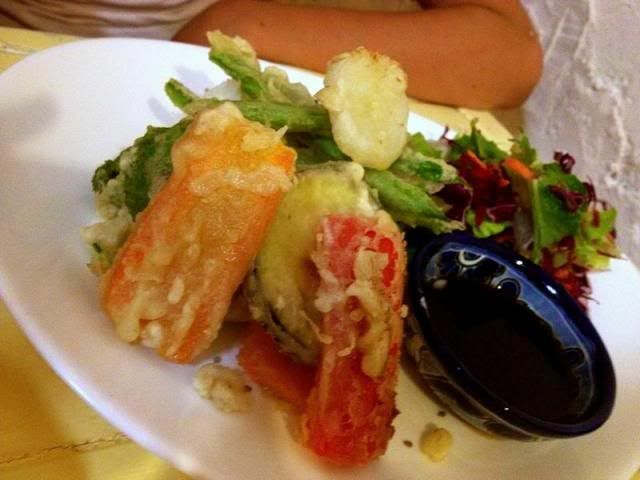 We were certainly not disappointed as the food was delicious and service exemplary. From there, we hailed a VERY small cab and, with our luggage piled high on our laps, headed for the huge bus terminal. 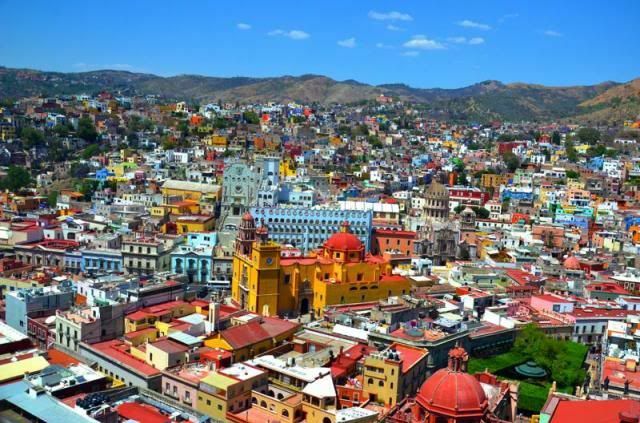 $660 mn and 2 1/2 hours later we arrived in Guanajuato City, grabbed TWO very small cabs and followed the directions to our rental house, Casa Parra. Dylan, the property manager was here to greet us, get us settled in and point us in the right direction for a nice dinner. 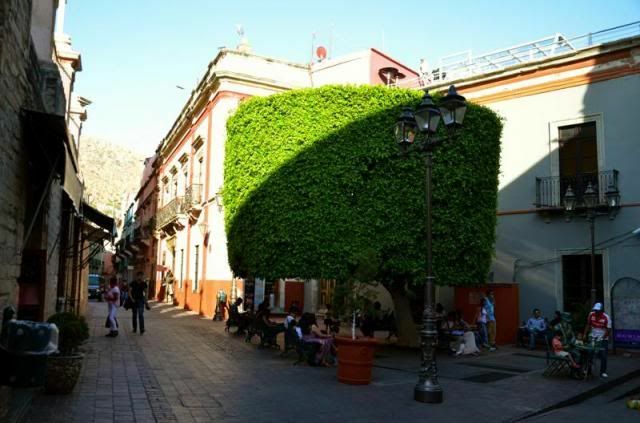 As our vacation rental is located just a few minutes walk from the Jardin de la Union, that's where we went, making a beeline for Casa Valadez an elegant upscale restaurant located on the square (actually, it's a triangle) and just across from the Teatro Juarez. The area was packed with people. 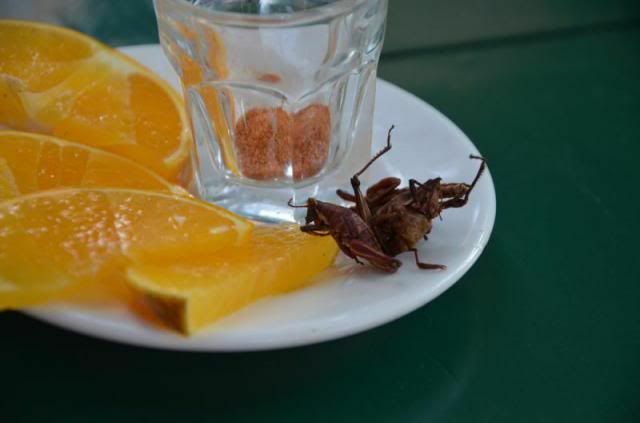 Some, like us where there to dine. 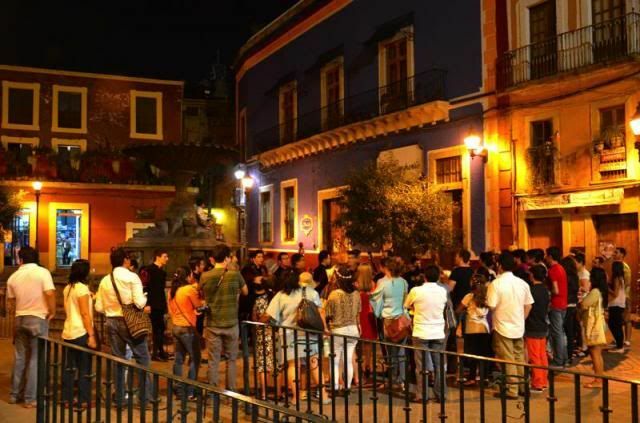 Others strolled through the park, listened to the many musicians playing or getting ready for the walking tours of the city that leave from the Teatro Juarez nightly, showing visitors the highlights of the the centro historico. We were all pretty exhausted after dinner, so we wandered back to the house, made the obligatory Oxxo stop on the way back for morning supplies, unpacked our bags and called it a night. As we had arrived long after nightfall, it's hard to get a feeling for the place. Tomorrow, we will explore a bit further and see what this vibrant city has to offer. 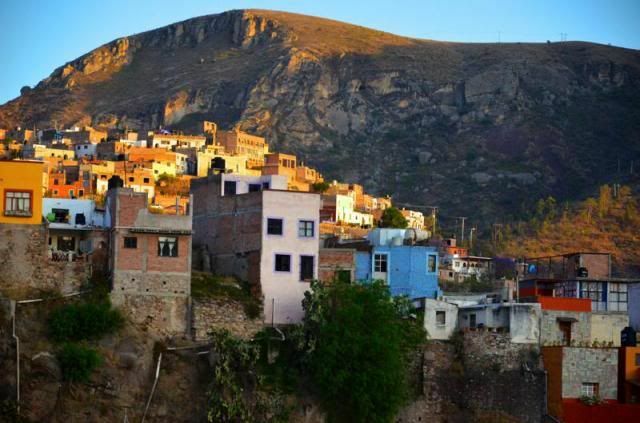 Today, The MEXICO Report, an internationally recognized blog showcasing positive news about Mexico, travel and philanthropy, announced its call for nominations for the 2014 ‘Real Heroes of Mexico' (third edition) awards. The Real Heroes of Mexico project was created in 2012 by Susie Albin-Najera, the creator and editor of The MEXICO Report, an internationally recognized blog showcasing everyday good news about Mexico The project was launched in order to showcase the true champions of Mexico, the unsung heroes in the community and those celebrating Mexican culture through their goodwill efforts, bravery, inspirational stories, sacrifices and hard work. 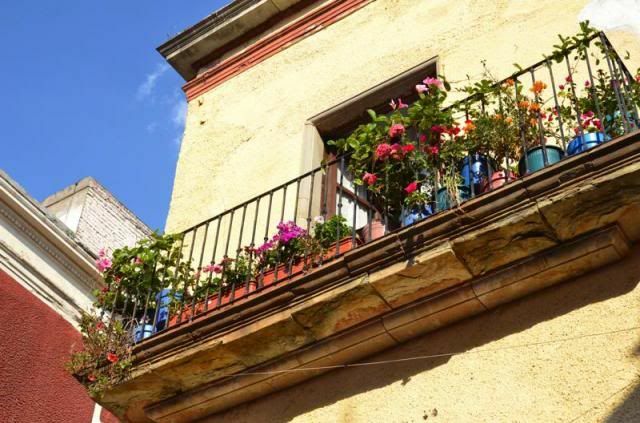 "We are thrilled to launch another year of this program as it has made an important impact on the image of Mexico," says creator Susie Albin-Najera. 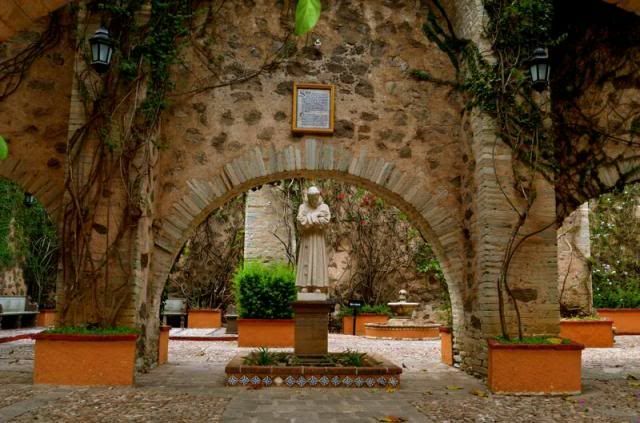 "With this concept, we present current, real, humanitarian efforts taking place throughout Mexico and are able to bring their stories to life, and showcase their valuable efforts." 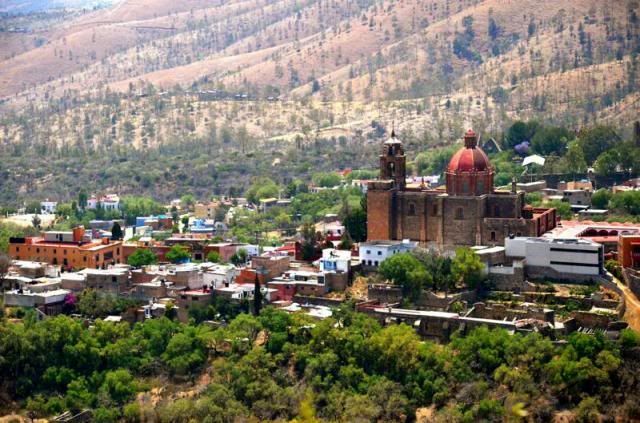 From fundraising and creating healthy eating programs to education and healing the sick in rural communities, this one-of-a-kind effort showcases acts of kindness, achievements, dedication and the inspirational stories taking place in Mexico today. 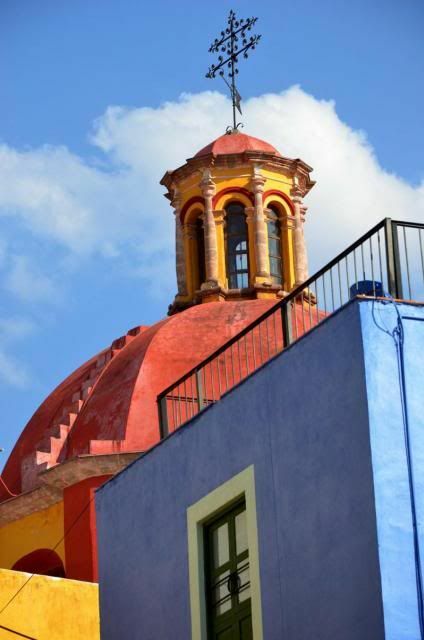 This year, the program will launch with five key ambassadors who have their eye on Mexico. The ambassadors will be instrumental in helping to identify heroes throughout Mexico, however, the nominations are open to everybody. 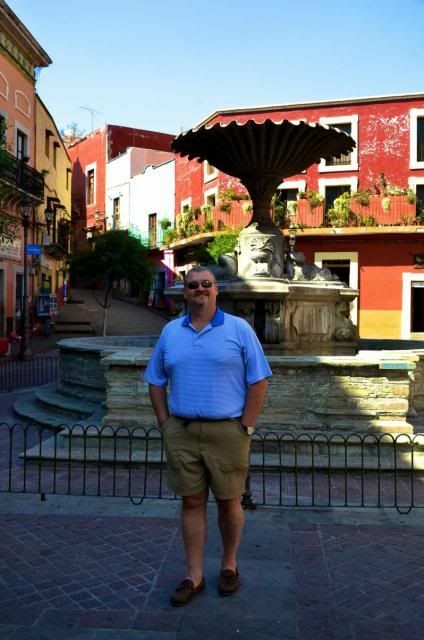 Greg McKinney, a retired, Mexico expat living in San Felipe, with a true love for Mexico travel, beauty and the graciousness of the culture. 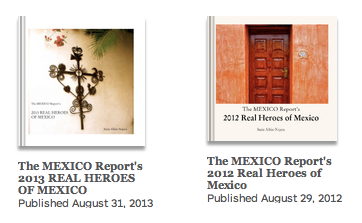 If you would like to become a 2014 Real Heroes of Mexico Ambassador, please email themexicoreport at yahoo.com. 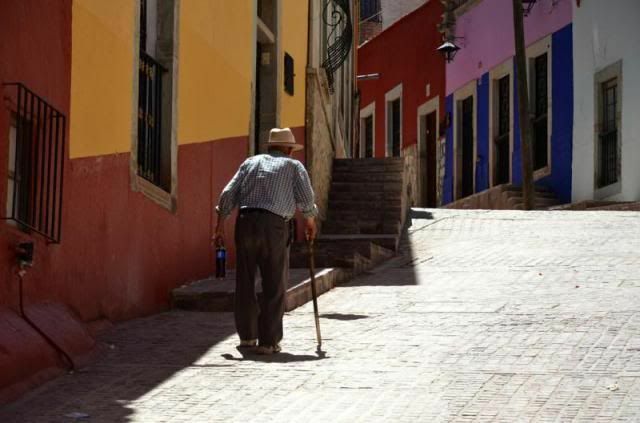 The Real Heroes of Mexico awards were created to showcase the profiles of those making a difference in Mexico and in order to highlight the unsung heroes in the communities. Nominations close May 12. 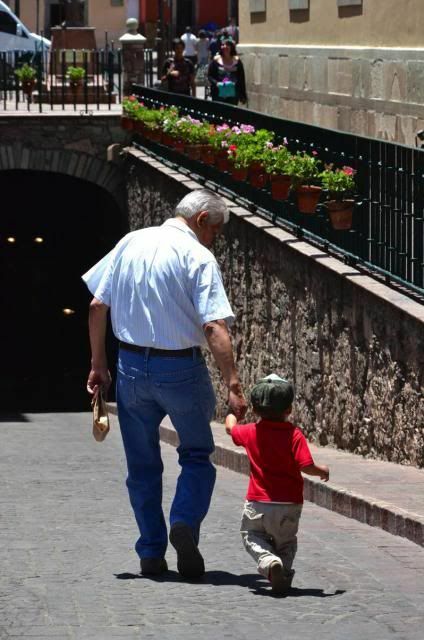 The nomination form for the 2014 Real Heroes of Mexico can be found here. 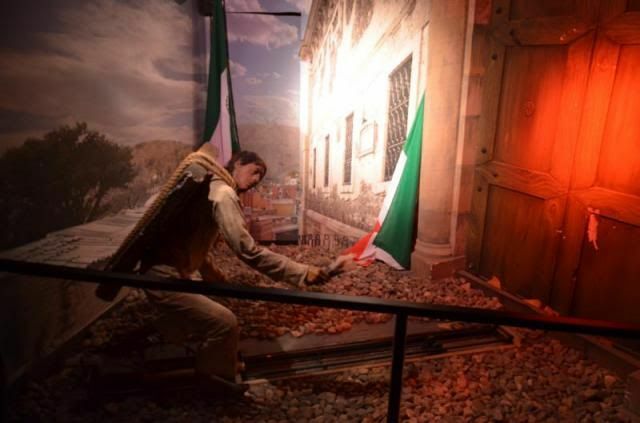 For more information and updates, follow The Mexico Report on Twitter @themexicoreport and #realheroesofmexico. 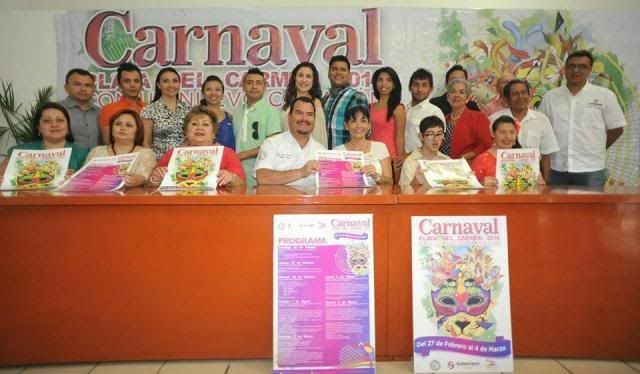 The Municipal President of Solidaridad, Mauricio Gongora Escalante, announced the official 2014 Carnaval celebrations will be held from February 27th through March 4, 2014. 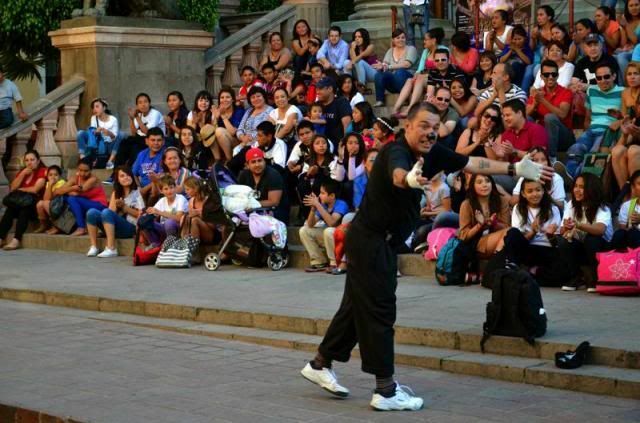 He presented the program of activities for Carnaval 2014 in Playa del Carmen and this year's theme, "With a New Heart". 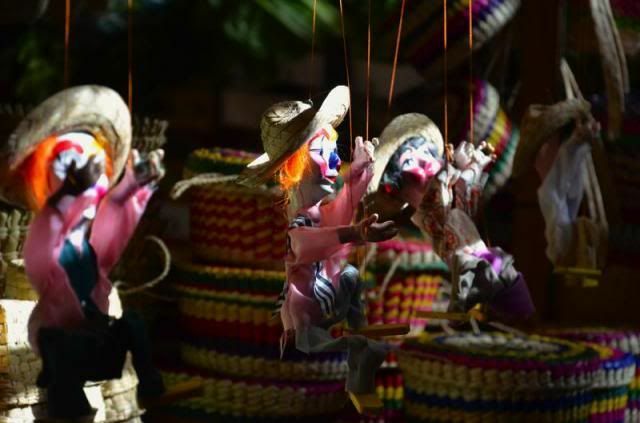 This year's Carnaval festival will be full of surprises and novelties for those who come to enjoy this multicultural festival involving all sectors of the population. 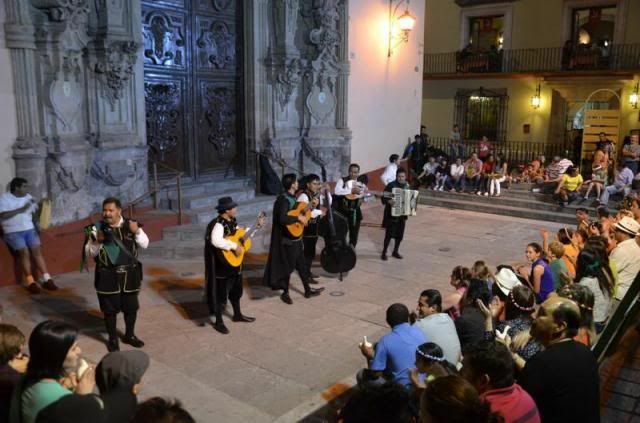 The objectives of this festival are to preserve the foundation and the multicultural richness of the city and awaken the "playense" pride in the hearts of locals and visitors alike. The honorary President of DIF Solidaridad, Cinthya Osorio de Góngora, ensured that the Carnaval 2014 will have an excellent organization and she publically thanked the Standing Committee of Traditional Celebrations for their dedication and participation in planning this much-anticipated event. Sra. Gongora also emphasized that in keeping with the this Municipal leader's policy of an inclusive Government, this edition of the Carnaval will for the first time include the coronation of a Carnaval King and Queen with special needs. 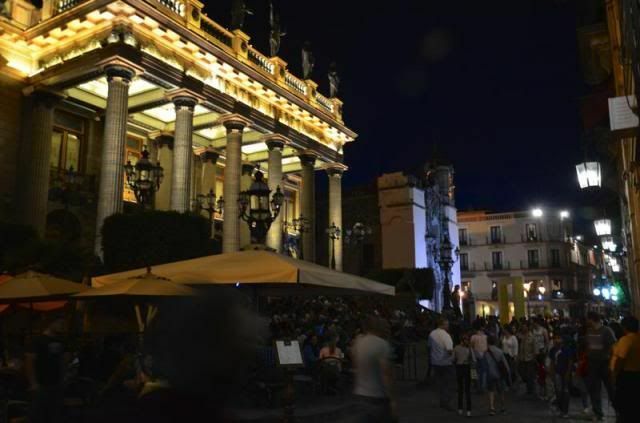 With the exception of the parades, all of the special Carnaval events will be presented in the Plaza 28 de Julio in front of the Palacio Municipal on Av. 20. Thursday, February 27 the presentation of the candidates for Carnaval Royal Court and their parades will take place. 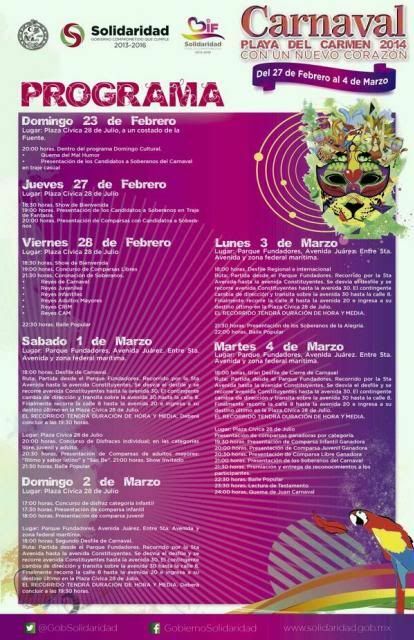 The judging of the Carnaval floats and krew along with the coronation of all of the categories of Kings and Queens of Carnival will follow on Friday, February 28. 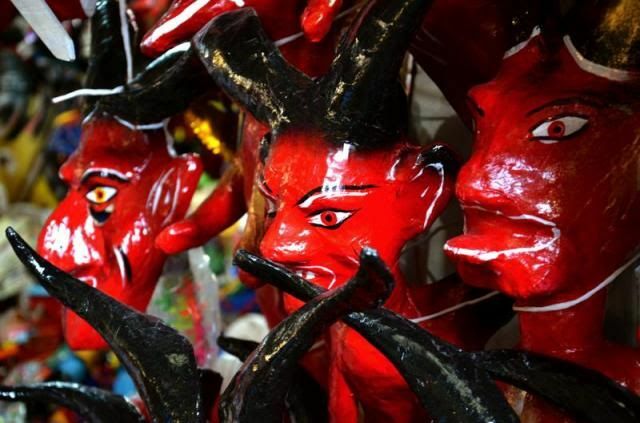 Saturday, March 1 marks the first gala parade of Carnaval. 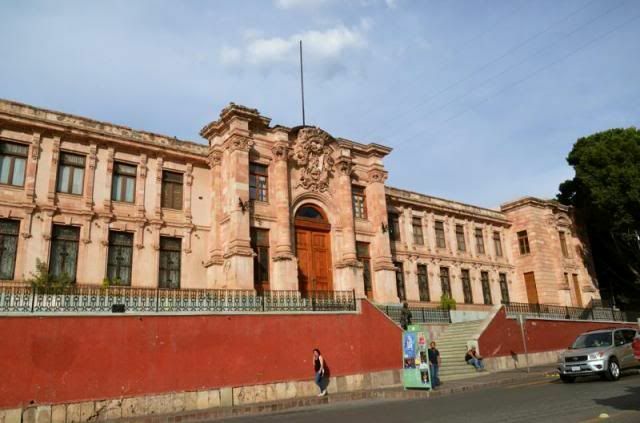 Lasting an hour and a half, the parade will leave from the Parque Fundadores and travel the length of 5th Avenue to Constituyentes Avenue. The parade can also be viewed on Constituyentes from La Quinta to Av. 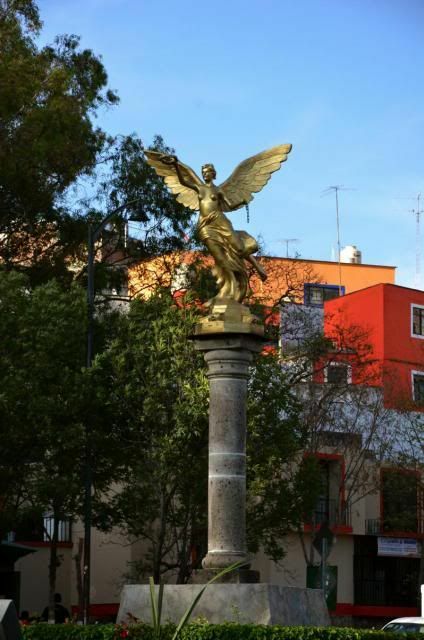 30, along Avenue 30 to calle 8 and from there, all the way to the final destination at the Plaza 28 Julio.